"My aunt of 83-years-old just passed away. 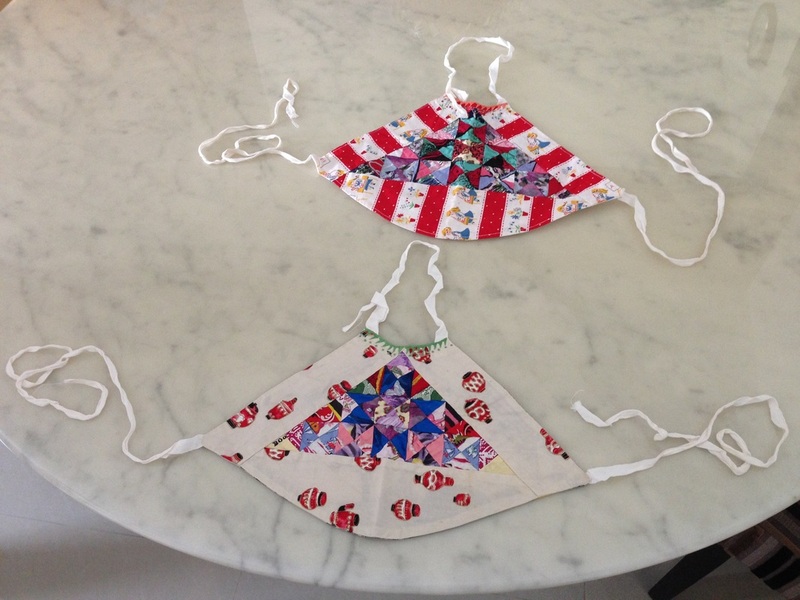 She loved working with her hands, and made numerous hand-crafted bags, pouches, beaded work, and a variety of arts and craft. 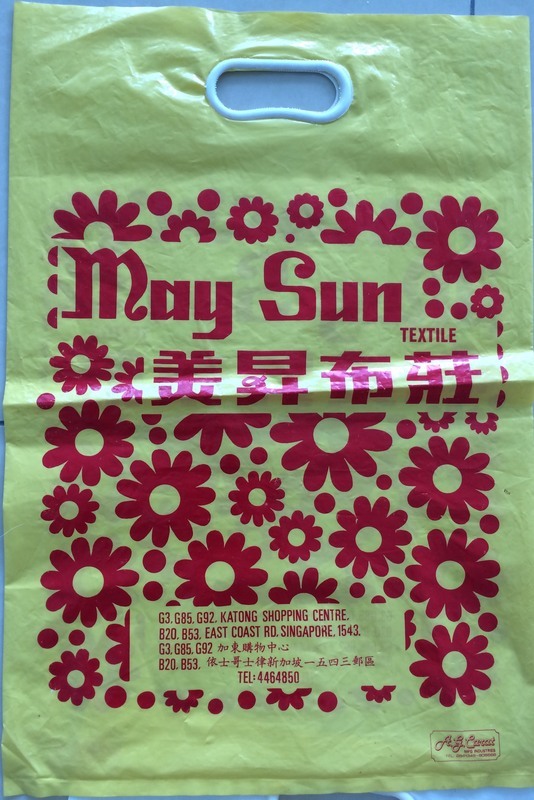 She left behind unused lengths of unique fabrics and prints she had bought from shops, back when textiles shops were mushrooming in the 1960s, and flourishing in the heyday of Singapore's textile trade in the 1970s to 1980s. 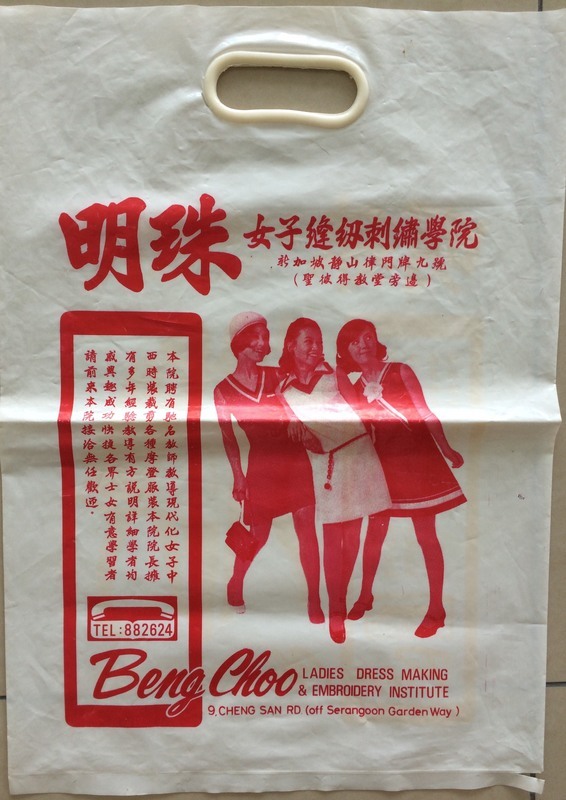 The textiles came in plastic bags, bearing addresses of old textile shops in Singapore back then. 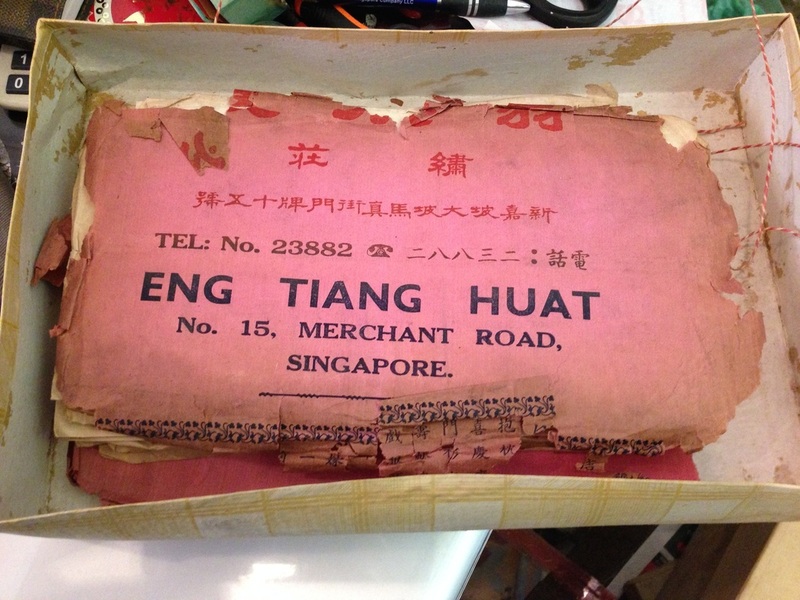 The addresses themselves give us a glimpse into Singapore's textile history, and subsequent rise and expansion, in entrepot trade." "In the 1950s, cigarettes were not sold in cardboard boxes. People could buy individual sticks off the shelf, from round metal boxes. 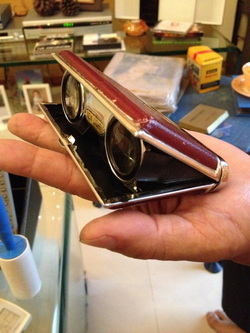 Cigarettes were also packed in metal boxes like the one shown in the above photo. I kept two of these boxes as souvenirs." 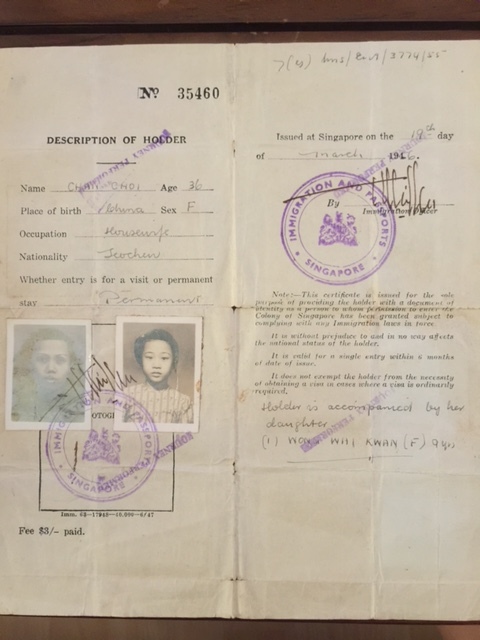 "My late mother and elder sister arrived in Singapore from Hong Kong in the early '50s. My late father and late mother decided to migrate to Singapore because my father was a sailor and his vessel would make regular stopovers in Singapore, making it an inconvenience for him to return to Hong Kong. 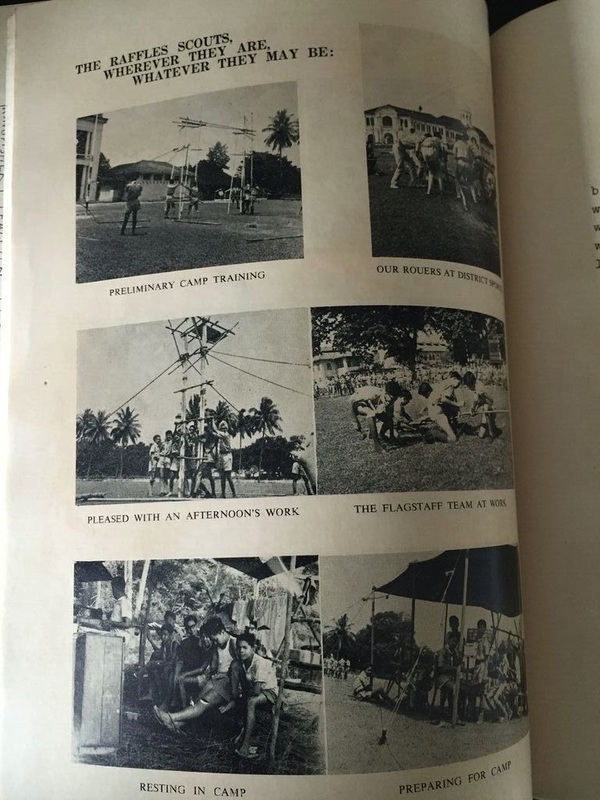 Singapore, back then was part of the Straits Settlement, and the British were then busy fighting the Communists. 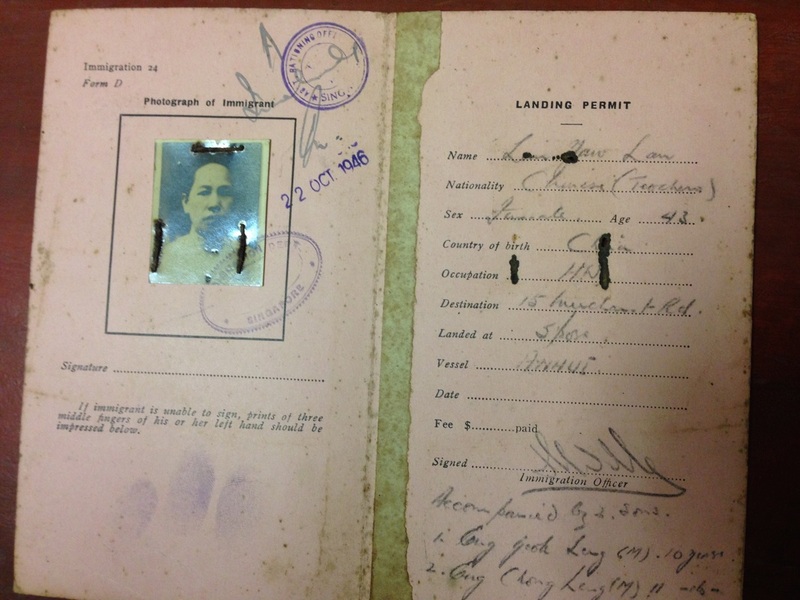 As a result, newly landed immigrants were required to register their identities with the local Government." "This is a beautiful 19th century Chinese blue and white opium pillow from the late Qing Dynasty. A smoker would lay on the floor or smoking platform, resting his head on the pillow. This pillow has an open-work 'cash' motif design at one end. The other end has an aperture to permit items to be stored safely inside, typically the wallet of the smoker. This pillow is decorated on four sides with a quatrefoil cartouche enclosing a pair of lion dogs playing with yarn on all four sides, surrounded by a blossom decoration and key pattern borders. 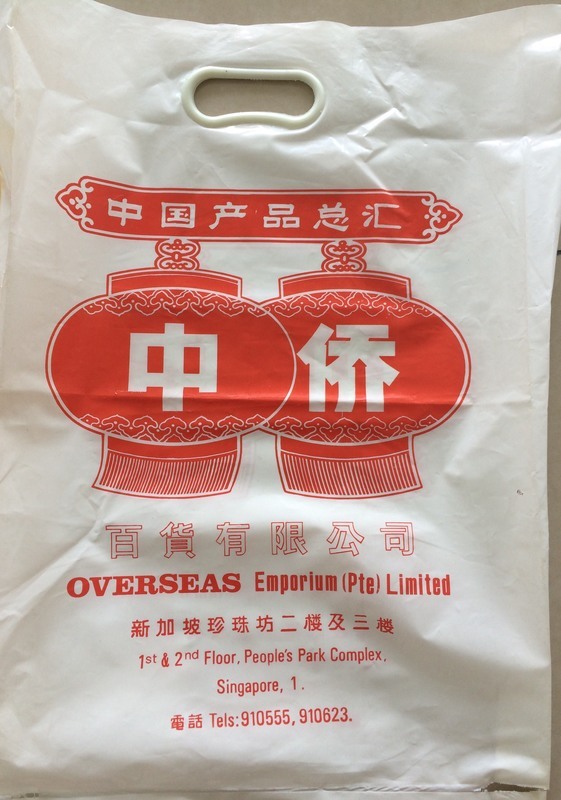 had brought it along with him when he and my mother emigrated from a Teochew district near Shantou in the 1930s or that he had bought it in Singapore. 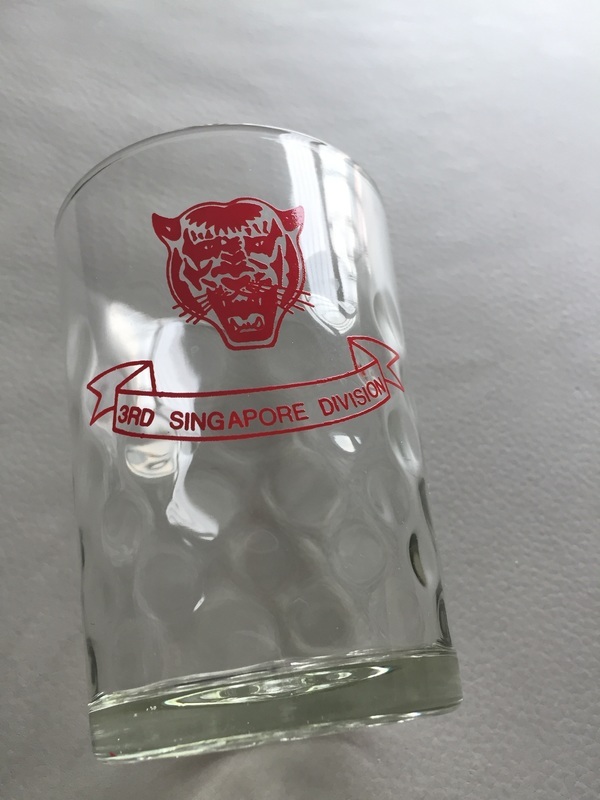 My father passed away in his 50s in 1962.​"
​"When Singapore marked its 25th birthday in 1985 (it was the year of the boar), I bought these. 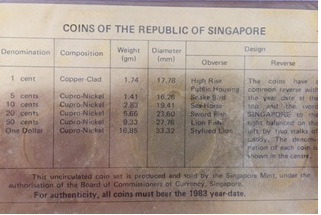 The Singapore Mint rolled out a complete set of Singapore coins, from one cent to a one-dollar coin. 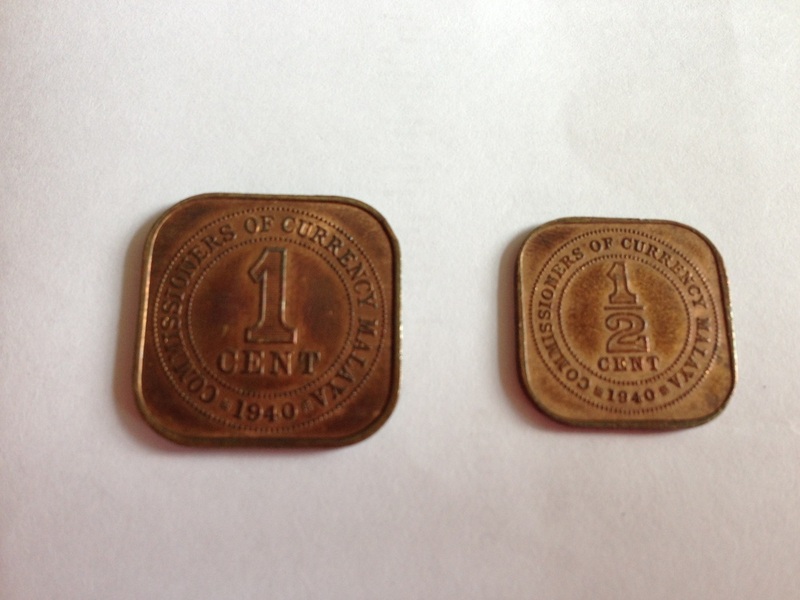 A brief description of the metal contents for each coin were also written." 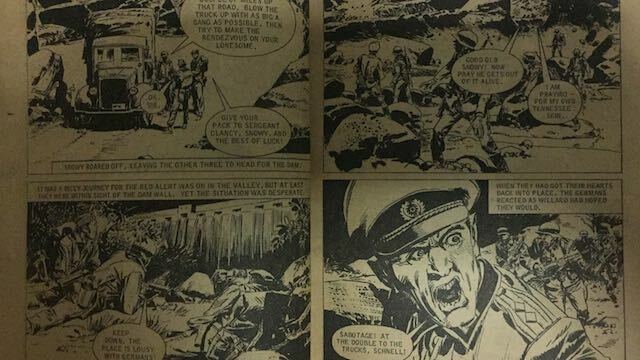 "I was clearing my storeroom of some old stuff in September when I stumbled upon a pile of old comic books about WWII combat adventures. 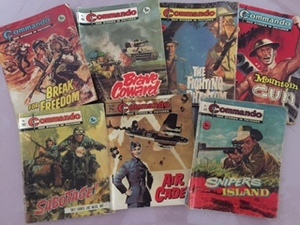 It immediately brought back memories of my good old secondary school days (between 1970 and 1974) where I saved my pocket money to buy these secondhand comic books. I think I have about 80 of these books and if you look in the inside, the pages are all black and white (as seen above). 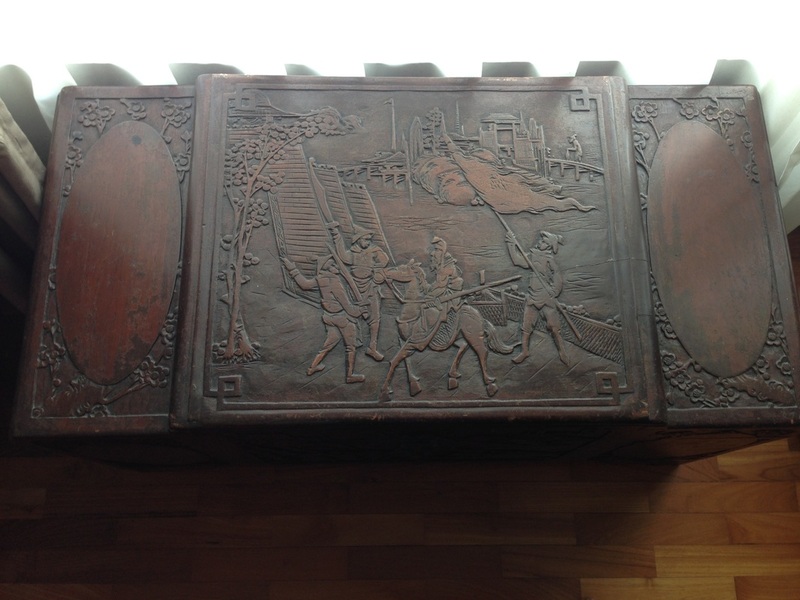 I have decided to put them into a camphor wood chest for storage." "These old computer games were developed way before the time of Internet cafés or LAN shops. With the opening of the Internet age, these standalone games were made obsolete. I have around six or seven of them and they are mostly on floppy disk format. 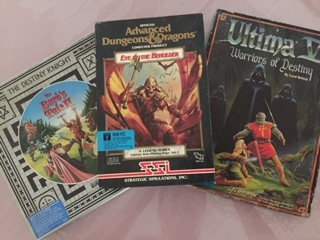 When I saw these games I recalled the fond memories while studying overseas. I have kept them for sentimental reasons and also that the software is still good." 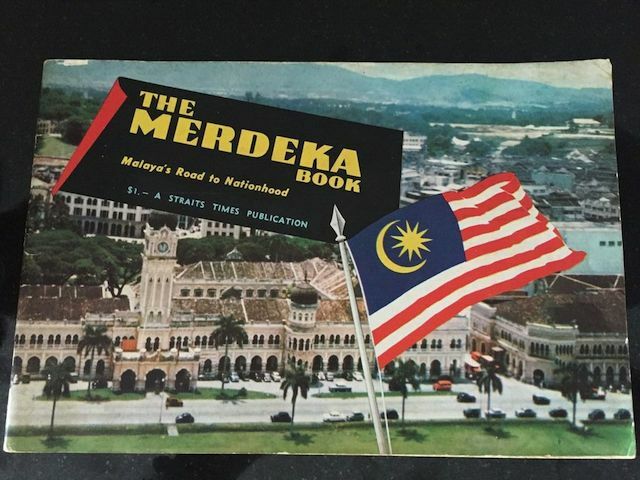 "Many of us may not be aware that about 50 years ago there was a need to have a restricted passport for entry into West Malaysia. This practice was terminated in the mid-1980s. 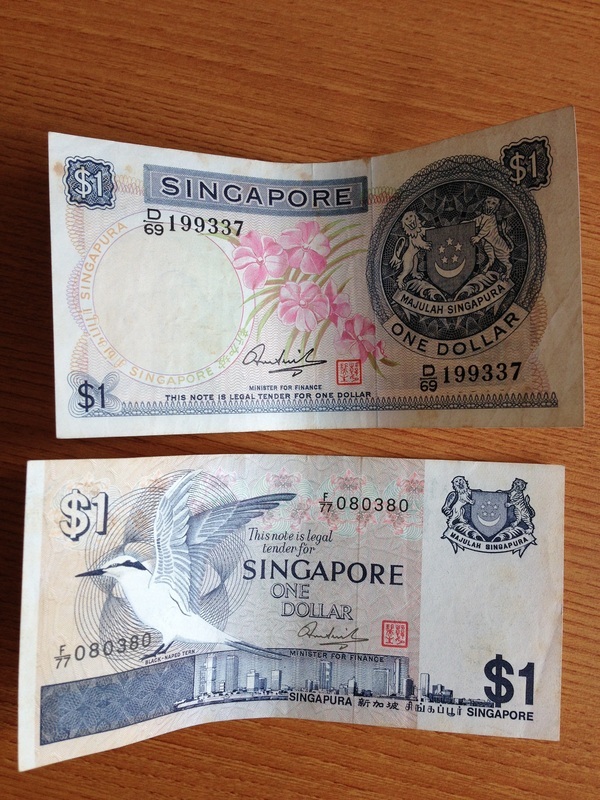 The fee was S$5 at the initial years and was raised to S$7.50. Travelling to West Malaysia then, to Malacca, Kuala Lumpur and Penang were luxuries. 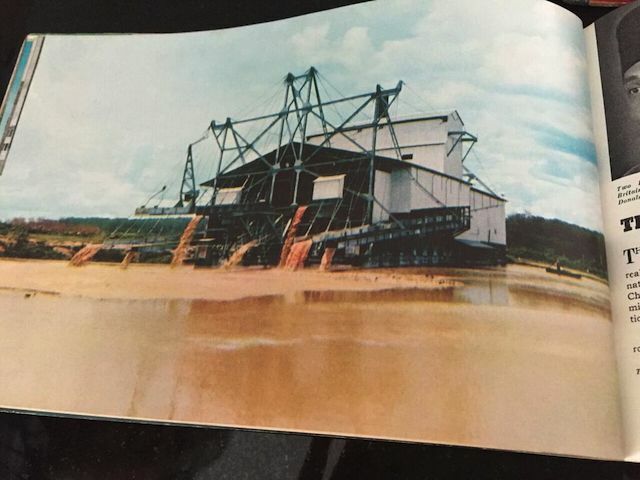 There was no North-South highway, and travelling by the old trunk road and trying to overtake the slow timber trucks was hazardous." “This pounder came from my mother, who lived up to 99 years old (six months to 100 years old). 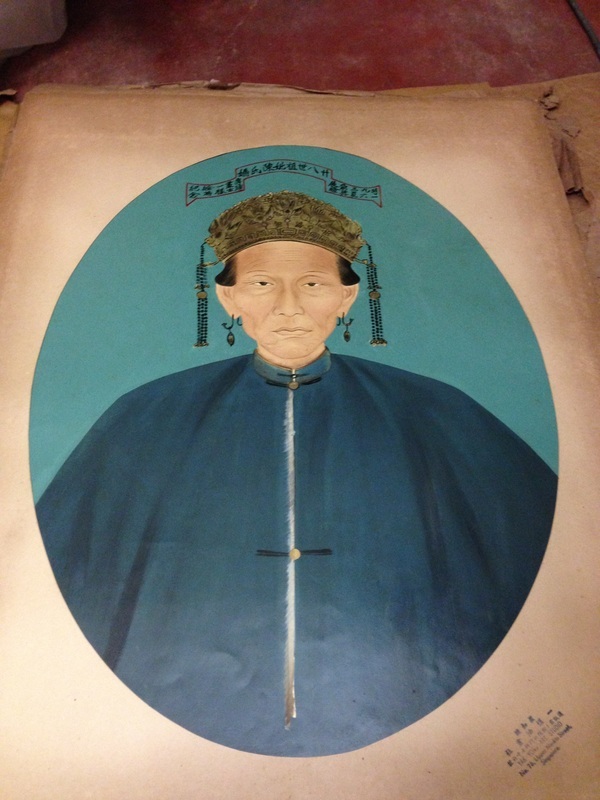 My ah mak (in Hakka, it means mother) as I call her was from China and then lived in Kuala Lumpur for over 50 years. She came to KL when she was 25 or 26 years old as someone brought her in by ship. She had no cabin on the ship and she stayed in the lower deck as she couldn’t afford it. 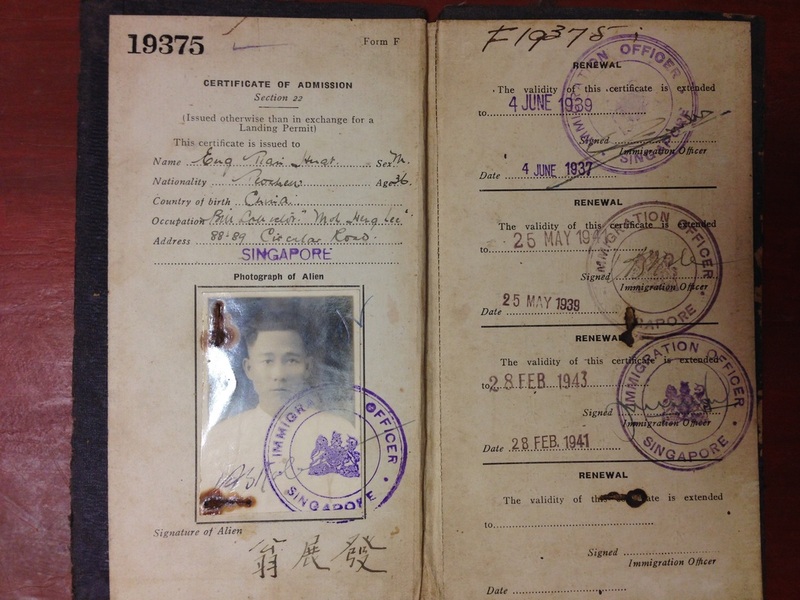 She had to come to Singapore for quarantine at St John Island (as at that time we were under the British). 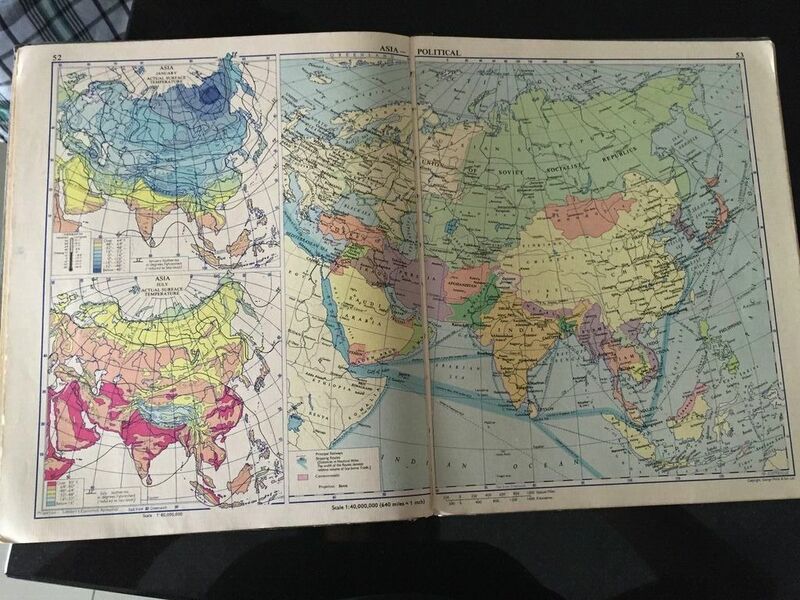 "I used this atlas when we studied geography in primary school. I must say that the school then gave us world views. 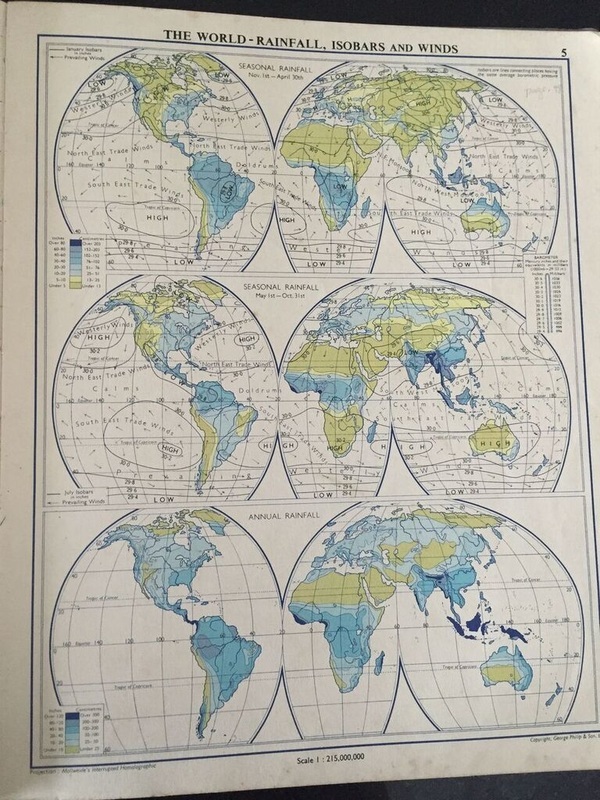 We used the maps in the atlas to understand rainfall and wind patterns across the world. Other relief patterns, mountain features and vegetations, deserts, etc, were taught in primary school. 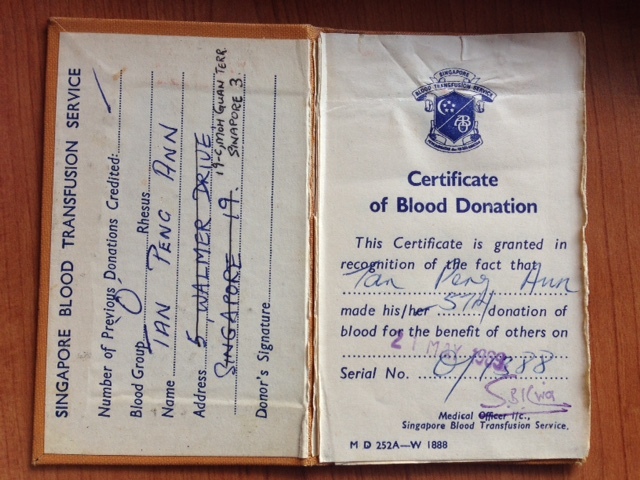 I attended primary school between 1956 and 1960. We skipped Primary 3 because there wasn’t enough classrooms, we were told." 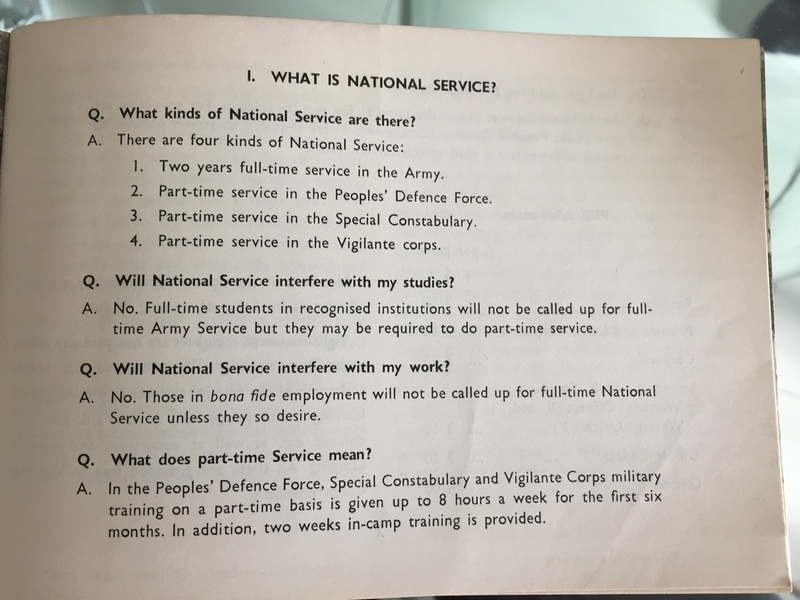 "This was the first National Service Handbook with was issued in 1967, which is given to all the recruits. It details what the responsibilities as an NS man, privileges, etc. I felt I should keep it. "Toothbrushes were invented by the Chinese in probably the '30s. These are the earliest I could get a hold of. 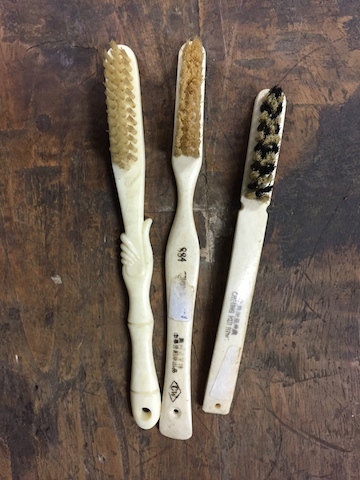 Animal hair were used the early days for toothbrushes. 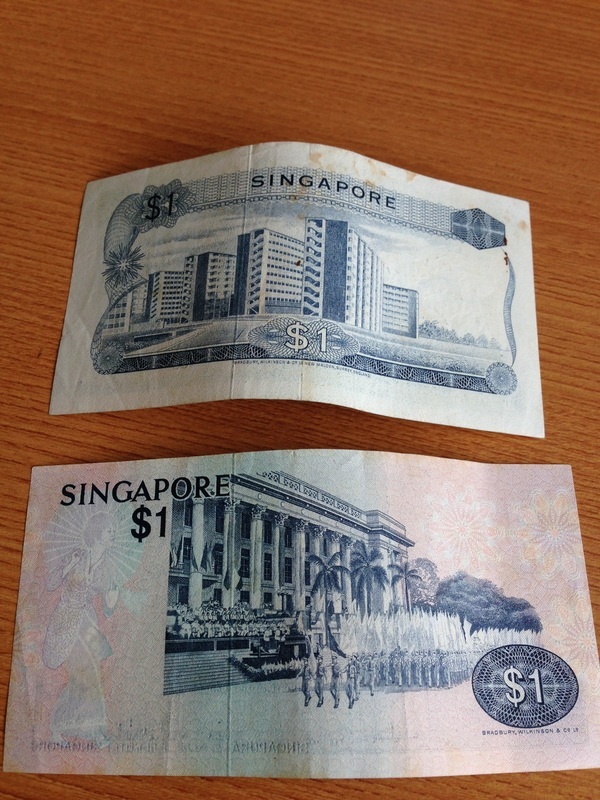 I bought these for S$15 each." 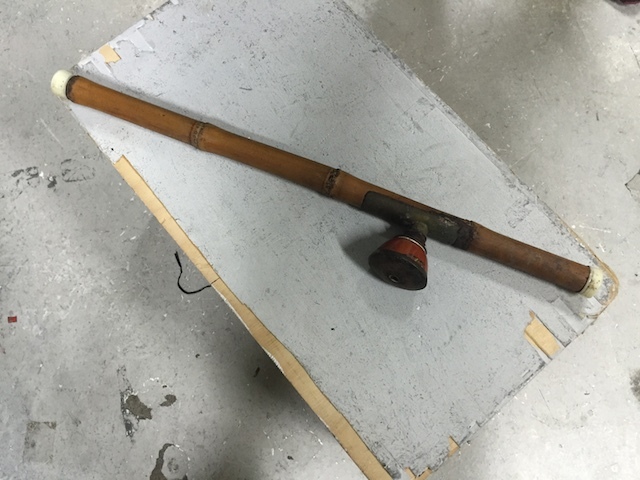 “This is an opium pipe from the 1940s. Opium would be placed in the little opening on the side, which touches a glass burner, and then the user would smoke. Back in the old days, I saw pictures that people would lie down together and share the pipe. There were a lot of police raids in the middle of the night to capture the opium maker and smoker, and place them in jail in the 50s and 60s. "My uncle John Hugh Mack (third picture, above) was an orphan who was adopted by my grandmother. 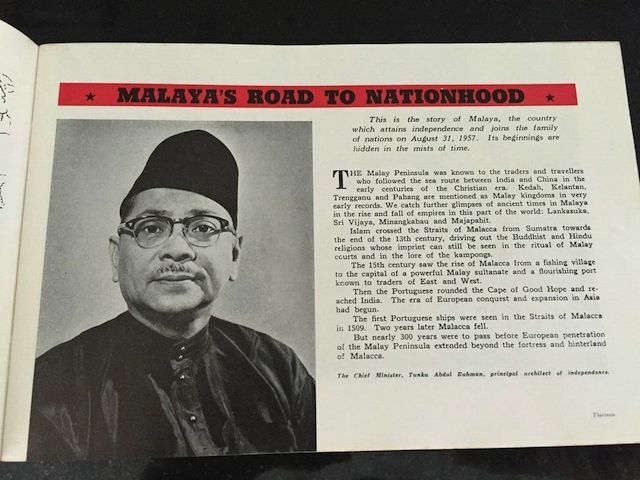 He was born in Penang and his real father was a Scotsman doing business in Penang, while his mother was Chinese. 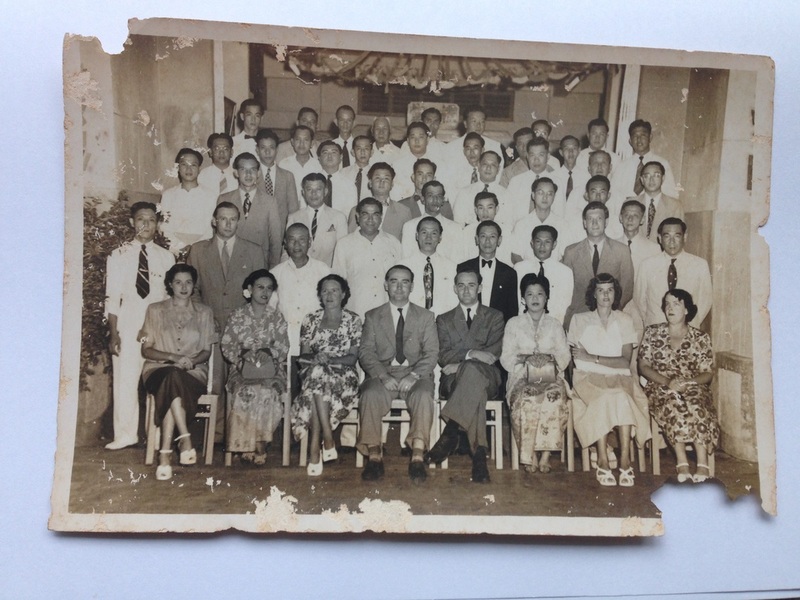 When the Japanese War broke out in December 1941, my older brother George and I were living in Kuala Lipis, Pahang, where my mother was a nurse, and we went to stay at the family home in Kuala Lumpur with Uncle John, two aunts and my grandmother. My father was teaching in Muar, Johor, at that time. 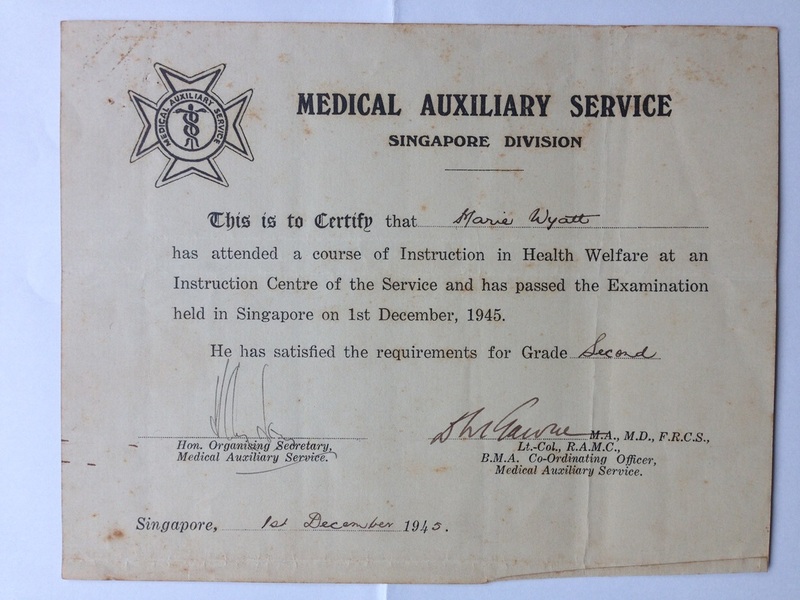 As the Japanese Army advanced rapidly down the peninsular, the whole family including my father evacuated to Singapore arriving in the colony by mid-January 1942. 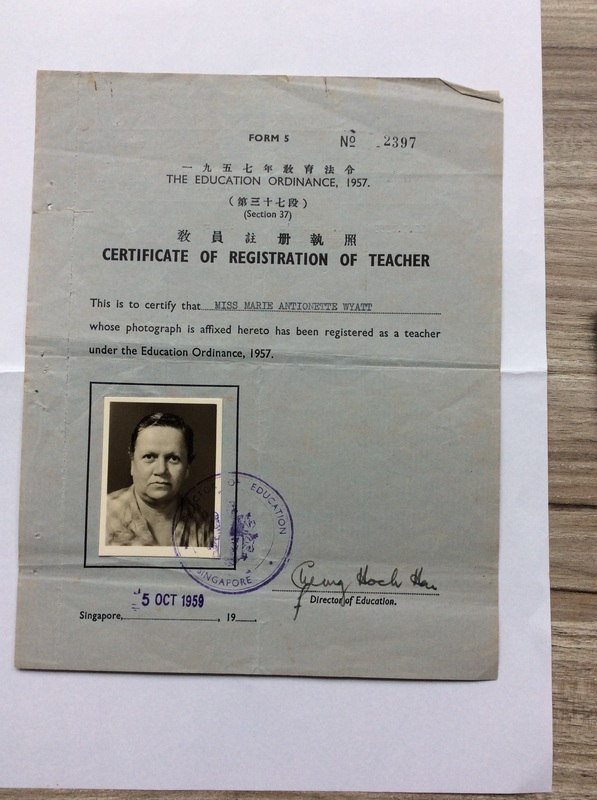 At the end of the War on August 1945, my father who had initially been with us went back to Malaya as he was a Government schoolteacher. My mother was killed in the War. The rest of the family stayed on in Singapore. 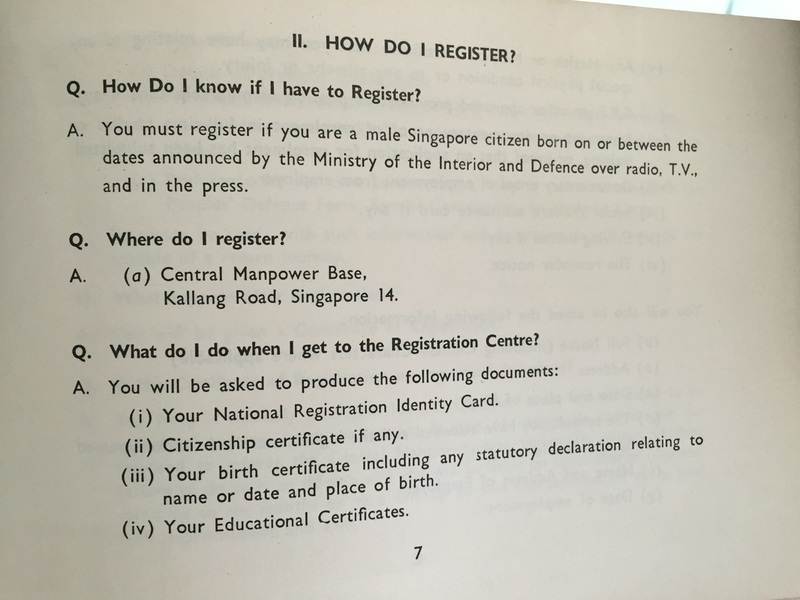 Soon after the War ended, Uncle John got a job as a clerk with Navy, Army and Air Force Institutes (NAAFI) (an organisation created by the British government to run recreational establishments needed by the British Armed Forces, and to sell goods to servicemen and their families) in 1946. 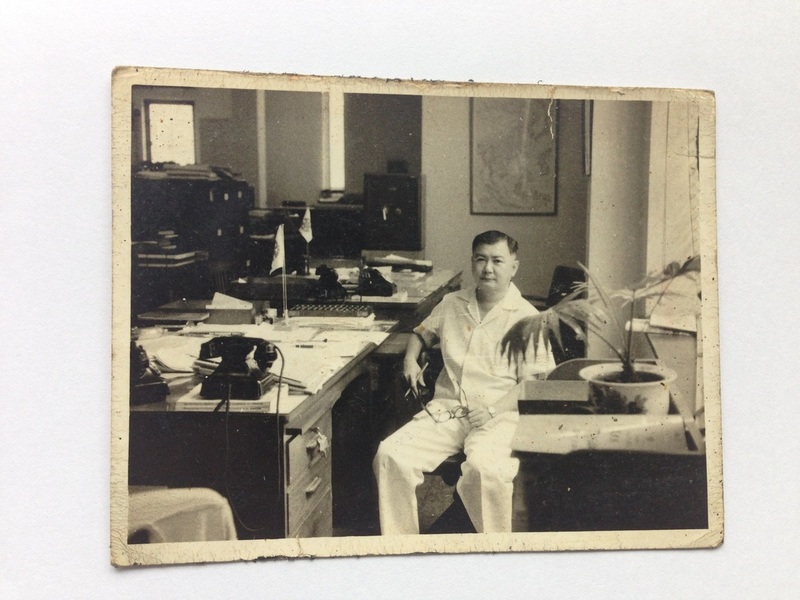 Around 1950, he then got a job at Boustead & Co and remained there till be retired as a financial clerk. 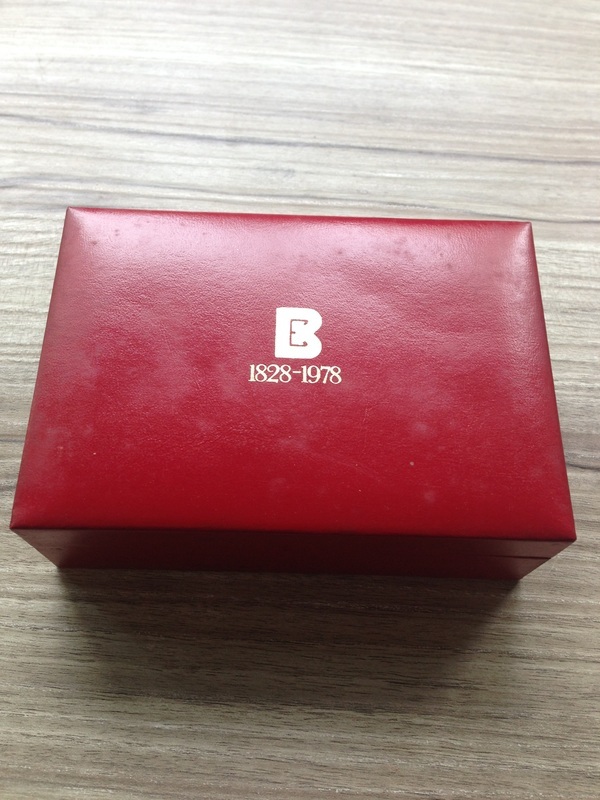 He was a loyal staff and on the occasion of the company's 150th anniversary, he was given this gold-plated souvenir (which has its own box (second picture)) (fourth picture is Boustead employees at the time). 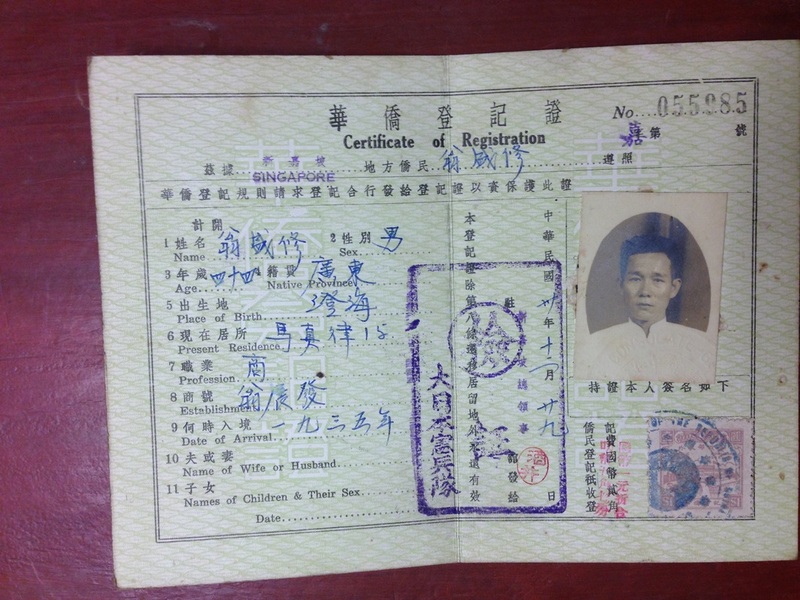 He lived with me in Tiong Bahru until he died in 1995 at the age of 78. 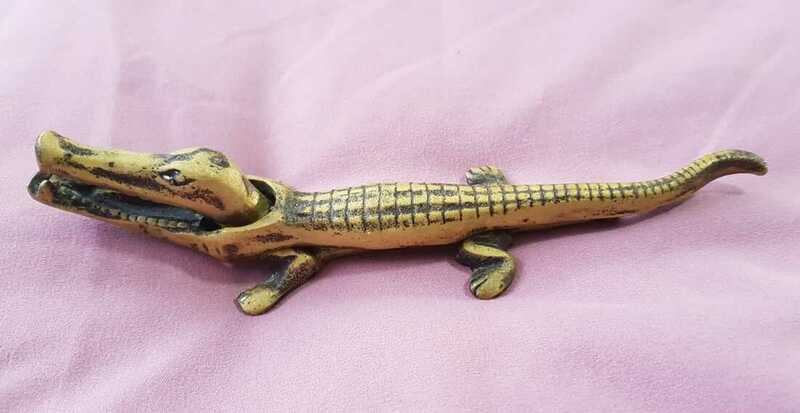 I inherited whatever he left behind as he never got married but I kept this particular item as it is historical and also, not many people would have it. He led a frugal life and had nothing fancy. He was also a voracious reader, reading three books in one week when he retired." 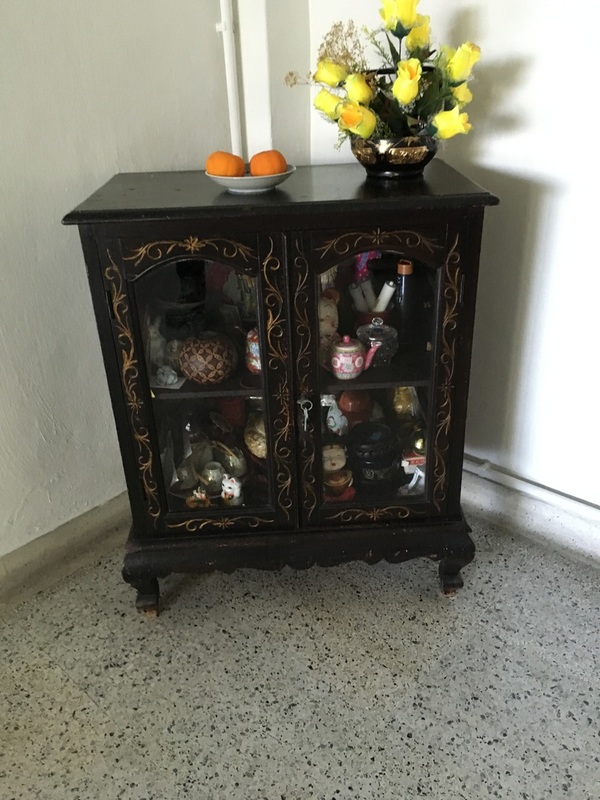 "My sister-in-law was going back to Hong Kong and didn't want to take this chest back with her so she gave it to me in the late '50s. 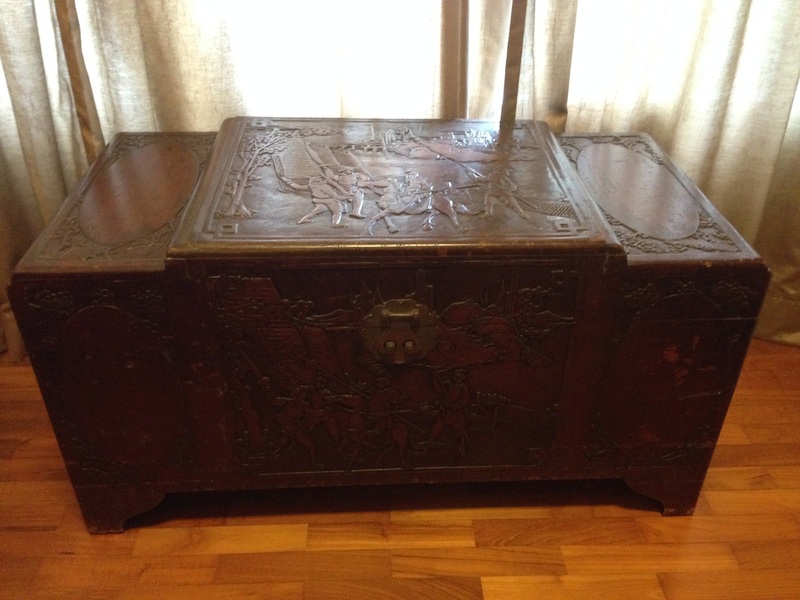 It is meant to store clothing and it is made of camphor wood to keep the clothes free of moth and insect damage. I use it now to store things. Usually a mother would buy one for her daughter who gets married but I already had this one so my mother didn't have to get me one. The chest is from Hong Kong. 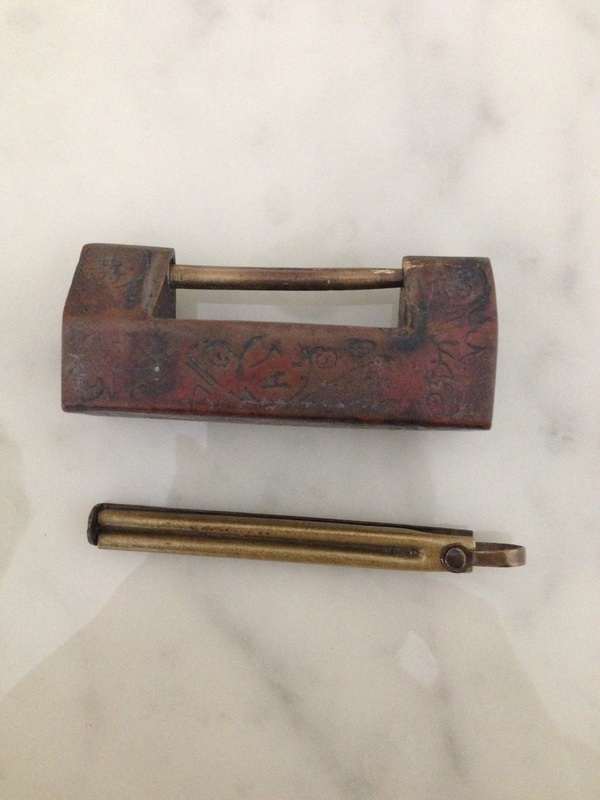 It also came with the old-fashioned lock and key (which folds)." 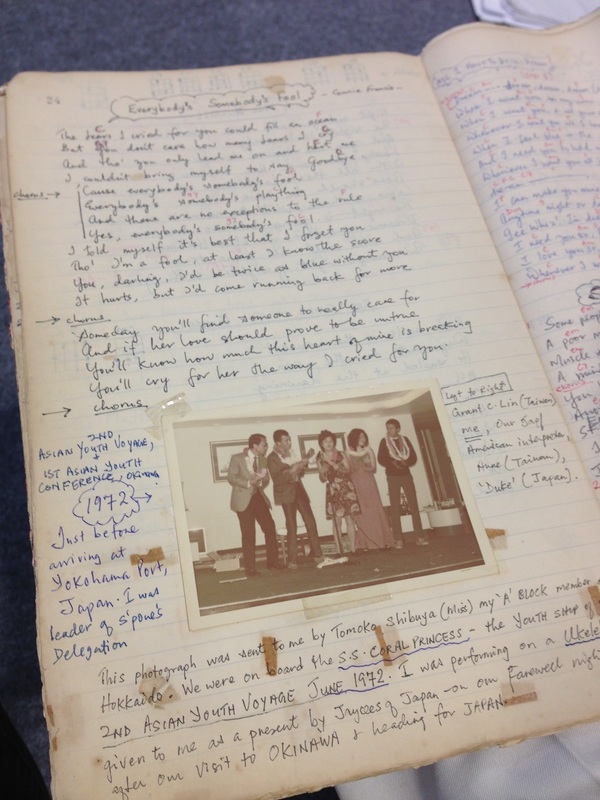 "I have had this songbook since the 1960 and I bring it along with me wherever I go to play the ukulele. 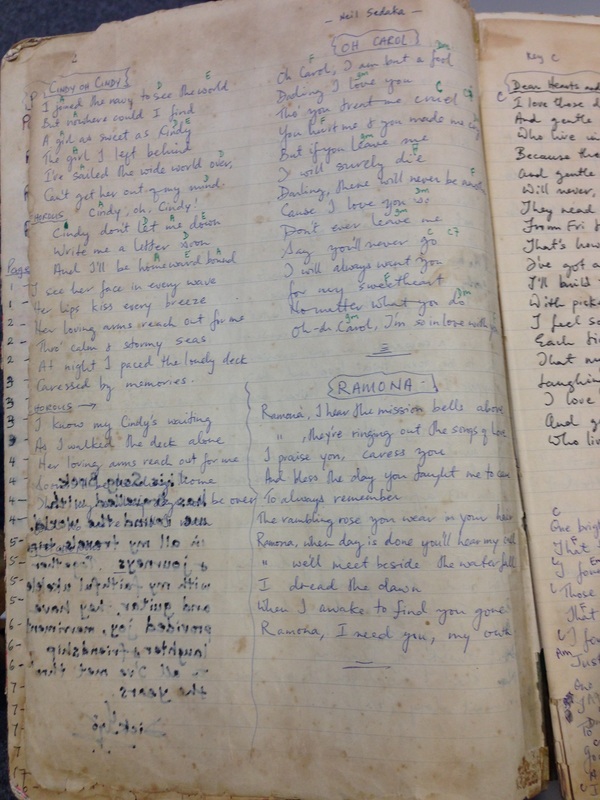 In the book, there are two very special songs, which traces back to me winning the Geylang English School PTA Talentime competition in December 1960. My Primary 6 A form teacher who was also my Scout Master back then was Mr Cheong Cheng Swee. He knew I loved to sing however, I couldn't play an instrument. He requested me to take part in the end of year School Talentime – he would accompany me on the guitar while I sang. I was very gung-ho at the time and said ok. He chose two songs for me to sing – 'Ramona' in the qualifying round and 'Melodie D'Amour' for the finals. This was the first time I had taken part in such a contest as a 12-year-old kid. I won the first prize. Both songs are in my songbook. When I taught myself the ukulele in 1963, I also included my hand-drawn chord diagrams in the book. 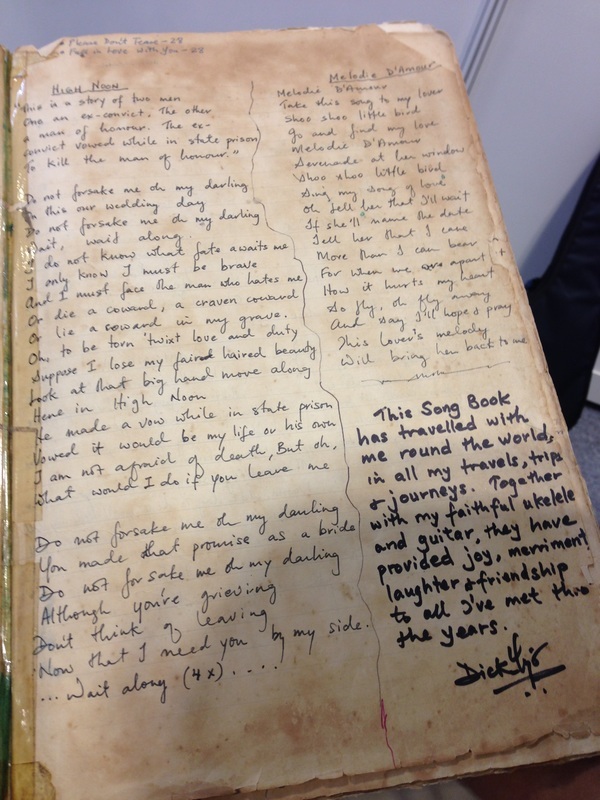 I slowly built up different songs in the book – songs I like as well as songs I think people like. I have songs from the 1960s like 'Sixteen Candles', 'Pretend', 'Look for a Star', 'Bimbombay', 'River of No Return' and 'Outsider' to name a few. I would also draw the chord chart for a particular song as a way to learn. If you learn hard, you remember as you put in so much effort. Over the years I have also added songs from the '70s and '80s, pictures of my ukulele journey, songs from movies as well as songs from ASEAN including from Vietnam, Thailand and Philippines. I have at least 400+ songs and there is a contents page for easy reference as I separate the songs according to their genres." 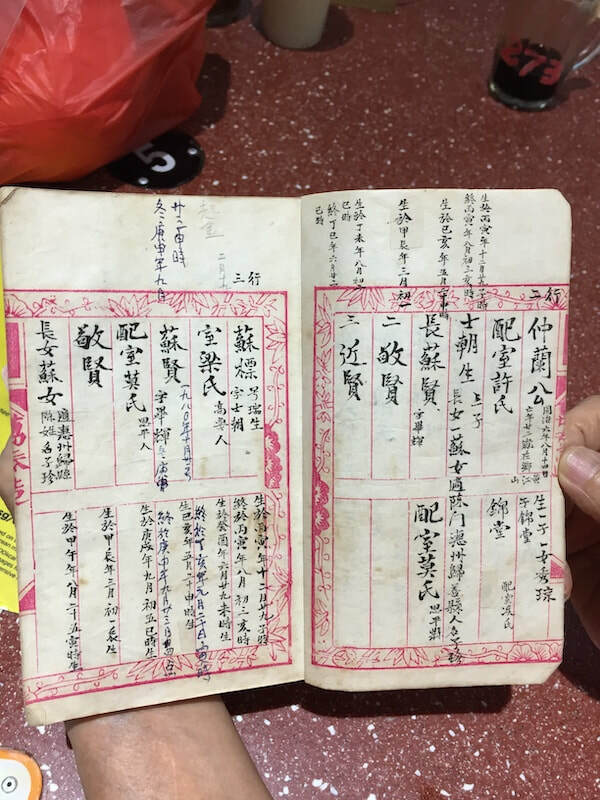 "This was my parents' marriage certificate when they got married in 1956 when my father was 22 years of age and my mother was 20. 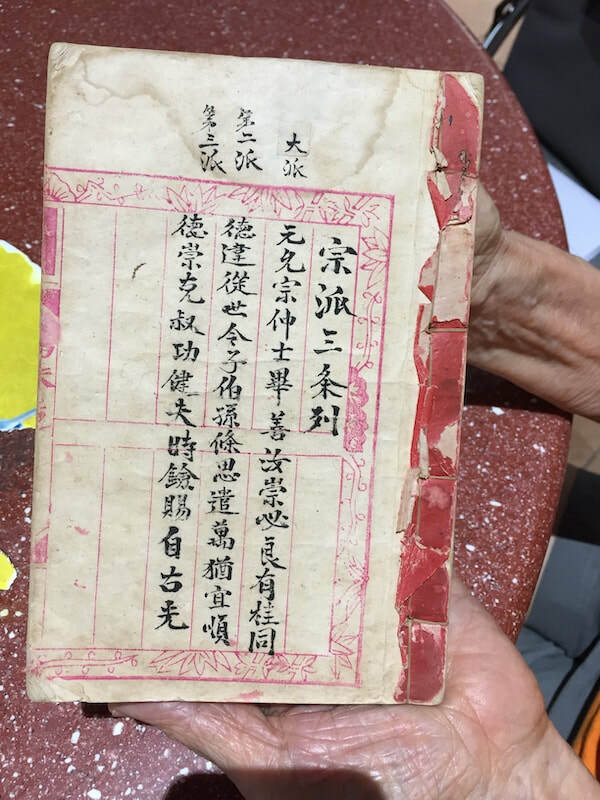 The wedding was held at my grandfather's shophouse at Merchant Road, while the dinner was at Great Southern Hotel or Nan Tian (now Yue Hwa Department Store, Chinatown). 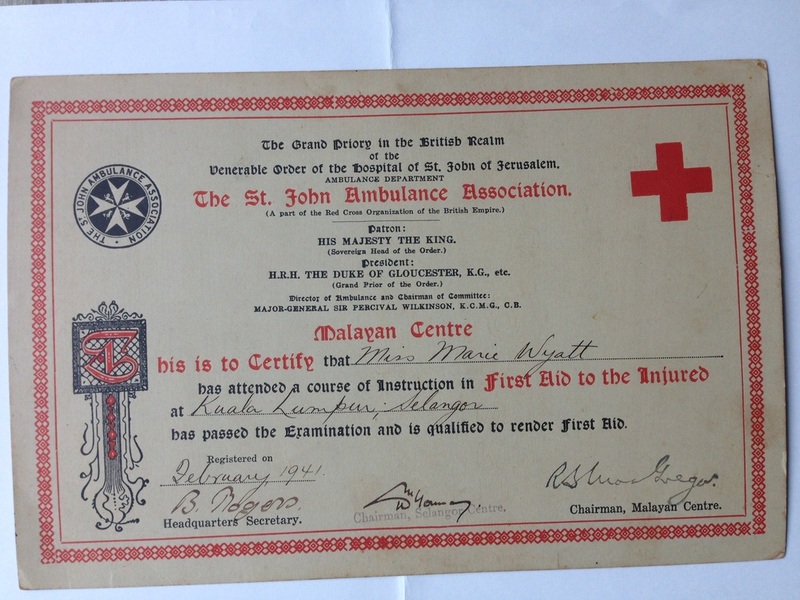 On the certificate, the witness was my grandfather's good friend. 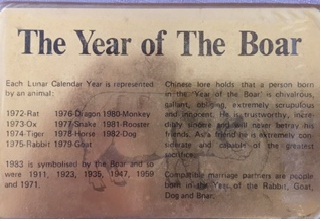 Also, if you notice, the year was written in the Minguo calendar (following the Republic of China calendar). For instance, 104th year of the Republic is the year 2015. It was only in 1912 that they started counting. 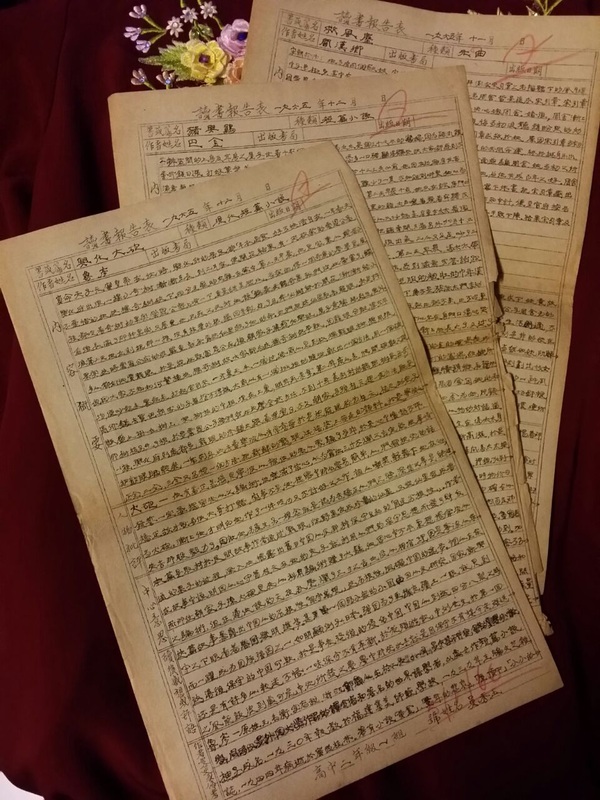 Originally, I found half of the certificate (both husband and wife had their own copies). 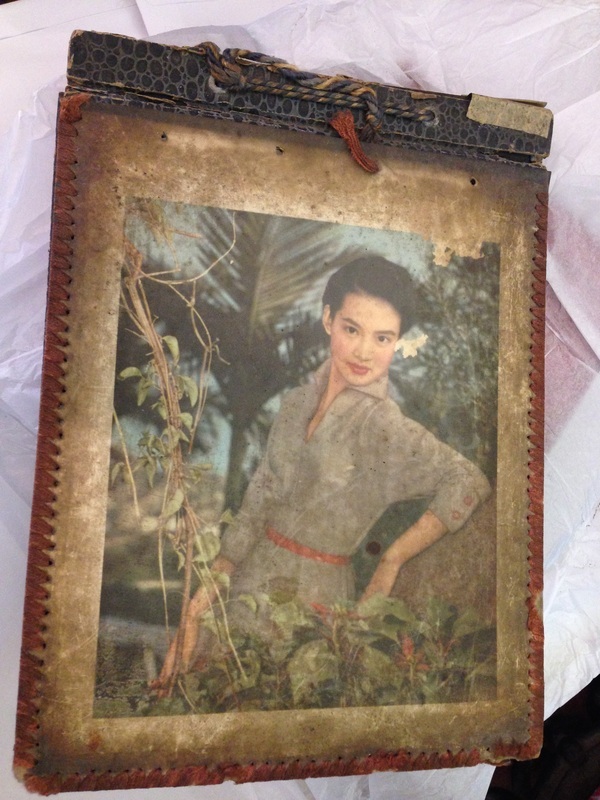 With the termite infestation in my current shophouse, I found this complete one." 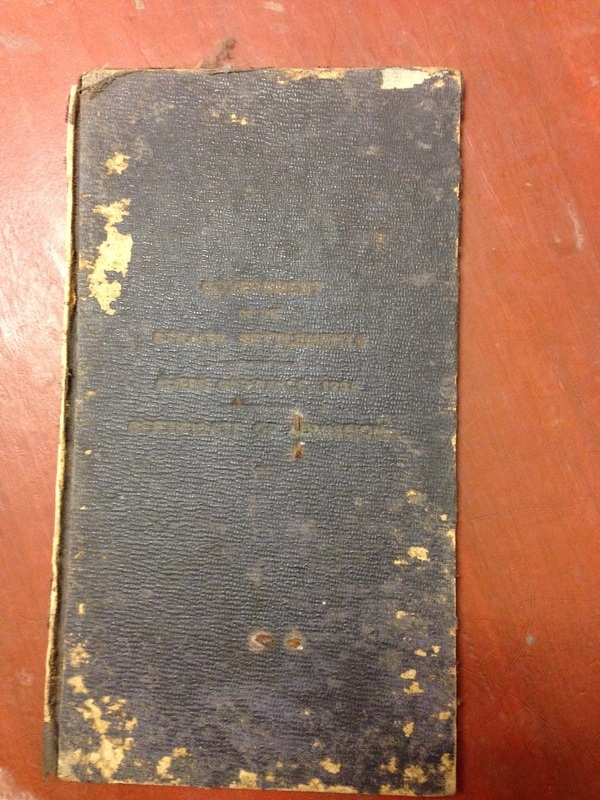 "This was my grandfather's shop catalogue detailing all the items being sold in the shop including costumes, tapestries, religious items and bed linens. It is so customers could see." "This is old wrapping paper from my grandfather's first shop (where he sold tapestries and did some tailoring, and later brought in musical instruments and stage props) at 15 Merchant Rd in the late 1939. 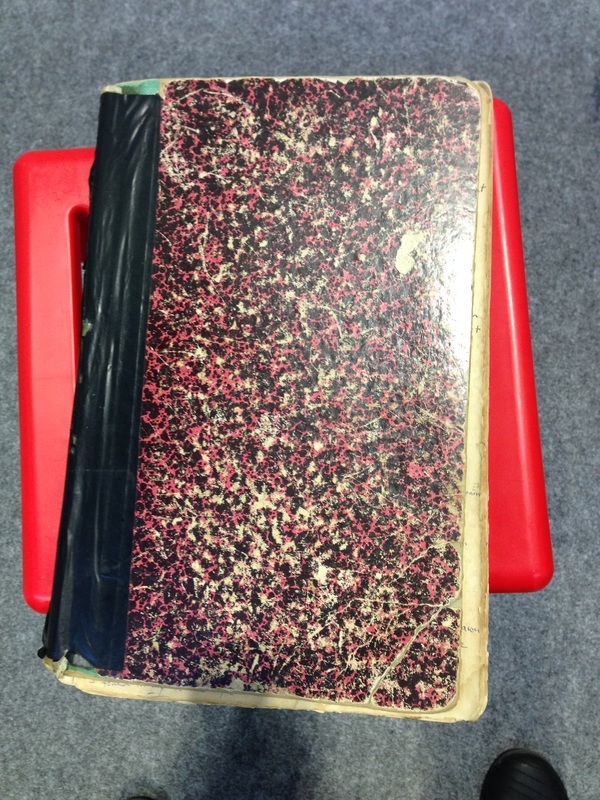 I keep it because it is the first piece of wrapping paper that was made and it relates to grandfather's first shop." 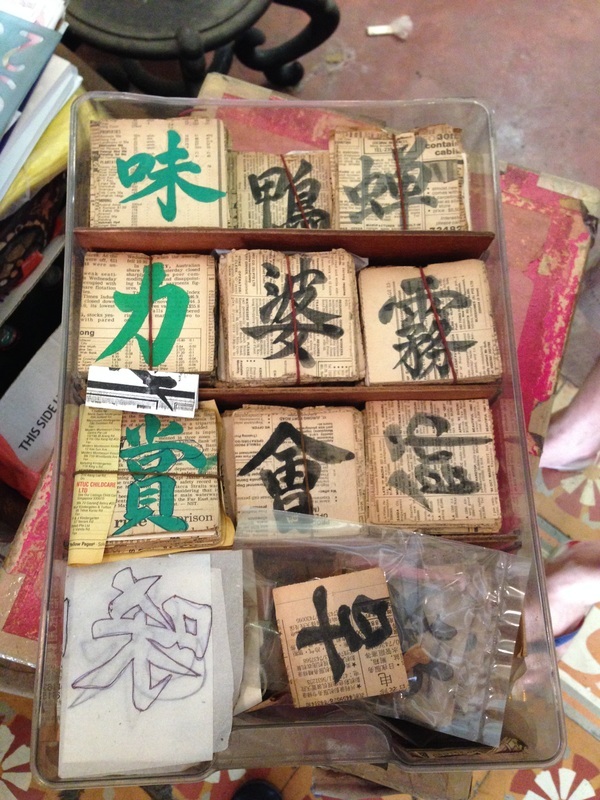 “My father wrote these calligraphy characters on newspapers in the ’70s. There was no need for proper paper as he believed in reusing items. 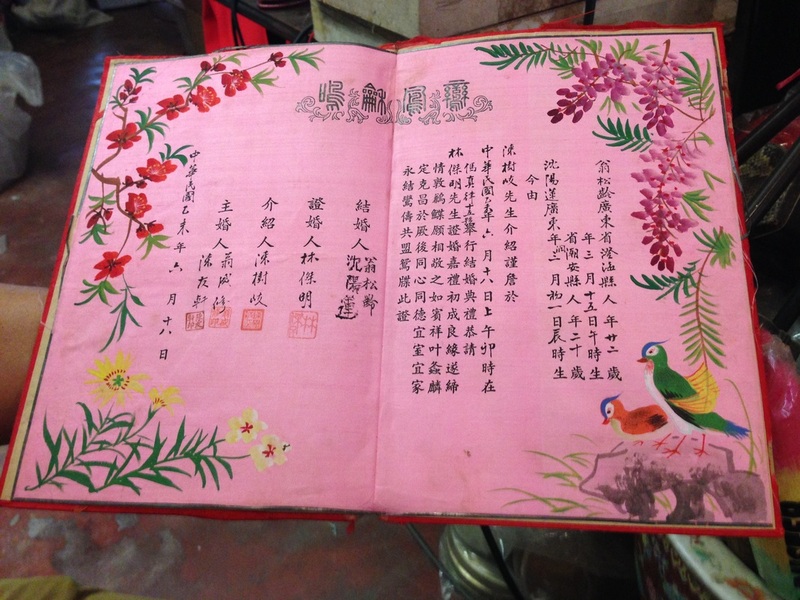 When a customer wanted something (on Chinese embroidery), he had to write it. Every time there was a common character, he would write and keep only the ones he liked. He would write and keep sometimes two to three of the same characters. 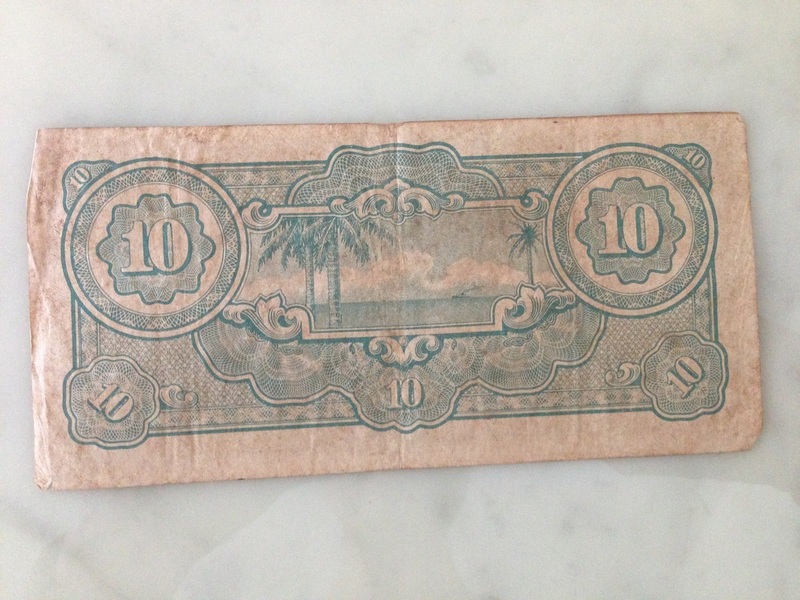 He told me not to throw them away and that it was my zhua-zi (which means paper notes or money in Teochew), so must keep. 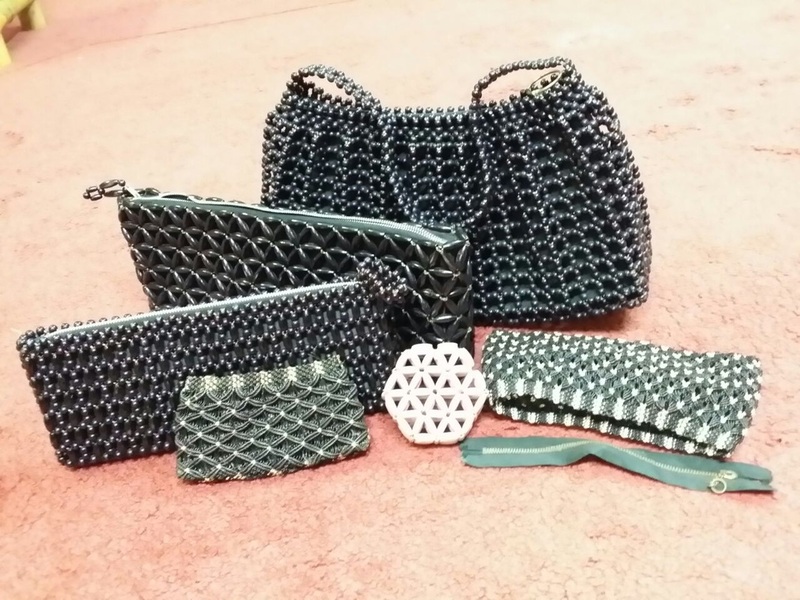 "These hand-beaded handbags are from the 1960s. People used fishing line thread to string the beads of different sizes together. It usually takes a long time to do one. 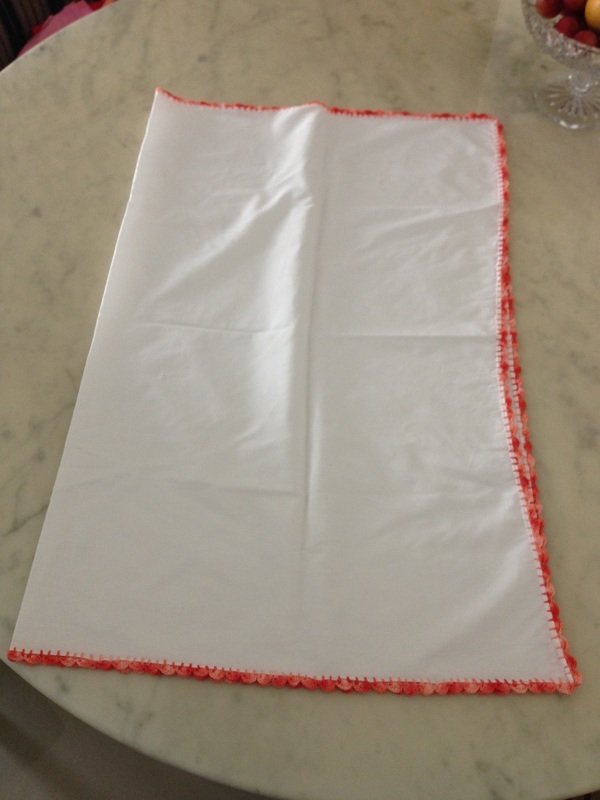 Once it is beaded, it gets sent to people to sew the cloth inside as well as the zip. 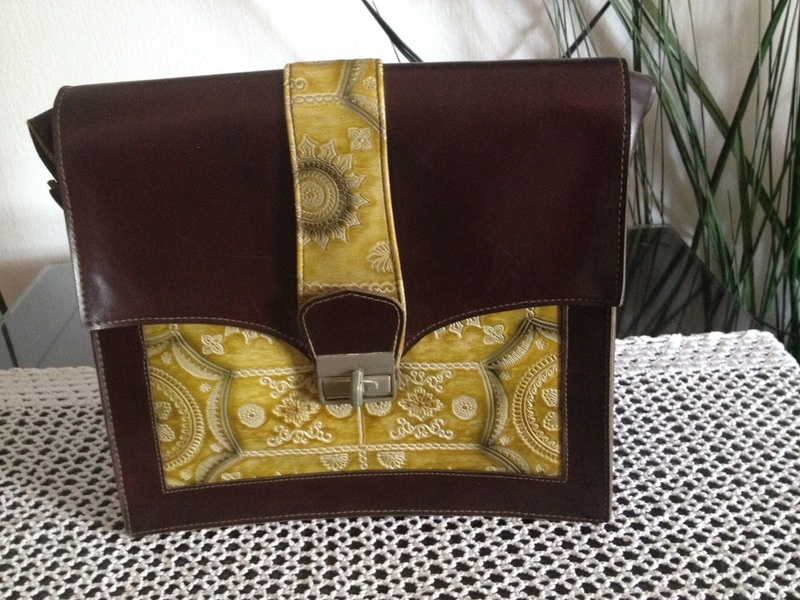 My mother's bags [which were like these] were thrown out and I sadly didn't keep them. When one of my students was clearing her things and she asked if I wanted them, I said yes." 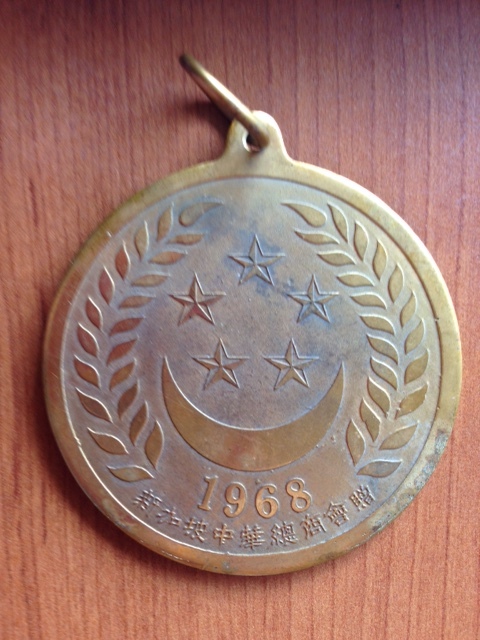 "This medallion was presented to me in 1968 as a recognition for being the first batch of civil servants being called up for National Service. I kept this to show my grandchildren when they grow up." 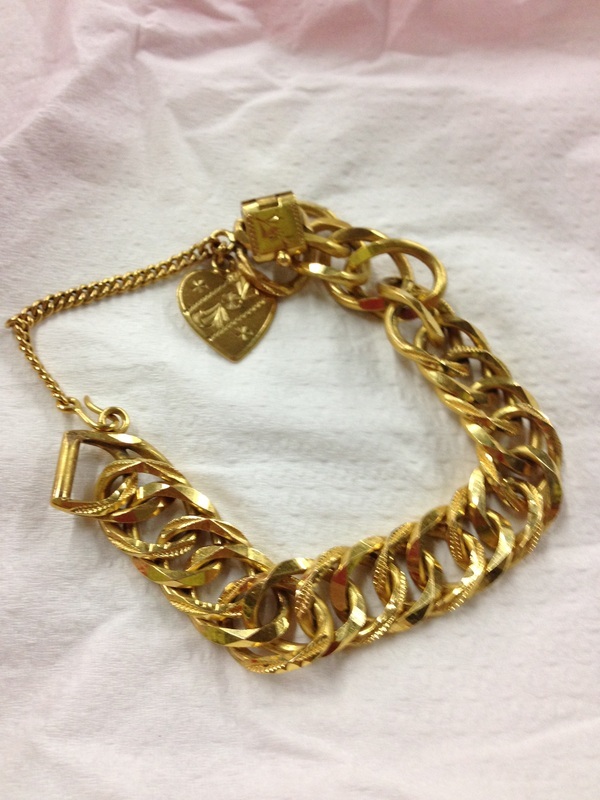 “When I was young, my mother told me that her mother bought this gold bracelet for me. Since it was too heavy to wear, she told me she would keep it for me. When my mother became sick, she had several envelopes – one to be passed to me, one for my brother and one my brother's daughter (her only grandchild) with our names on them. In my envelope, there was a gold coin pendant, the bracelet and my mother's wedding ring. There were also earrings that my father bought for her." “I have the original Schools Saving Scheme (SSC) card from the 1950s whereby pupils were taught to save by buying stamps and pasting them on the card. Once they were filled up, they brought the card to the post office and their savings account was credited with $2. I believe that was the start of what we call today POSB (Post Office Saving Bank). The card belonged to my eldest sister Alice, who is nine years my senior and residing in the US. This card was left together with some old documents which was found in my dad's house while we were clearing the house after my dad passed away a few years ago. My sis asked me if I wanted to keep it or have it thrown away, of course I said I would keep it." 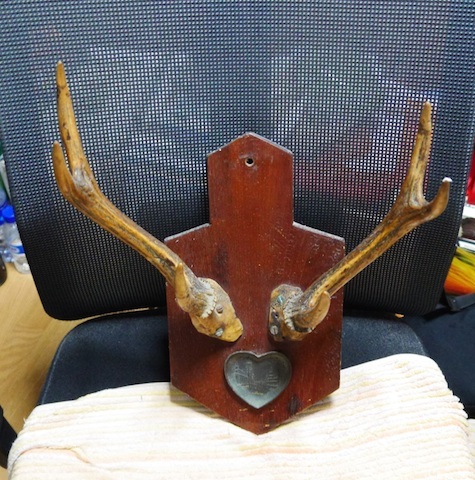 "These deer antlers has been in my family for about 80 years. The deer was shot by my great-great-grandfather, who settled in the Chestnut Avenue area after he arrived from China in 1898. 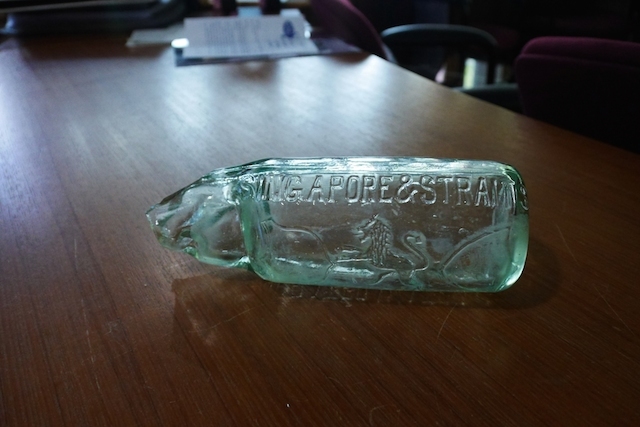 It was kept in my grandfather's house until they were resettled in the early '80s to Bukit Batok. My father then brought it back to his house in Hillview. In 2009, I used it as an exhibition piece for the opening of Wallace Education Centre at Dairy Farm and it generated a lot of interest. Now it hangs in my study." "Nobody uses these calendar cards these days as you use the calendar on your smartphone. We would get them in a set (some have four in a set) from different companies. When we got them, we were so happy as we would give them out to our friends as each in the set had a different picture in the front." "I was taught the importance of savings by my parents. They started a savings account for me when I was young. 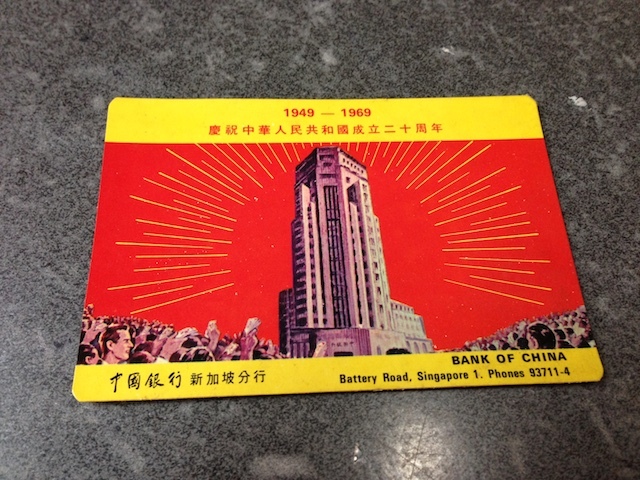 The bank provided this savings bank in 1956. I kept it so to teach my daughter the same values – to save and be thrifty." 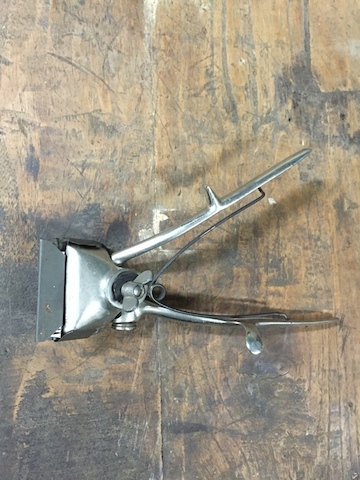 "This is a hand-operated sewing machine. 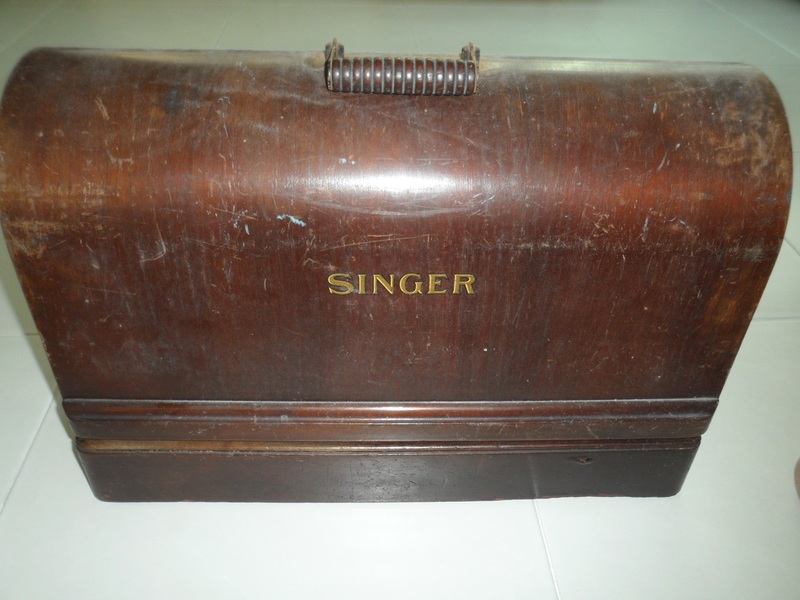 ‘Singer’ was, and still is, a premium American brand established in 1851. 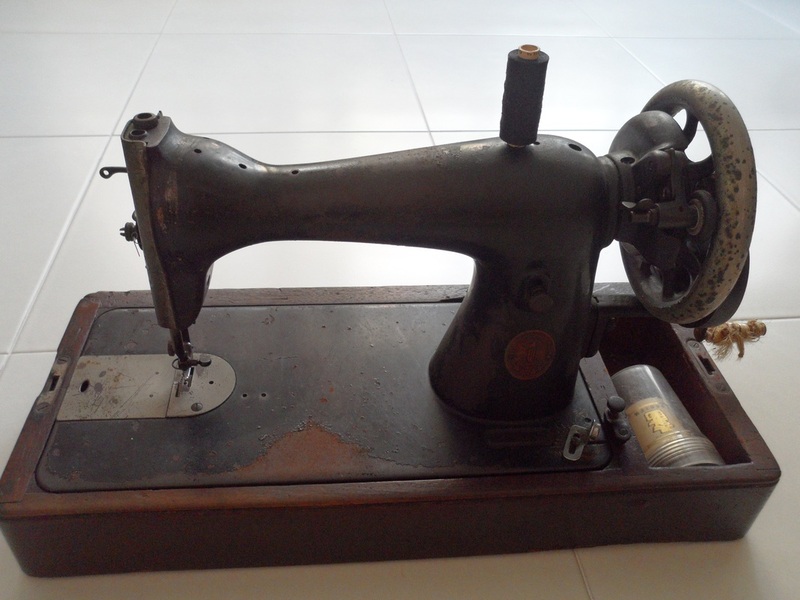 This machine, with the registration number EC717027, was bought by my father for my mother as home-sewn clothes were the norm then. 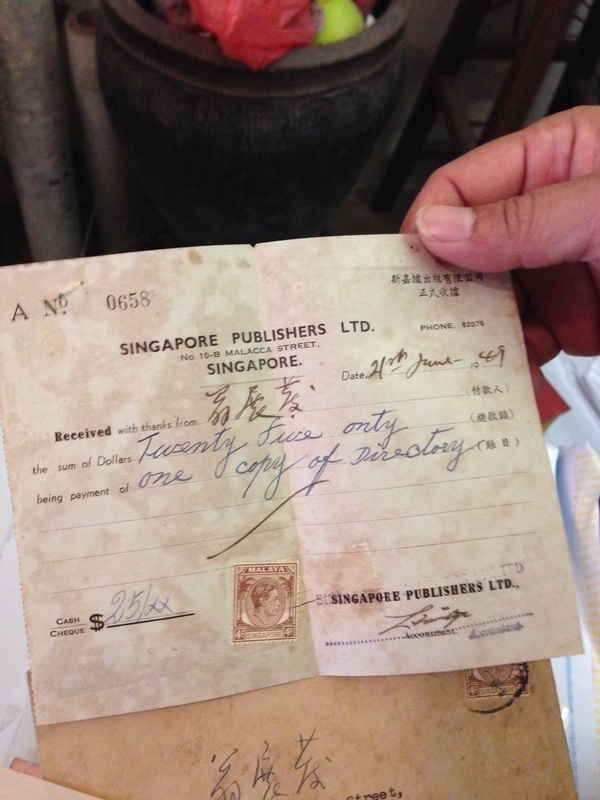 It was hire-purchased on October 11, 1941 at the cost of S$140. That was a princely sum at that time, so a down-payment of S$20 was made, with the rest paid by S$5 monthly installments. 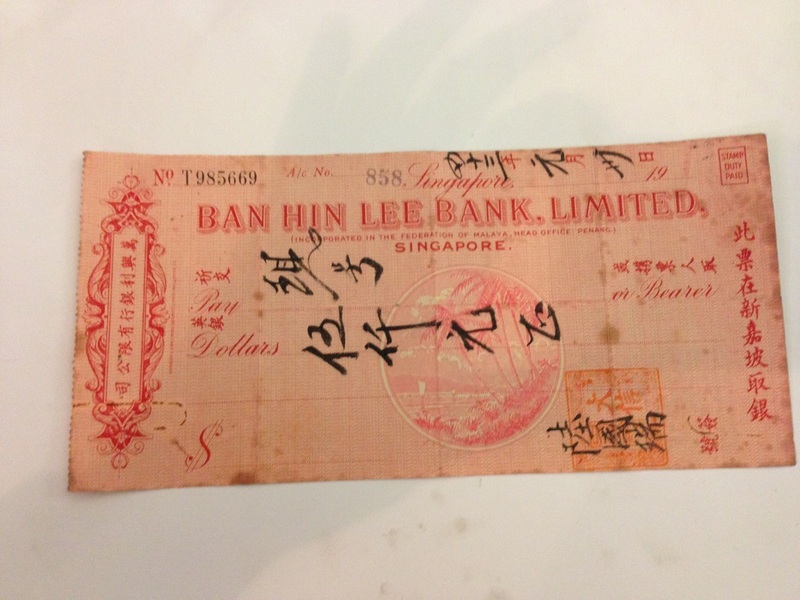 Then came the Japanese occupation of Singapore and times were hard, so there was a lapse of payment. The machine was eventually used by my mother to earn a living to bring up seven children. 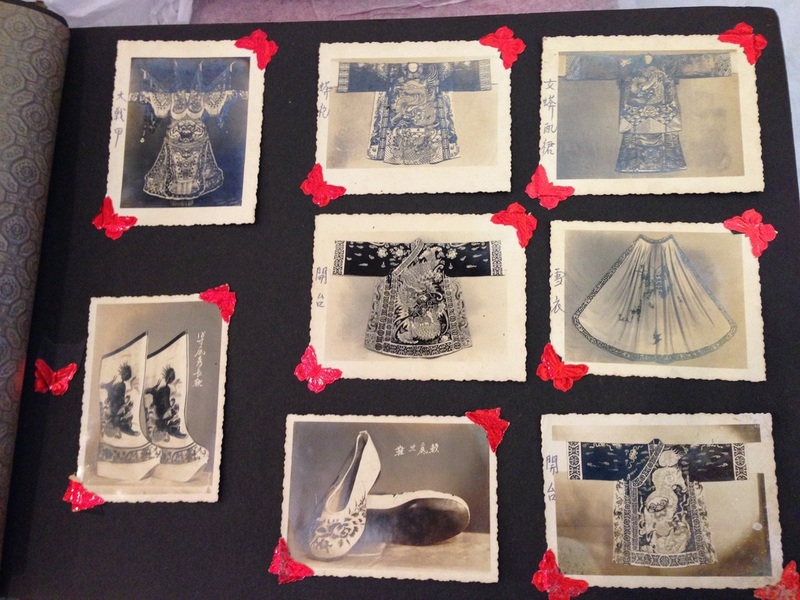 She sewed mainly ‘samfoos’, the everyday clothes of most Chinese women of that era. She had many customers because of her good craftsmanship, despite not having any training in tailoring. 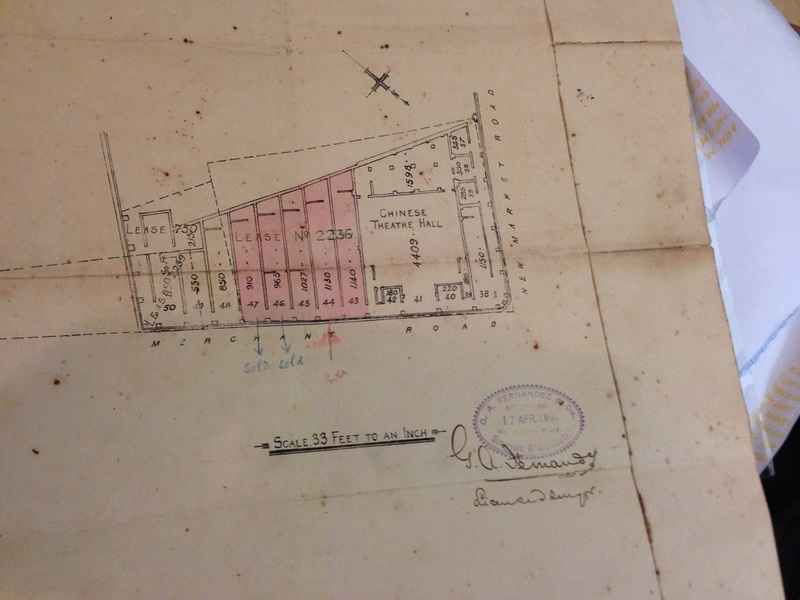 (The shophouse in Balestier Road, where my parents lived, is still standing, housing an eatery now.)" "This belt is solid silver. 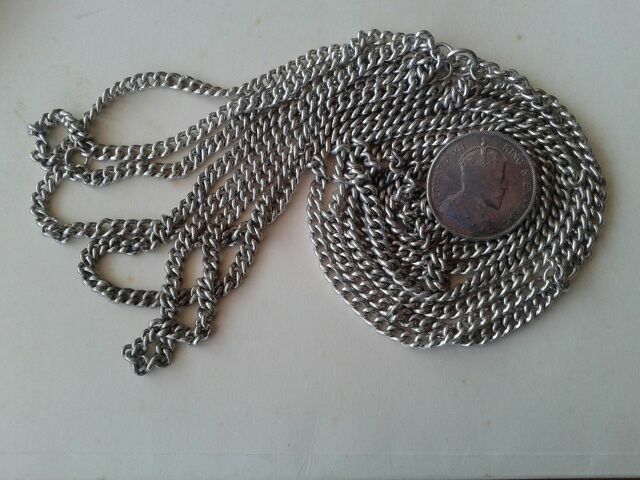 I cannot remember where I bought it or how much it cost but it was in my early 20s when I was working in the rubber factory and I was with some of my girlfriends who were working there. But I do remember it was the first piece of accessory I bought for myself. When I was young, owning gold was beyond me but it did take me a long time to save up even for this. A few years back, I asked my daughter which piece of my meagre jewellery collection she would like to have in future. Strangely enough, she said she wanted only this belt, not knowing at that time what it meant to me." 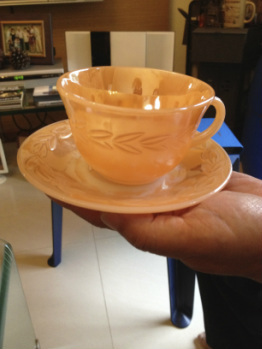 "I remembered when I was about in Primary six (in 1950s), I surprised my mother by presenting her with four sets of cups that I bought with my savings. If memory was correct, it cost a dollar each. I took a number 6 Hock Lee bus to Chulia Street and walked to Robinsons, then at Raffles Place (before it burnt down) and bought it. My mother was surprised that at such an early age I was such a ‘responsible family boy’. I remained so, ha ha. I decided after many years to retain one for keepsake." "When I was young, I think about six or seven years old, my parents inculcated in me the importance of thrift and savings. In school, we had to buy stamps and paste it on a card and bank all the money in when the card was filled. This was fun way of teaching us on saving. 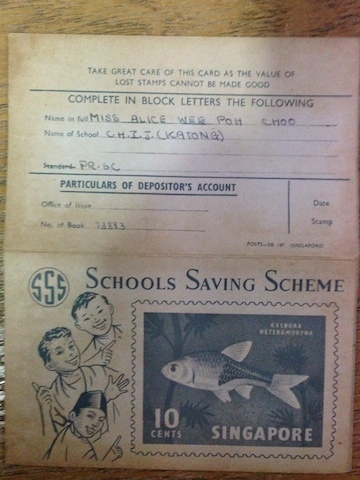 My parents opened a savings account for me at Chung Khiaw Bank then at Outram Road. I was given a “safe” for putting in my coins. My sister got a pig and frog. These were made of metal, unlike the later versions. I kept it and passed it on to my son Adrian. When I was young, I used to drop in coins, but later found that I needed the money. 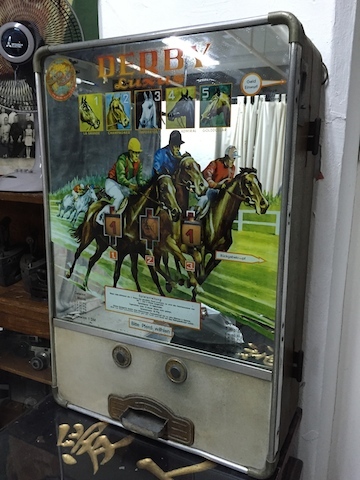 Not knowing how to open the safe, I would overturn the safe and try to dig out the coins, with some success. Overtime the part of the metal gave way (as you will notice from the picture). 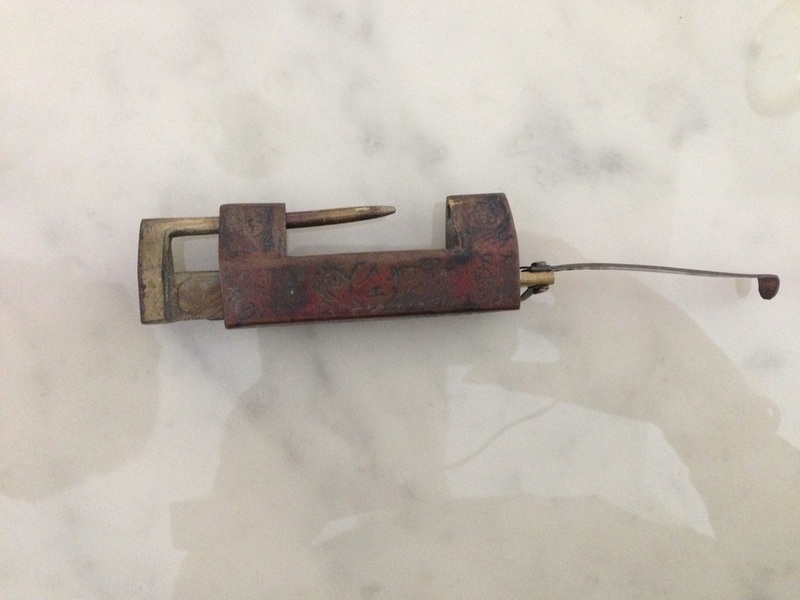 When I was older, I figured out the way to open the lock located at the bottom of the safe." 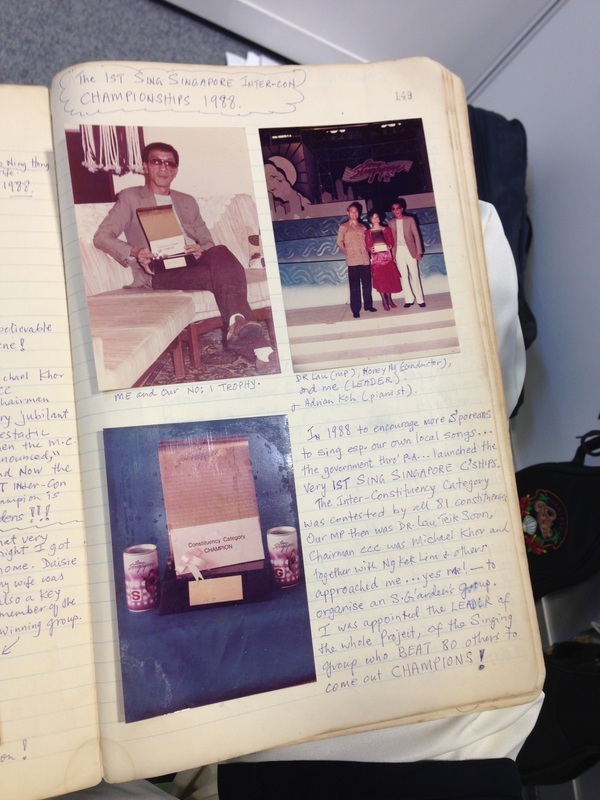 "In 1969, I was a young newly-minted Second Lieutenant posted to the Singapore Armed Forces Training Institute (SAFTI). 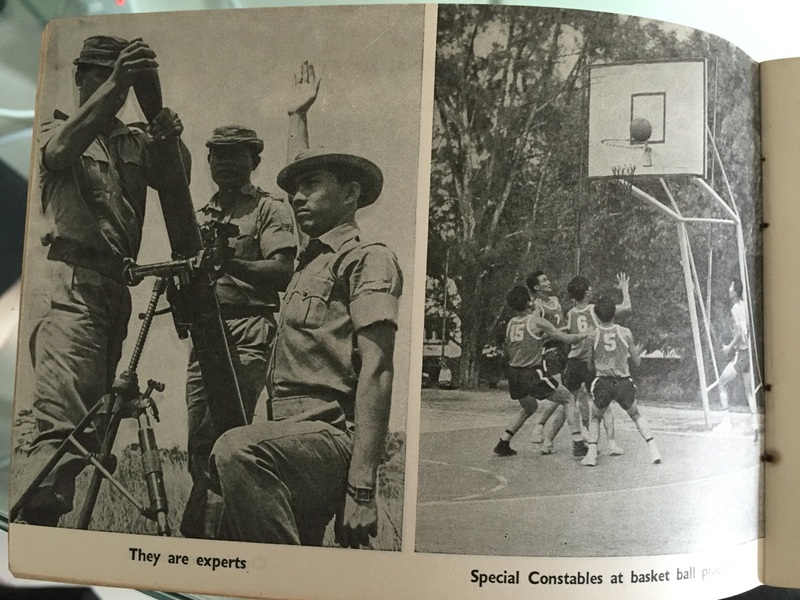 One day, the director of the Institute, the late Colonel Wee Soon Whatt, summoned for me and told me that I was to attend the Jungle Warfare Course conducted at Ulu Tiram, Kota Tinggi, Johor, Malaysia. It was a school run by the British Far East Land Forces (FARELF). The course was from July 7 to 18, 1969. I enjoyed the course with course mates from the British Military Forces then stationed in Singapore and Hong Kong. 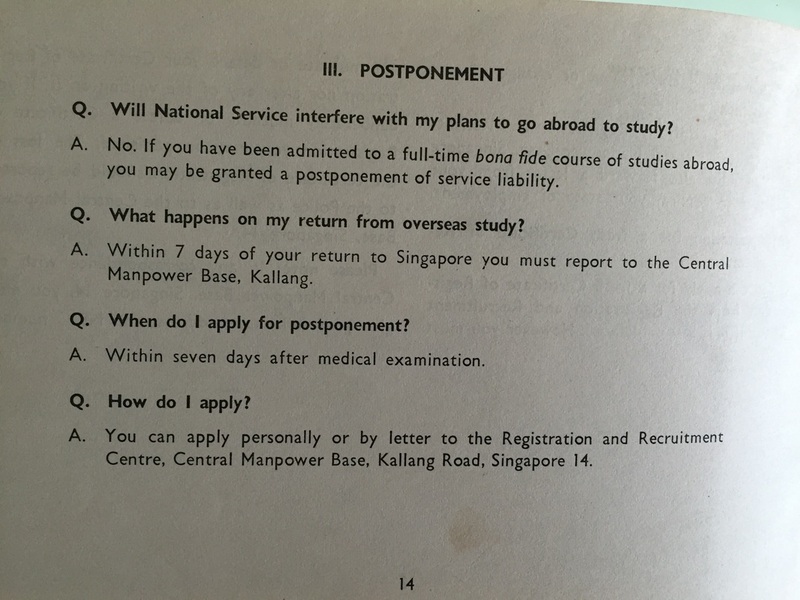 1) The course that I attended was I think the second last course that admitted Singaporean officers. 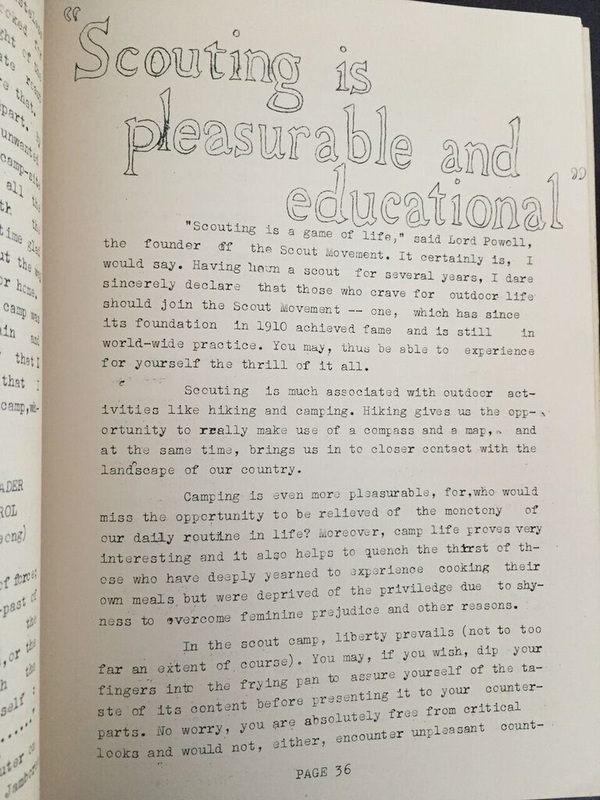 2) The notes were cyclostyled notes done with the typewriter, not like nice printed notes today. 3) It was a course I attended with foreign students. 4) It can be left as a legacy and if the future military museum wants it." "I was cooking and my son (early teens at the time) came back and held a radio and said it is an antique radio and he wanted to keep it. 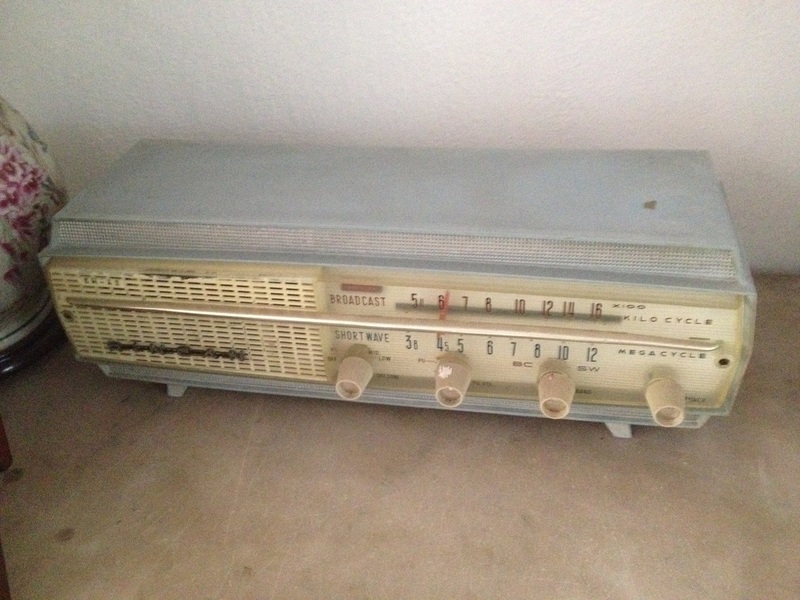 The radio was actually thrown away." 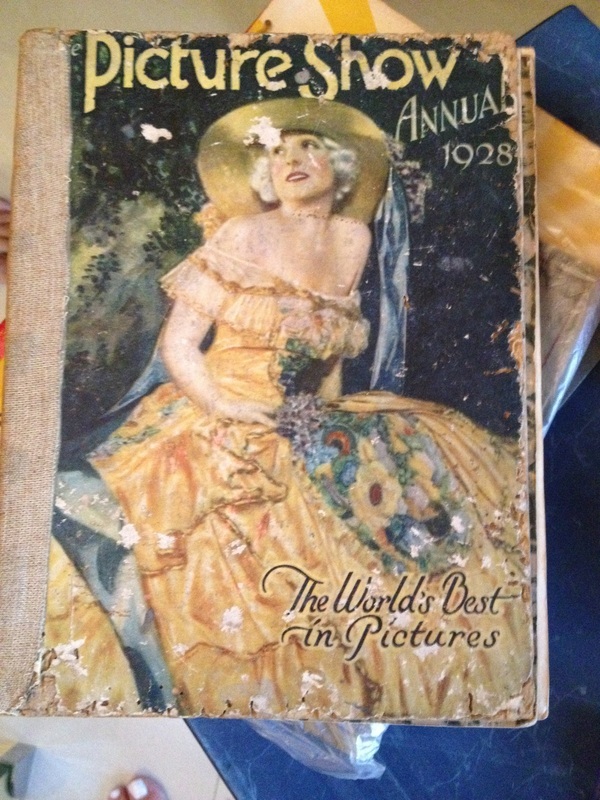 "After my father pass﻿ed﻿ on in 1968, (when I was 19-years-old), I found a copy of the “Picture Show Annual 1928” which he had kept. 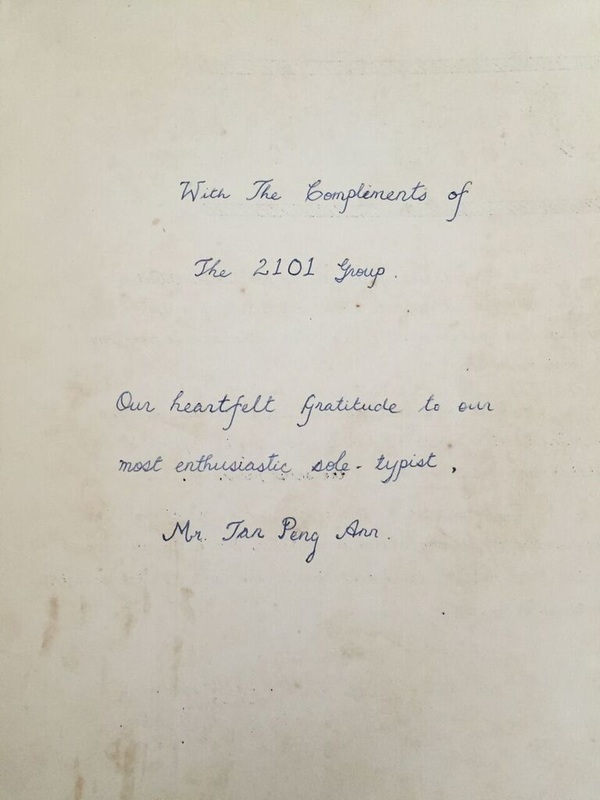 In the book, he wrote that he bought it on December 10, 1927. 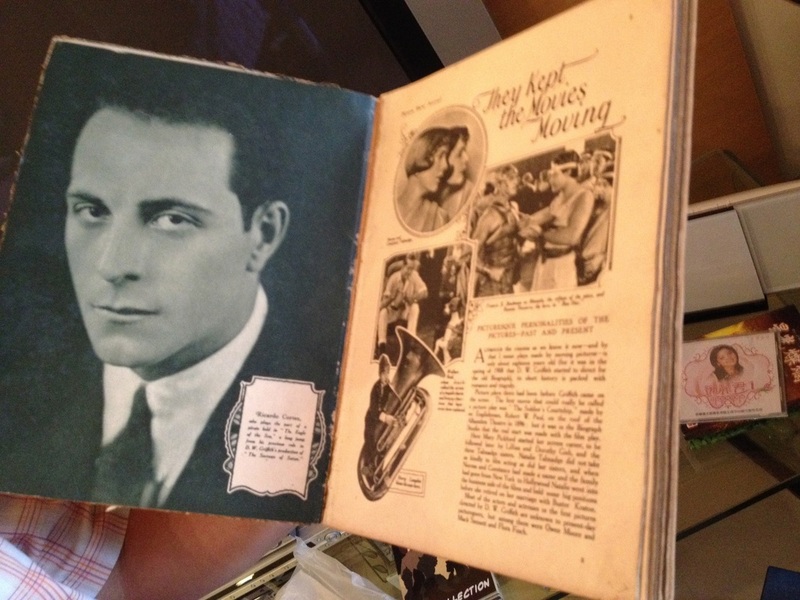 The book is about movies, and actors and actresses of that time. 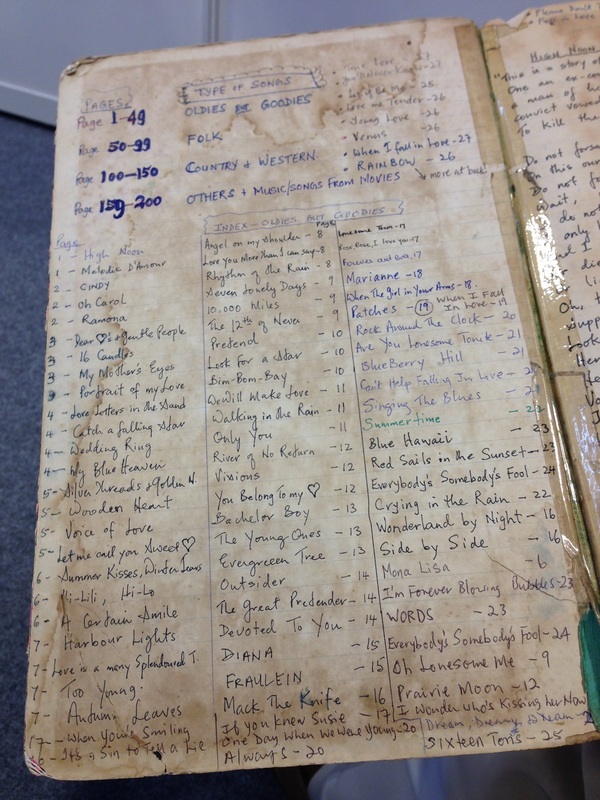 He had kept it for 40 years and I concluded that he must have liked the book. I took the opportunity to keep it as a family ‘heritage’. 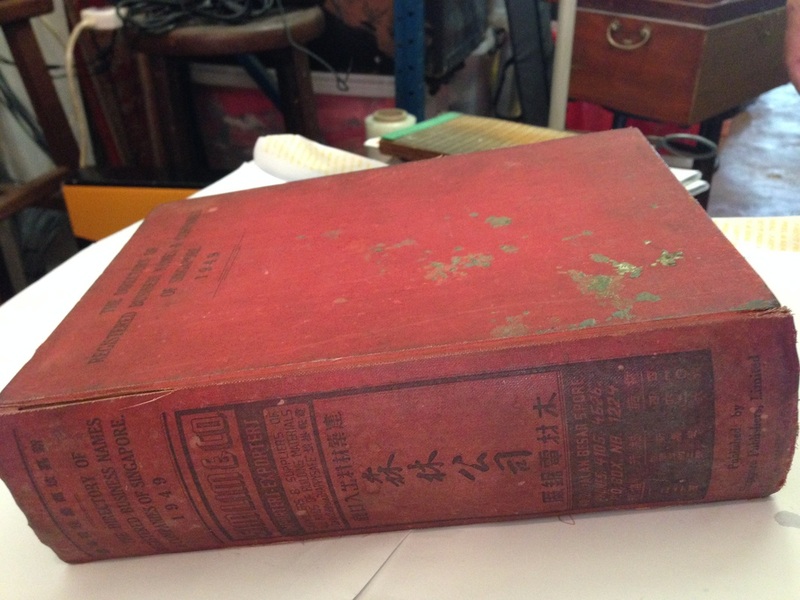 By now the book is a cool over 86 years. My thought is to pass the book on to my son and for future generations to keep." 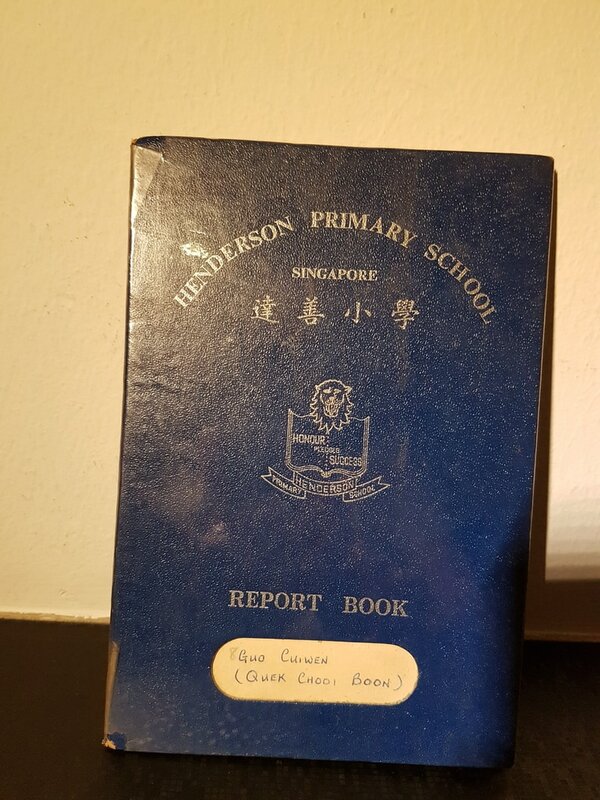 “This is my primary school report book from 1980s. 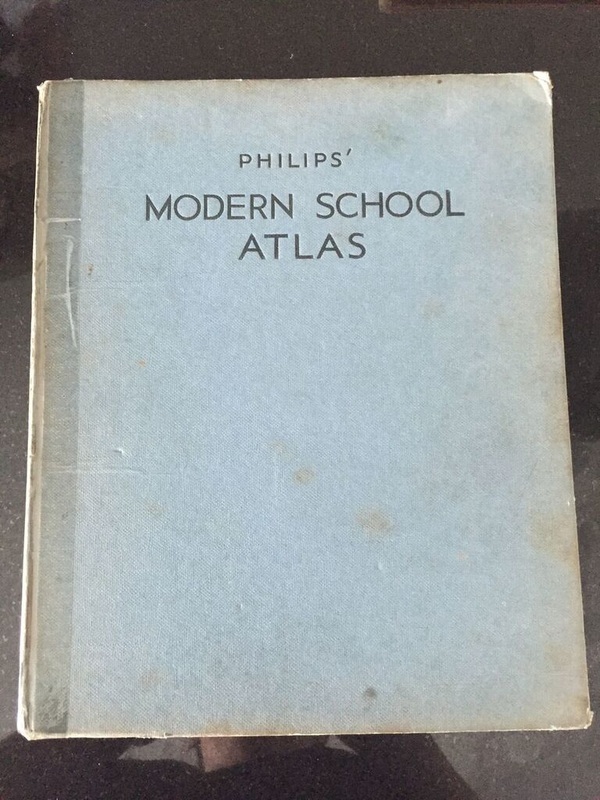 I kept it because it brings back fond memories of my childhood days and school when things were so much simpler and carefree. There was no social media or games so not so many distractions like today. My father was the sole breadwinner supporting three kids. My mum was a full-time housewife who cooked every meal for us. This is not possible in today's Singapore as cost of living is much higher. We never went on overseas holidays but we spent a lot of time as a family. We watched TV together every night in our flat. Our father would bring us to parks, zoo, Haw Par Villa, etc. I remember how thrilled we were when he bought us all a Walkman. 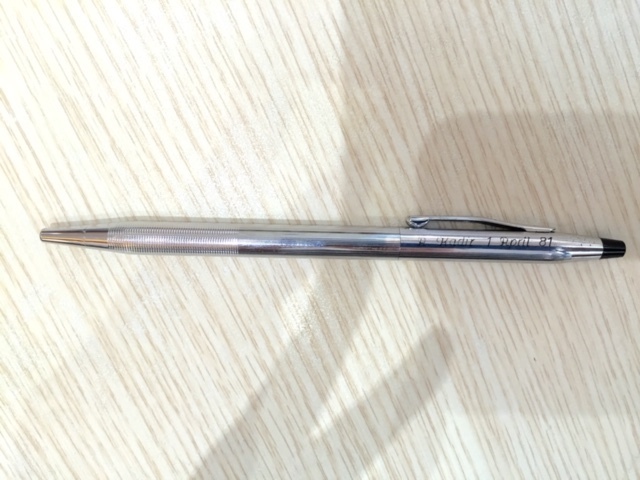 “This Cross pen was given to me by a school friend in 1981 as a birthday present. It is engraved with my name and date. I wasn’t close to her; I was shy with girls. I decided to keep it and put it in my shirt pocket wherever I go. "Singapore launched a Quality Drive by the National Productivity Board (NPB) in the early '80s. Many organisations, both private and public, were encouraged to join in the QCC (Quality Control Circle) or WIT (Work Improvement Team) programme. I was then working for a US company called DuPont. We were very active in these programmes and we participated in some of the national competitions on productivity conducted by NPB. 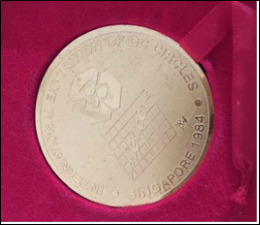 In 1984, my technical team won this precious gold medal and was subsequently invited by NPB to give presentations to some organisations who aspired to succeed in their QCC programme. 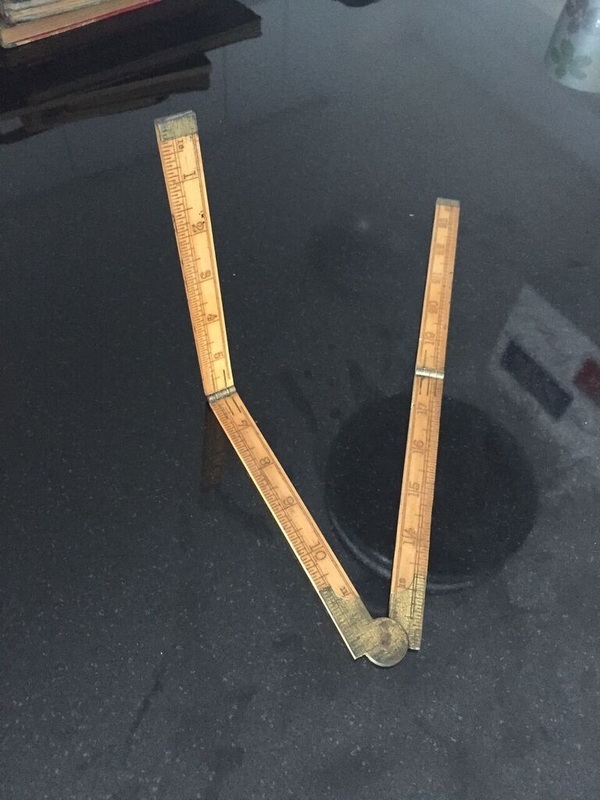 "I found this ruler after my father passed on away in 1968. It looked unique (it folds), and I decided to keep it as a souvenir. 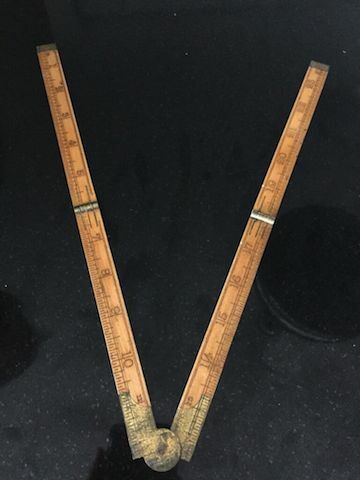 I found out that this is an instrument used usually in carpentry where there are measurements of lines, and angles can be done in both second and third dimensions. It is true that there are many new instruments today. But I kept it to show and remind future generations that their forefathers too were creative and able to achieve great things." 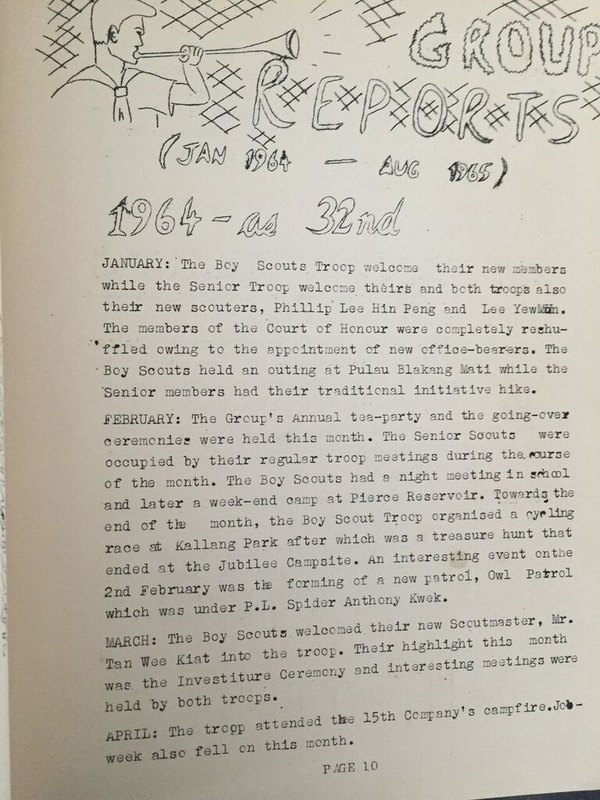 "In 1965, half a century ago, the Raffles Institution Boy Scouts 2101 published a magazine. They were looking for someone to assist them in the preparation. I assisted them. In those days there wasn’t any computer. I used the good old typewriter to prepare the whole magazine on stencils, which were then used to cyclostyle the pages of the magazine. It was a laborious process. Errors had to be corrected by applying correcting fluid on the stencil. In a short half century, the whole printing method had changed. When the photo-copying machine was introduced, the time taken to prepare printed magazines was drastically improved." 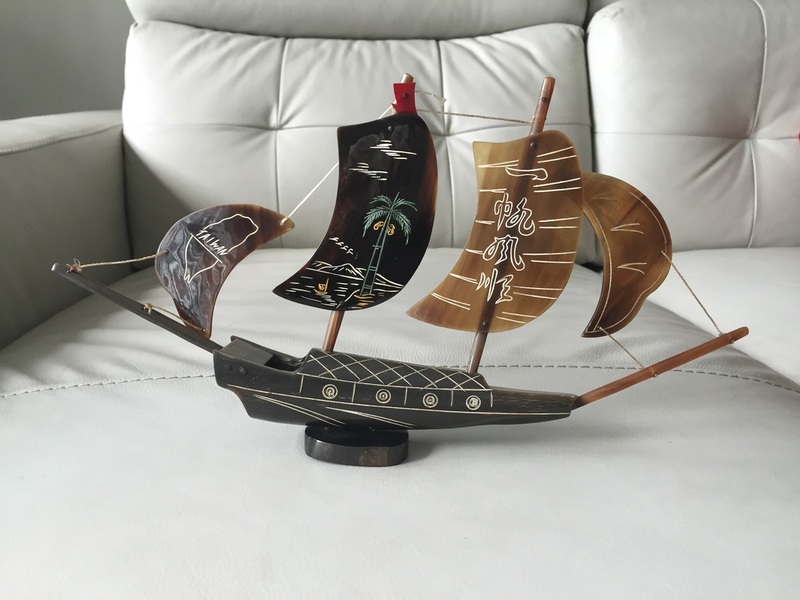 "I have kept this sailboat as it is significant in my life. This boat has been with me for 40 years. In 1976, I went on my honeymoon in Taiwan. Group tours were rare those days. The group comprised mainly of honeymooning couples. 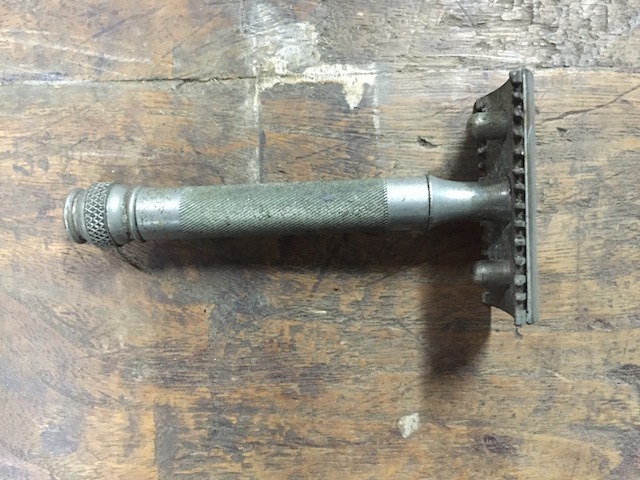 "This shaver was used in the early 1950s and it came from the US. 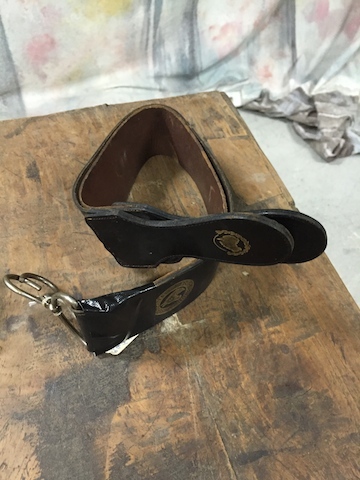 The blade is changeable and can be used on both sides. I bought this for S$15." “A empty milk can would be attached to the tube so the ash could be thrown in. 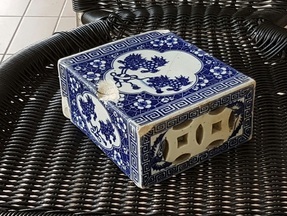 The tobacco leaves would be placed in the holder, which is then burned. 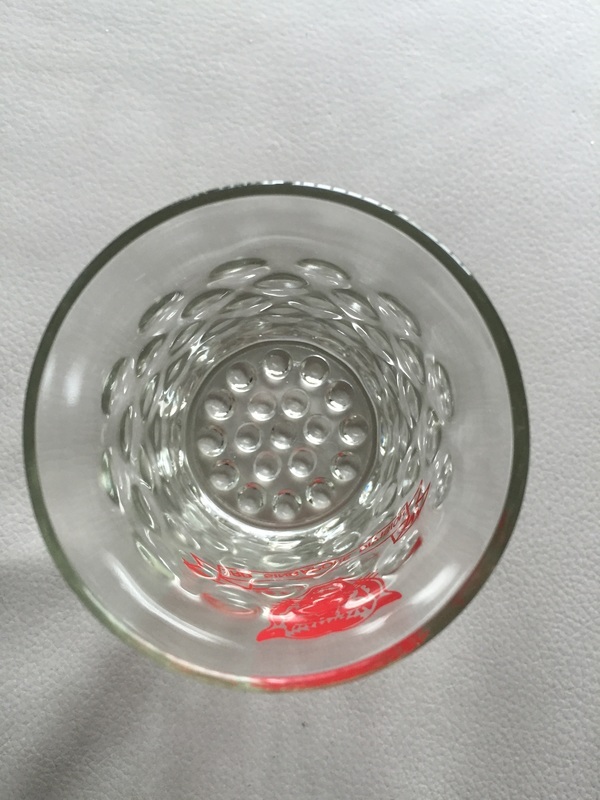 The user would then inhale from the top portion (which had holes). 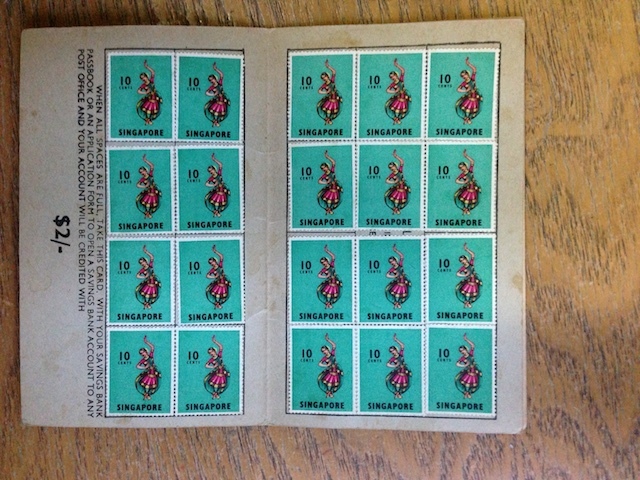 “A dealer kept this and sold it to me in Singapore about six months ago for about S$250. It is used to fan the charcoal or wood branches back in the old days. Air would come in from the hole on the side, and then go out either in the front or back. 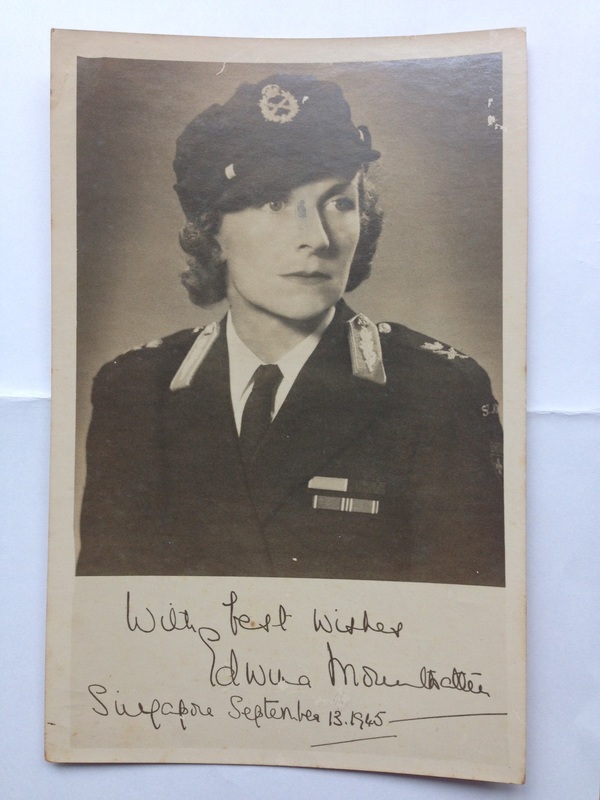 "In September 1945, when the Japanese had surrendered, Edwina, Lady Mountbatten accompanied her husband, Lord Louis Mountbatten to Singapore and gave out autographed pictures of herself to those who volunteered at the Red Cross. My aunt Marie received one of them. I am a history graduate so it is in my culture to know when things happen." 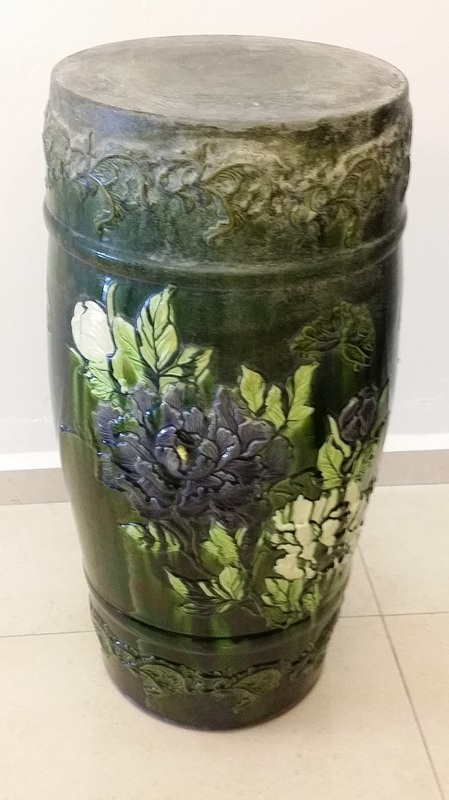 "The heirloom is a drum-shaped flowerpot stand which has an embossed flower motif and which still retains a bright glaze although this item was purchased in the 1920s by my paternal grandparents. 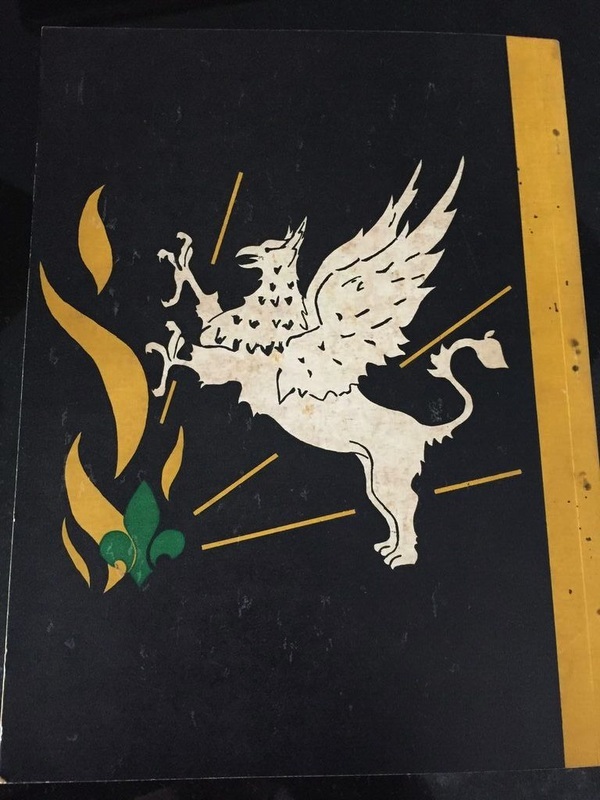 As a young boy in the late-'40s, I first saw it in my Aunt Luna’s home. She was my dad’s eldest sister with whom my widowed grandmother was staying. 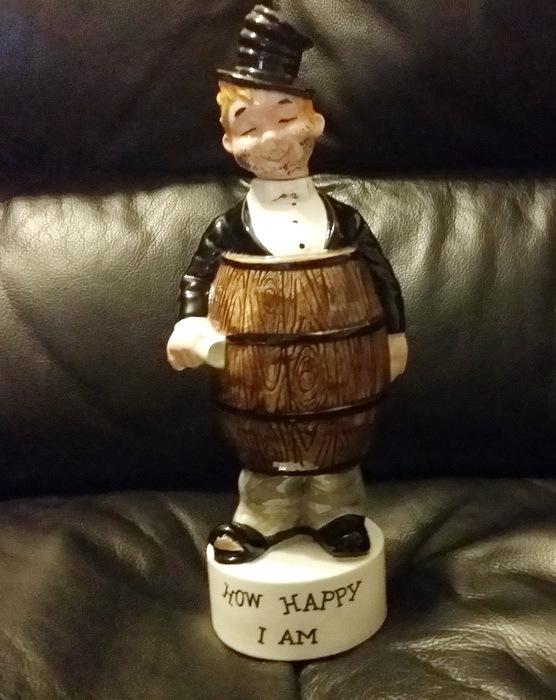 Subsequently, when my Aunt Luna emigrated to Perth, Australia, in 1970, she distributed some of the heirlooms to the grandchildren and I received this item, which I had admired since 1948. 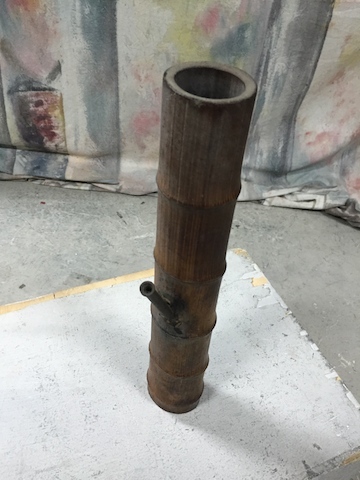 It is 580mm height and 250mm diameter." 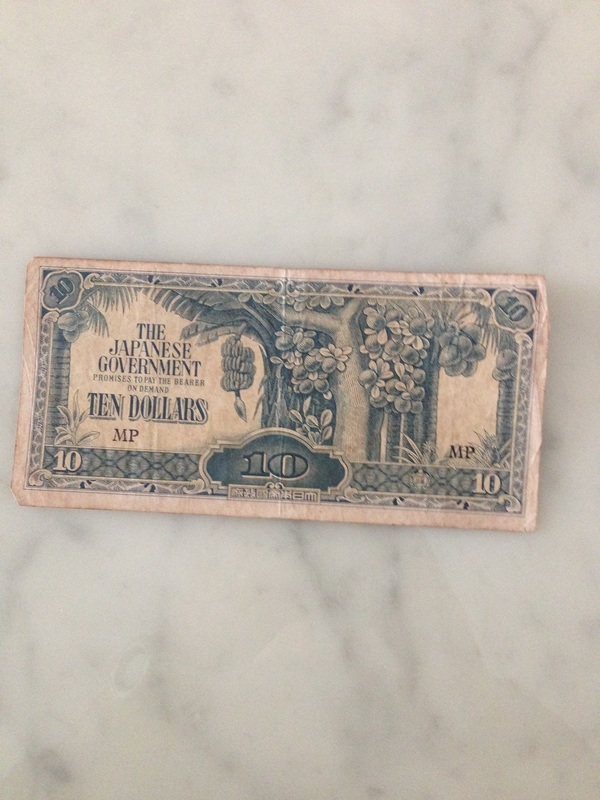 "This is the currency used during the Japanese Occupation of Singapore and people called it 'banana money' as there are bananas on the currency. This note came with a history book on the war. It is the real notes as I remembered them. During the war, I was only a child so I didn't have any money. My daughter bought the book in the 1990s and gave it to me as she knew I would be interested in it." "This was meant to be worn on the full-moon celebrations of my son's birth. He wore it when he was a month old in the early 1970s. 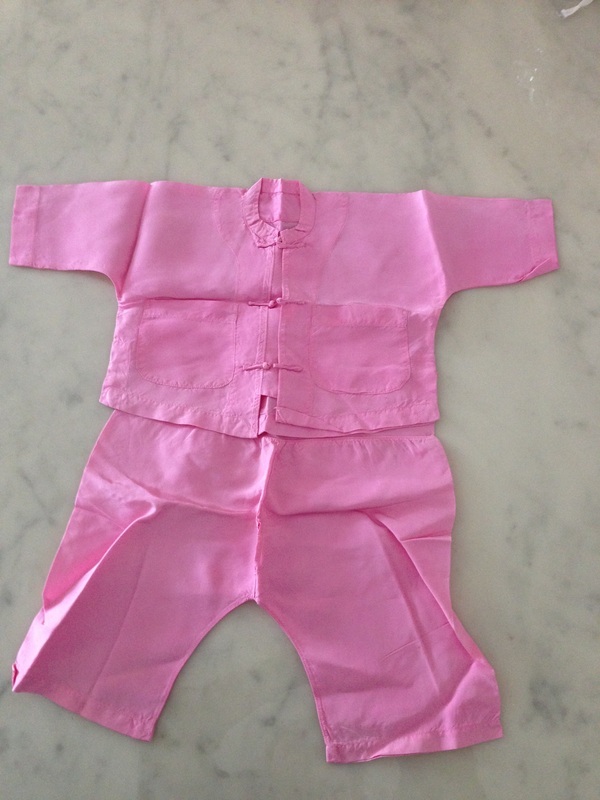 My mother made it and she followed Chinese tradition in sending gifts when a child is born." 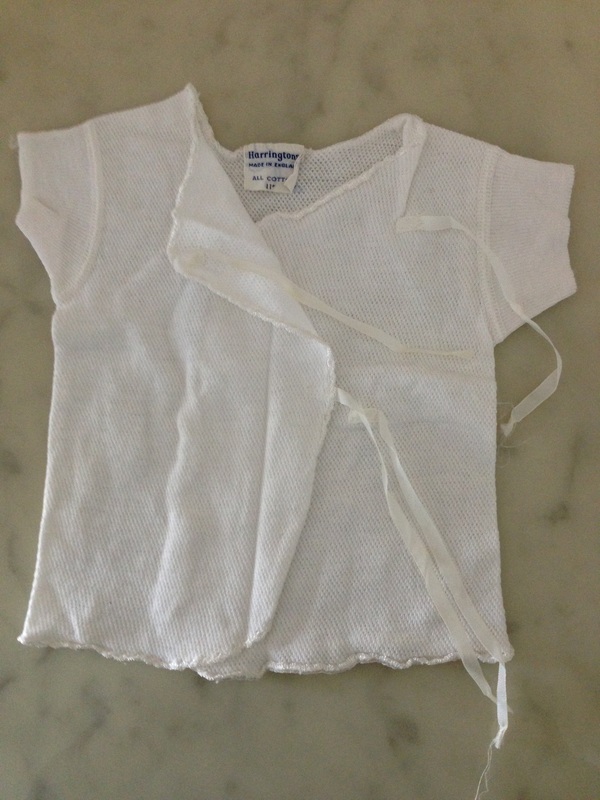 "This was my son's cotton baby top in the 1960s. It is made in England. Below, he would wear a baby nappy. My son doesn't know I have kept it." 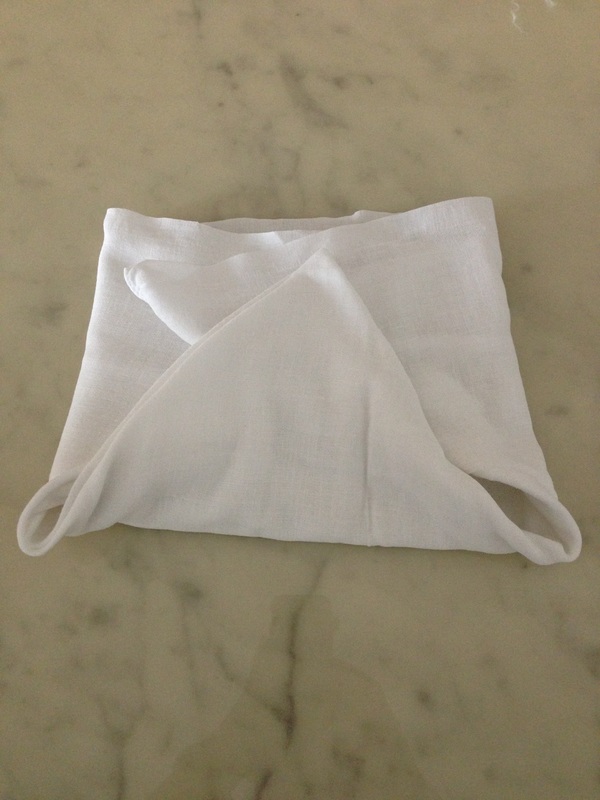 "This Muslin cloth baby nappy is from Johnson's. 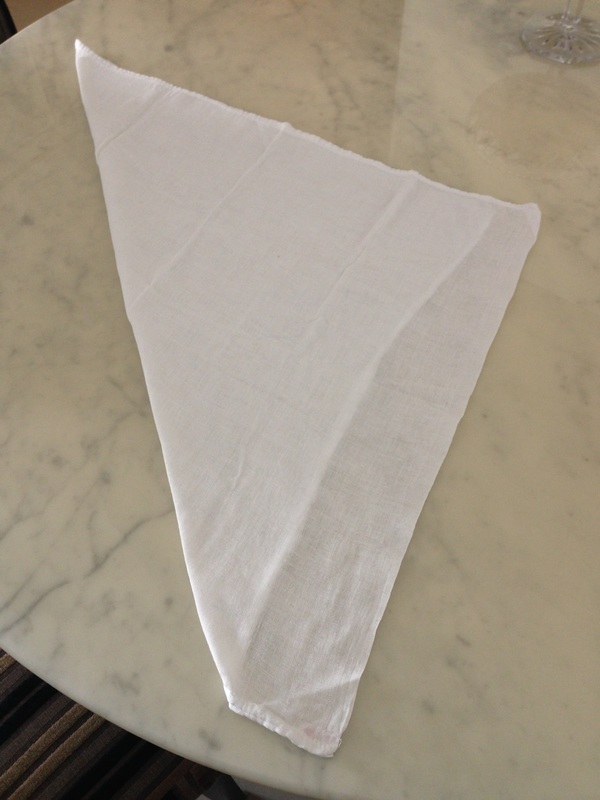 You have to keep folding it into triangle shapes, and a big safety pin holds the cloth in place. 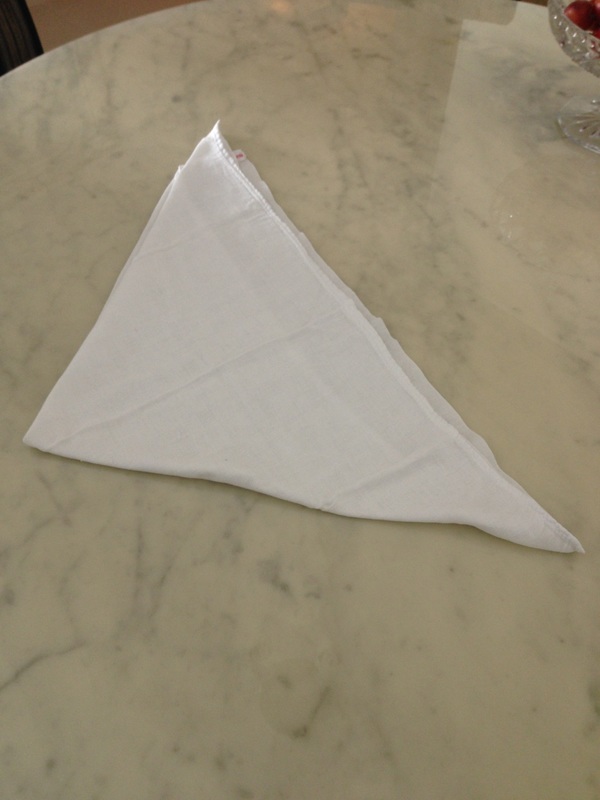 This was used before Pampers and it absorbs the urine and soil. On wet days, you can use 40 pieces of nappies. It can be washed, dried and then re-used. This was used by my son who is now 40 over years! I don't know why I kept it; I guess it is for memories. You can't find any more now as they are disposable. During those days, we didn't bring babies out for long hours and there was always people at home. 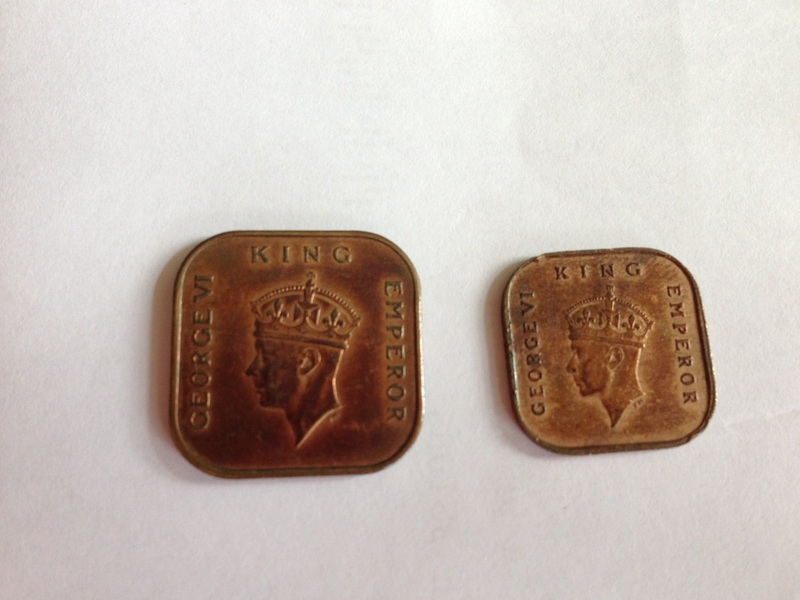 My daughters were using them even in the early 1960s." 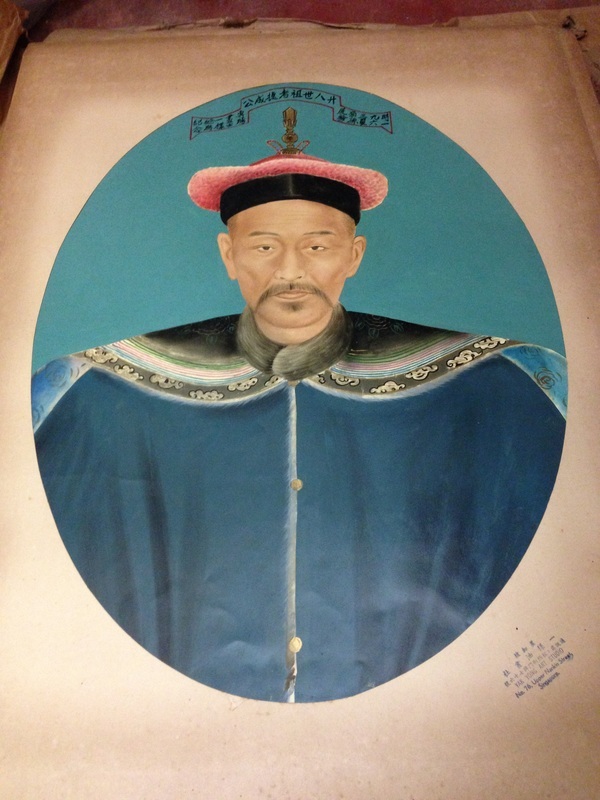 "My grandfather got a studio called Yak Yong Art Studio located at 76 Upper Nankin St to draw these pictures of his ancestors in 1963. The top two pictures represent a husband and wife of the 28th generation of Engs, while the two bottom ones are a husband and wife from the 27th generation. I represent the 33rd generation. 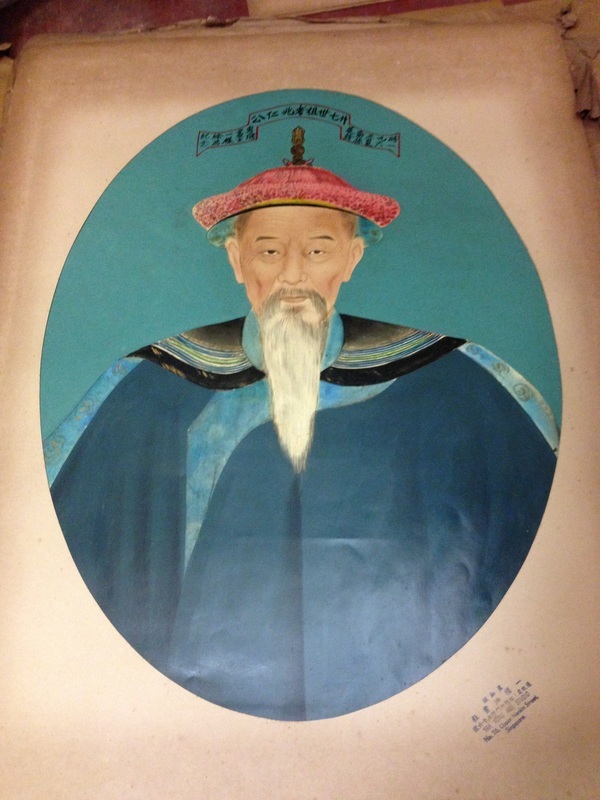 Did my grandfather have a picture of his ancestors or the studio looked at my grandfather and then made a guess on what they looked like? Why did they have head gears on and was it because they were officials at the time? These questions I have yet to find out." 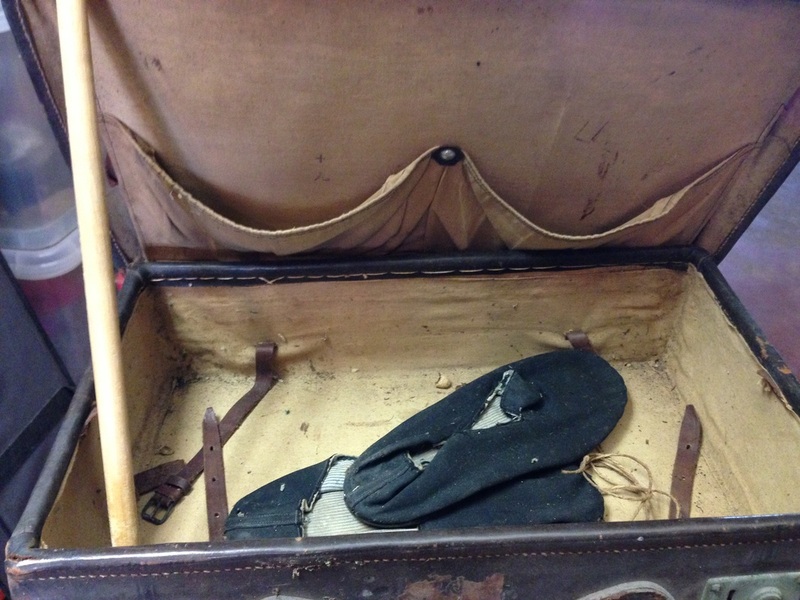 "This was my grandfather's leather luggage and it has his shoes in there. He used it while he travelled in the 1930s. It was there when we moved out of the Merchant Road shop so I kept it. I can trace back on the Internet to find out how much the bag is and the days of how much income he had so I can understand that time better." 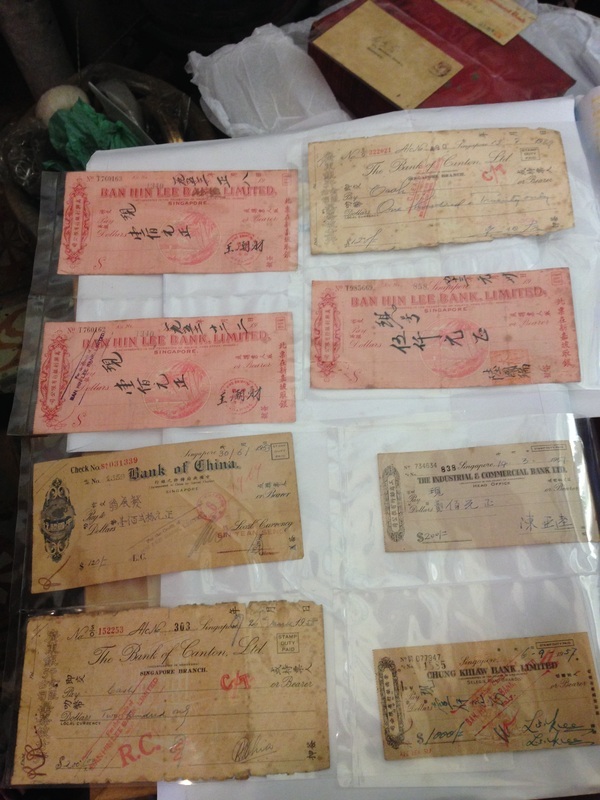 "These are bounced cheques from the 1940s and 1950s, and one was for $5,000! 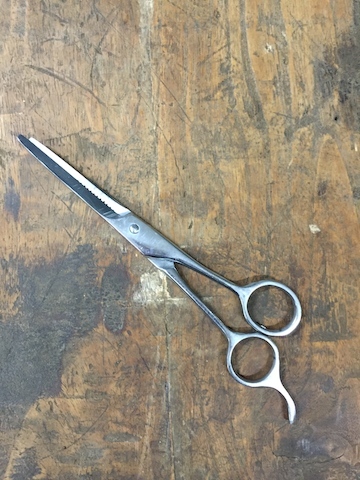 This was from my grandfather's shop. I just keep them so I can remember. My grandfather chased the money but if don't have, what choice did he have so he had to let it go. Even after, he still was very trusting of people. In today's world, it is all by contract. My grandfather felt that if he reported it, his customer would go to jail. And, if he had a family, the family would then be broken. My grandfather felt that if we could still survive without the customer paying, then let it be. Too many laws makes things difficult as well and life becomes sad. I now feel the same way he did which makes me a lousy businessman! Probably when I was younger I would have felt differently – must get back hard-earned money and don't care if they go to jail. When you are older and have a family, you see things differently." 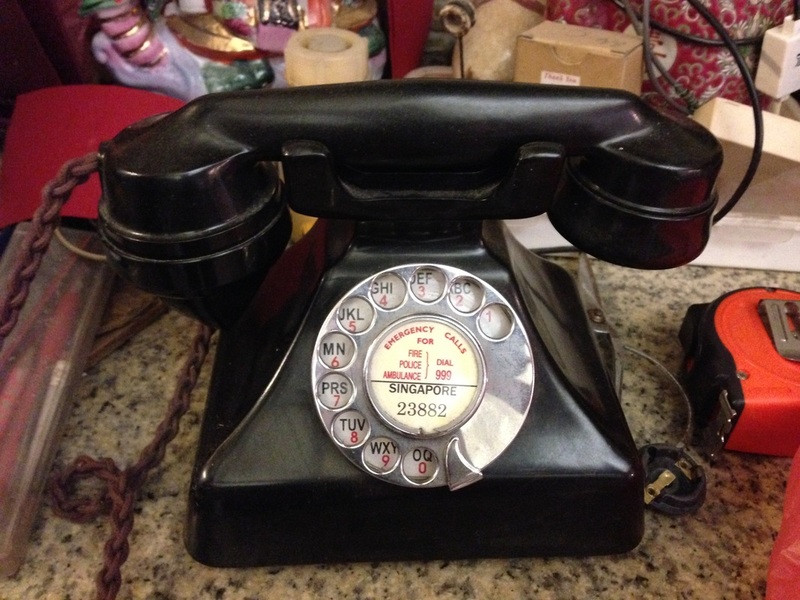 “My grandfather bought this phone in the last ’30s. I wanted to keep it and it also adds an old element to my shop’s ambience. The phone was not working and was not compatible to our local system, so I found a retired telephone engineer who had a shop repairing old phones in the UK. 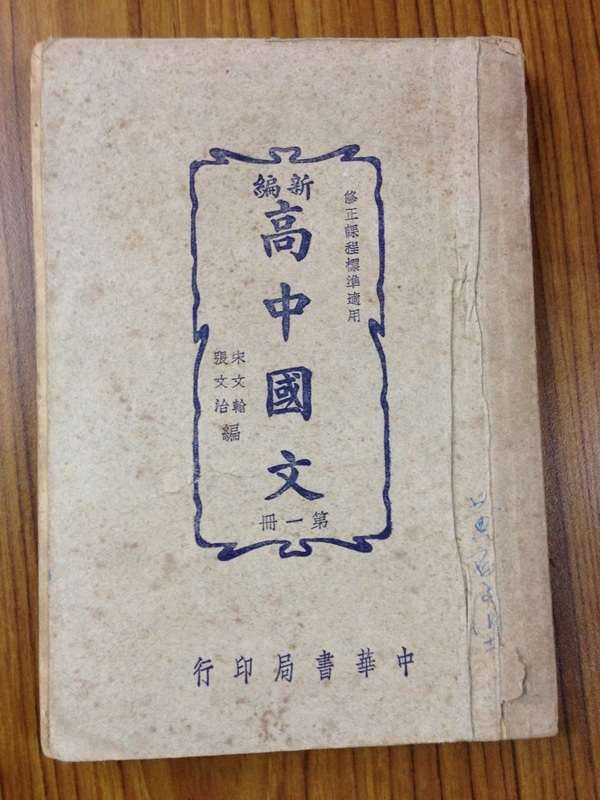 "This is my Chinese reading book used in school in 1965. When the teacher explained, we had to quickly write down the meaning as it could be on the exam. 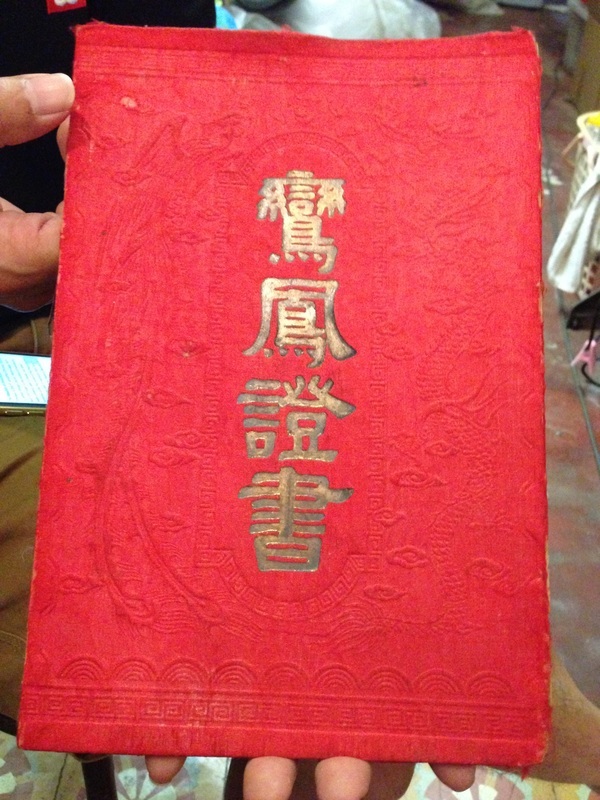 One word (with a few Chinese characters) can have a lot of meanings so if four words, there would be lots of explanations (see faint notes on the pages)." 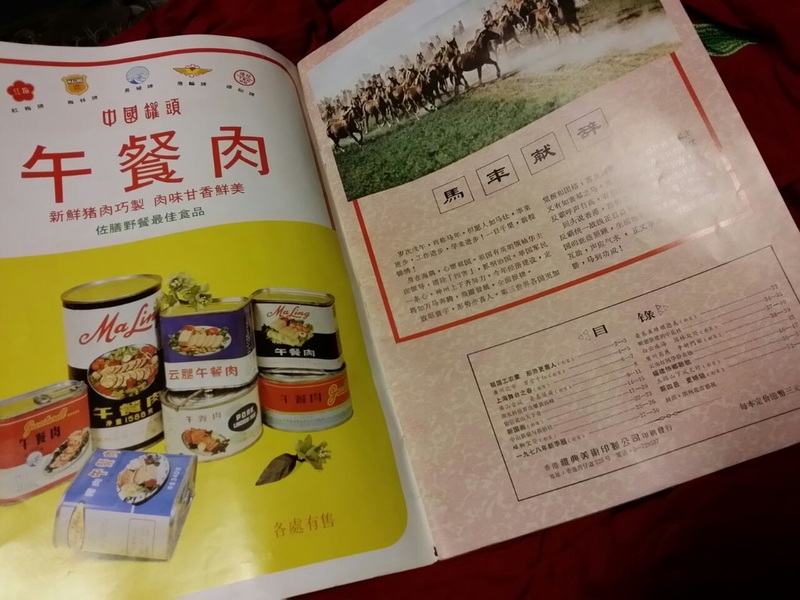 "During our school holidays in 1966, we had to read famous Chinese books and then do the assignments. I always got 'A's; very few students got 'A's. My friends always wrote few words only. I would write a full page as well as at the back of the page. 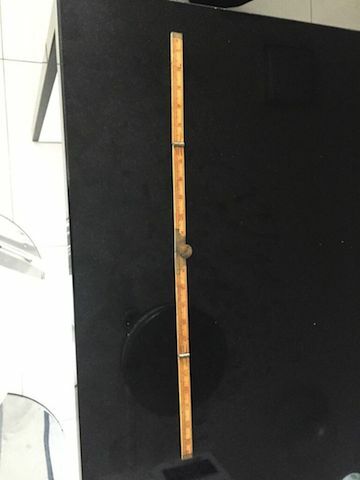 The size of the paper is longer than an A4. I did it with my heart so when I got an 'A', I was very proud and so I kept those assignments. I have the whole year's worth of assignments. I kept practising my handwriting. At the time, we used an ink pen." 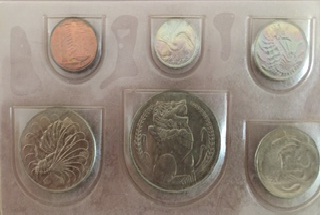 "These are 1-cent and 1/2-cent coins (top) from the 1940s, while the notes (Orchid and Bird series) (bottom) are from 1960s and 1970s. I keep them in my wallet. I also have some more at home. I keep them so I can show to people if they want to see them. With the notes, you can sell the Orchid one for $3 while the Bird one can get you $1.80." "My father wore this ring till the day he suddenly passed on in January 1994, at the age of 74. The metal and stone were both cheap material. In those days, there were people coming from the Malayan jungles called Orang Asli (aboriginal people in Malay). These people sold stones like this spread on the ground. My father could have bought from them. As to whether it was already cast into a ring, I am not sure. He was wearing it as far as I could remember. Maybe he had it before I was born. As far as I could remember he was always wearing it and it could be 100 years old. I retrieved the ring so that I could keep a part of him with me. That evening he passed away, I returned home and slept on his bed. His smell was still fresh amongst the bedding. I can still remember that smell." 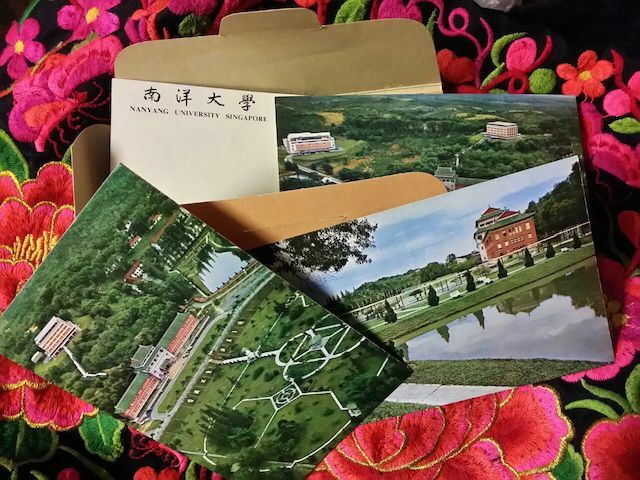 "I studied at Nanyang University for half a year in 1967 and bought these postcards. The school is no longer around and is replaced by the Nanyang Technological University (NTU), Singapore." 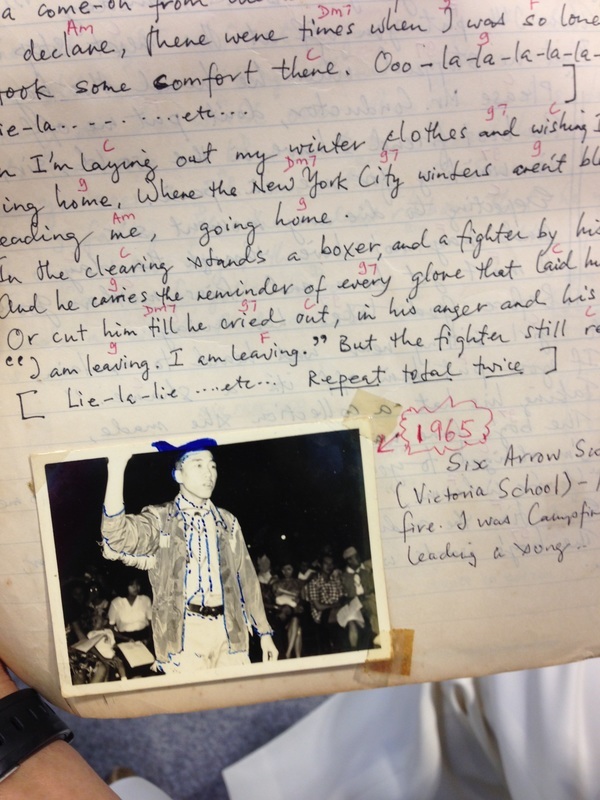 "I have a big box of postcards. Long time ago, we didn't have colour printers and if you like art or art works, you would keep these postcards. 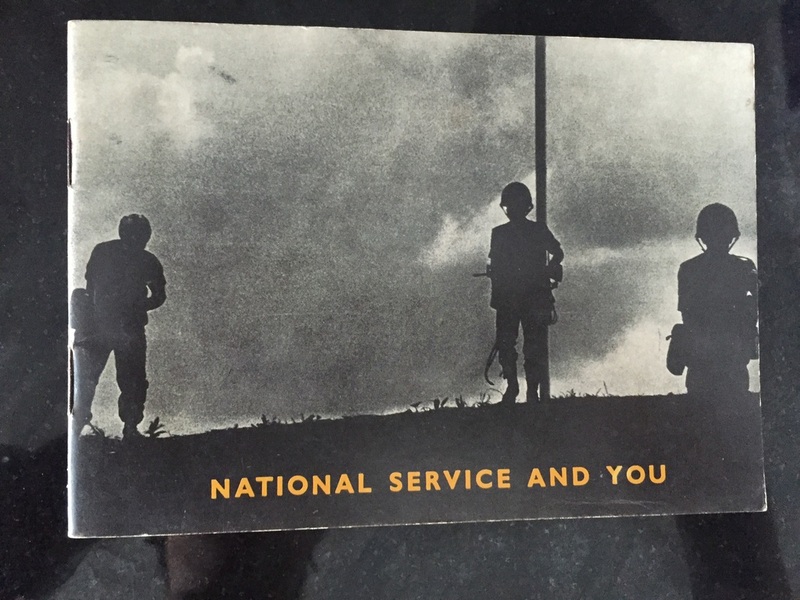 These postcards are from 1965. 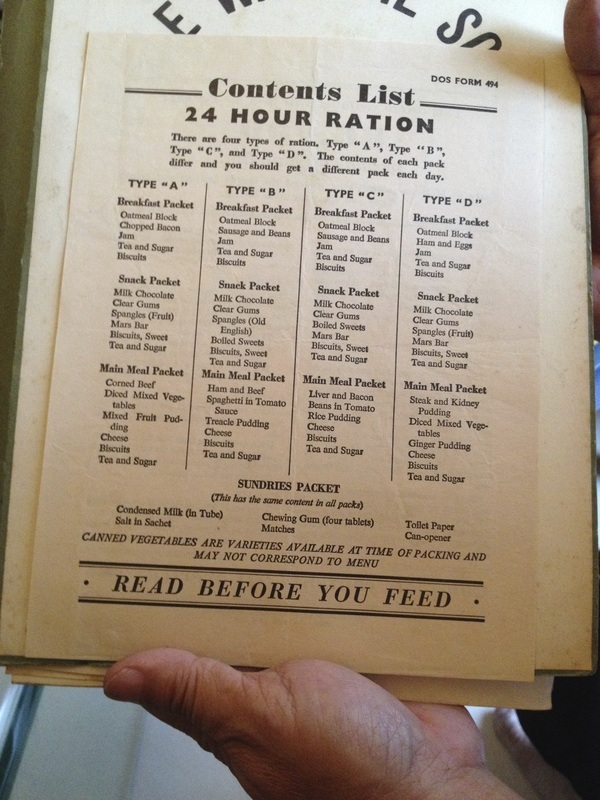 They were printed and given by bookshops when customers bought books." "In the old days, clothes, towels, curtains and bedlinen had to be washed by hand because there were no washing machines. Lighter items were manageable. However, thick cotton uniforms and bedsheets were extremely heavy when wet. 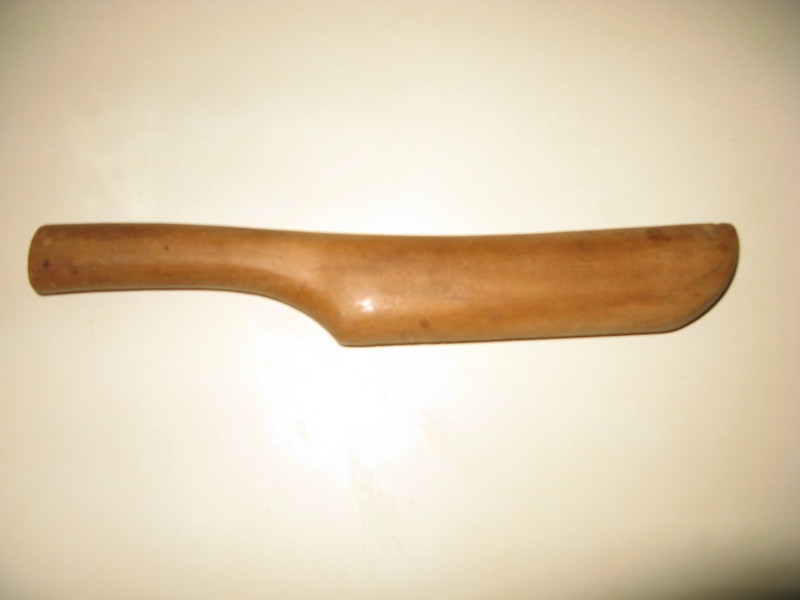 So this solid wooden implement was used to beat them over a wooden washboard or the concrete floor of the wash area. The process was not easy. There was no powdered or liquid laundry detergent then. All that was available were pieces of solid laundry soap. A piece of soap was rubbed on each piece of laundry and a brush was used to scrub it. Then it was beaten again and again with the stick to get soap suds. After that, it was rinsed in a tub of water and squeezed dry. This rinsing and squeezing had to be repeated a few times to get rid of all the soap suds. Can you imagine the amount of energy spent to wash a big family’s laundry? Therefore anyone who could afford it paid a washerwoman to do this tedious task. It was back-breaking work but the pay was paltry. 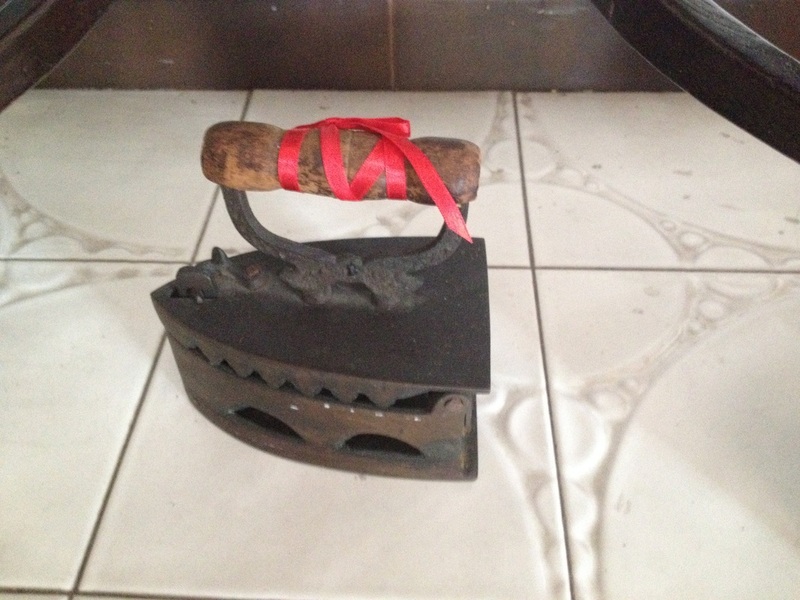 However, many housewives were willing to do washing for a few families each day to supplement the family income." "SATA greeting seals of 1962, 1963 and 1965 are shown here. 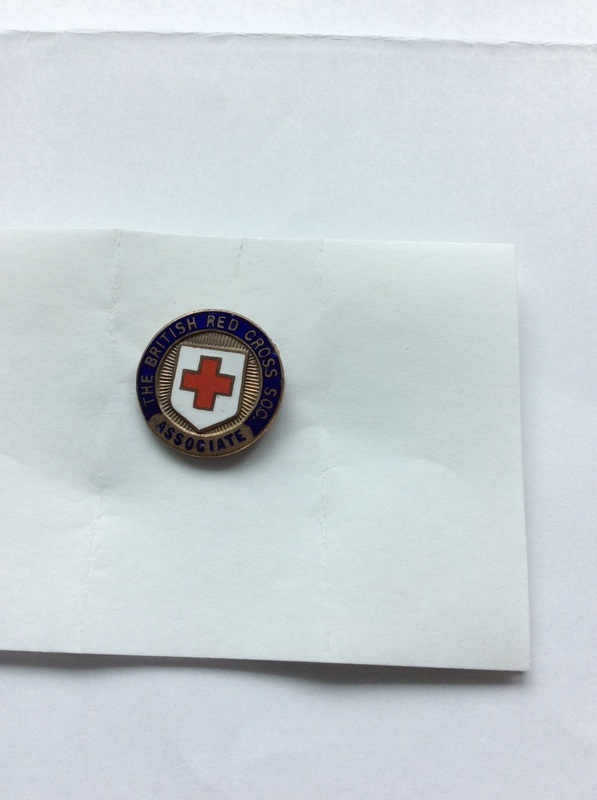 These seals are bought as donations to support the efforts of SATA (Singapore Anti Tuberculosis Association). The organisation's role has since changed with the improvement of healthcare. Please use these Greeting Seals on your Hari Raya, Chinese New Year, Deepavali and Christmas Cards. Use them, too, to decorate your letters, postcards and parcels locally or when you send them abroad."" 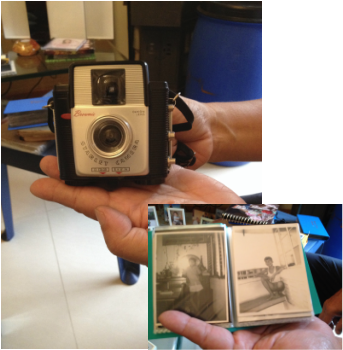 "This ca﻿mera is from the 1950s. You must use Kodak 127 film﻿. Sadly, I have since lost the flash!" 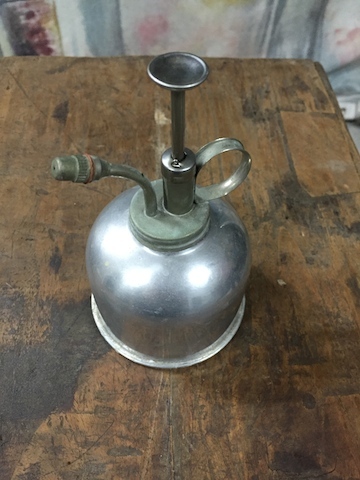 "The kerosene lamp was purchased from an antique dealer in Glasgow when I was there in 1997. The lamp has Chinese characters on it to confirm that it is from China. I was told that it is from a ship that had sailed the seas to England. This lamp to me is a “travelling light", that symbolises illumination and brightness, and serves to remind me that I should not carry a heavy load as I travel through life." "This was used in the ancient times in carpentry to smooth the wood. There is usually a blade in the hole. Where I have the glasses is where people would hold it to push shaver up and down to smooth the rough parts. I bought it from a second-hand shop which sells other things. I chose different sizes; I bought three for S$1 each. 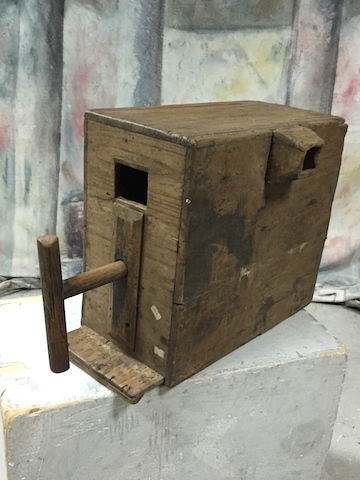 I liked it because it is an old thing that might have disappeared, and I can use it for decoration." 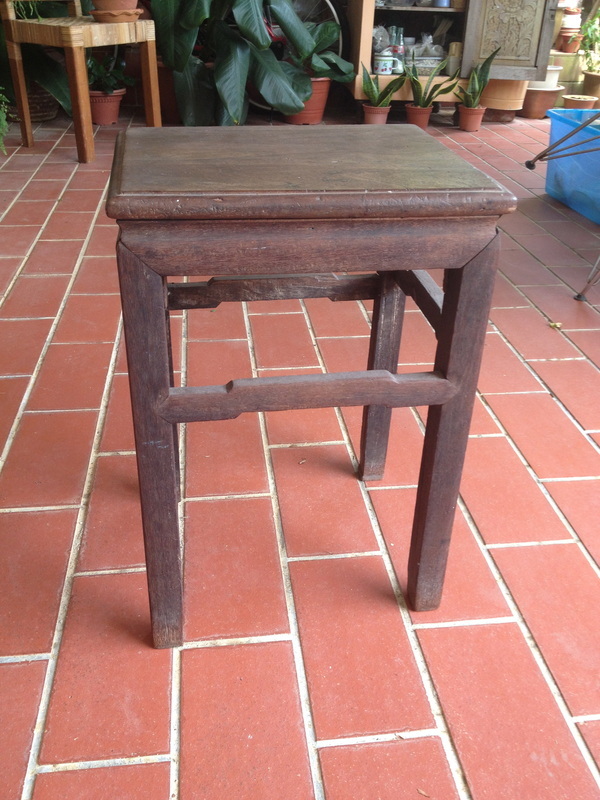 "I was told this stool, as well as iron, belonged to my husband's grandfather or great-grandfather and I must keep them properly." 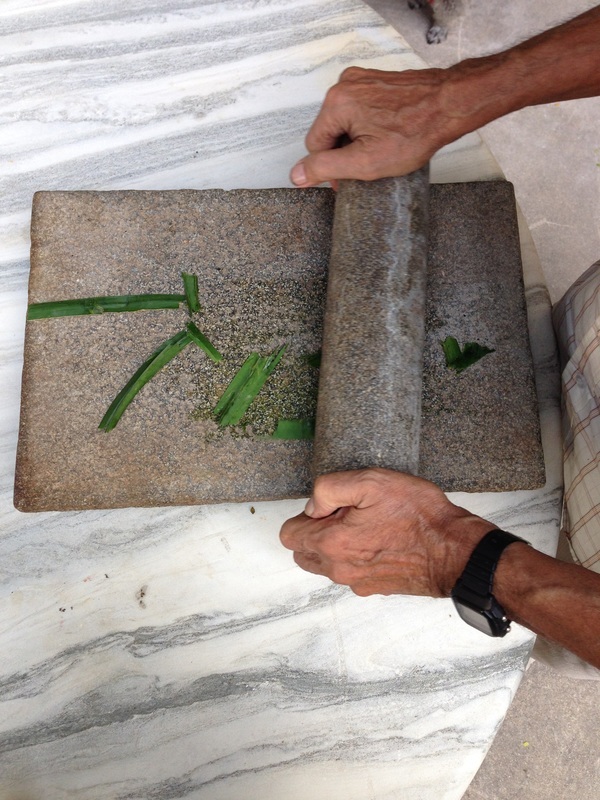 "I have a grinder that Malays used to use to grind chilli. 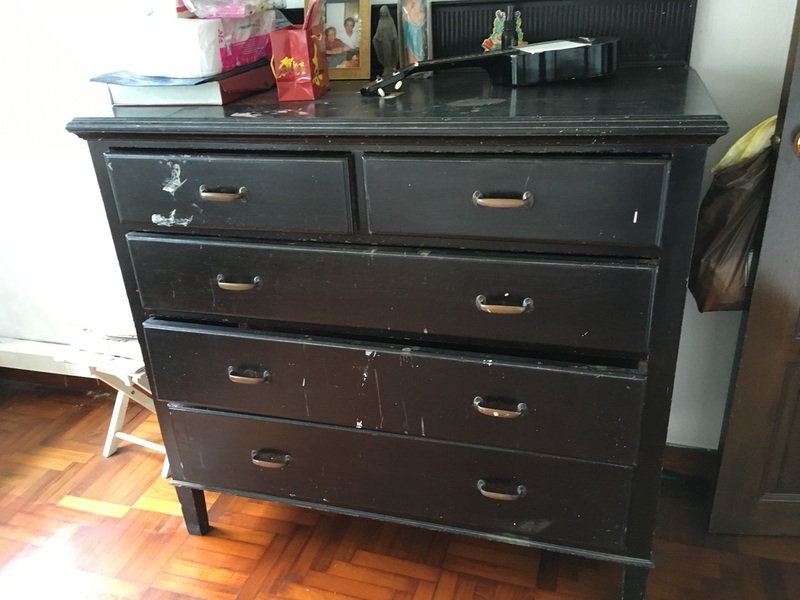 I got it from a second-hand shop and paid S$5. I found it old and full of culture." 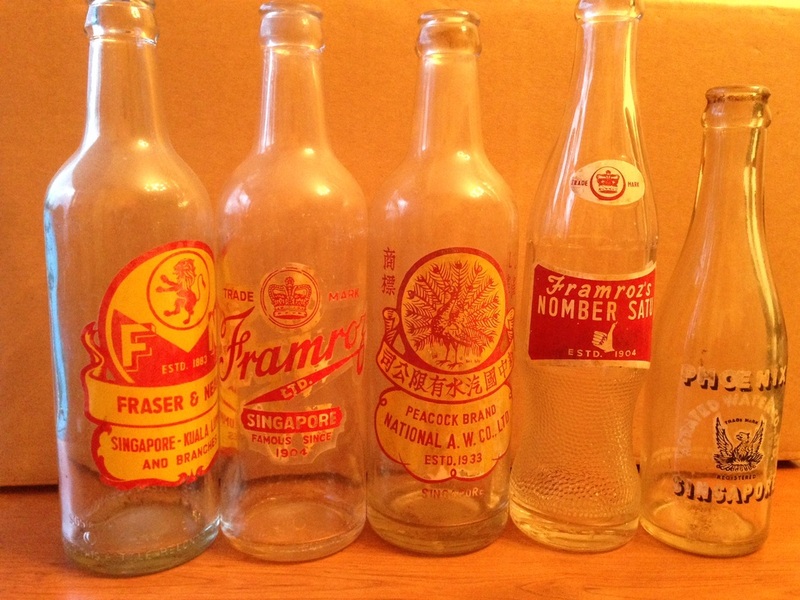 "I used to walk by a stationary shop at Joo Chiat Road, and eyed a pair of field glass which I liked to have. I was then in Secondary Two. I saved up enough money to buy it. Since then, it has strengthened my personal value system; that whatever I want in this world, I can have it if I worked hard and saved. I believe that this thought has been passed on to my children over time. 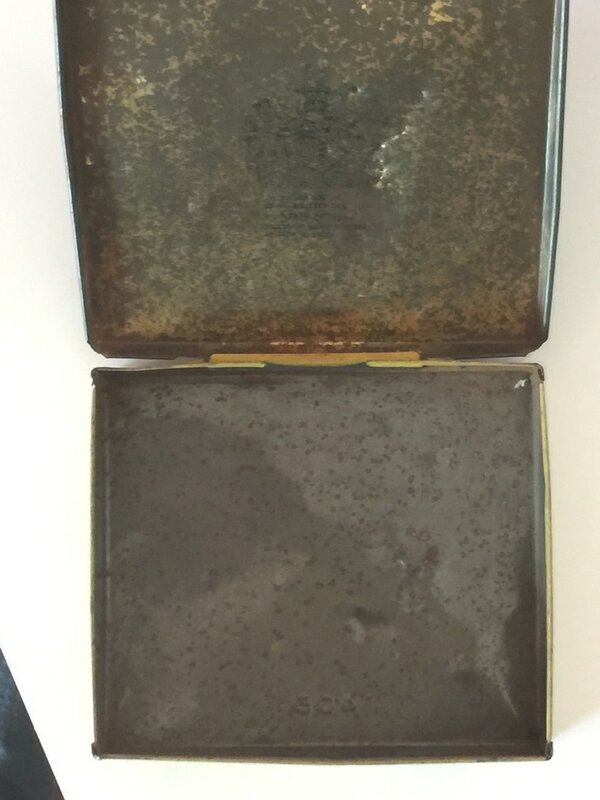 Though outdated in model and usage, I used this field glass when I attended parades in my younger days." "The cupboard has no nails. 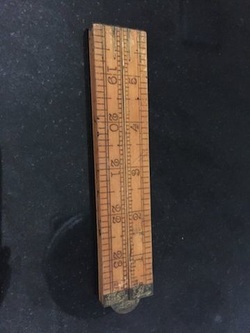 It was given to me by my mother-in-law when I got married in 1956. It actually came in a set, including the bed and chairs, and a coffee table. However, a thief came into our kampung and stole the coffee table and chairs. 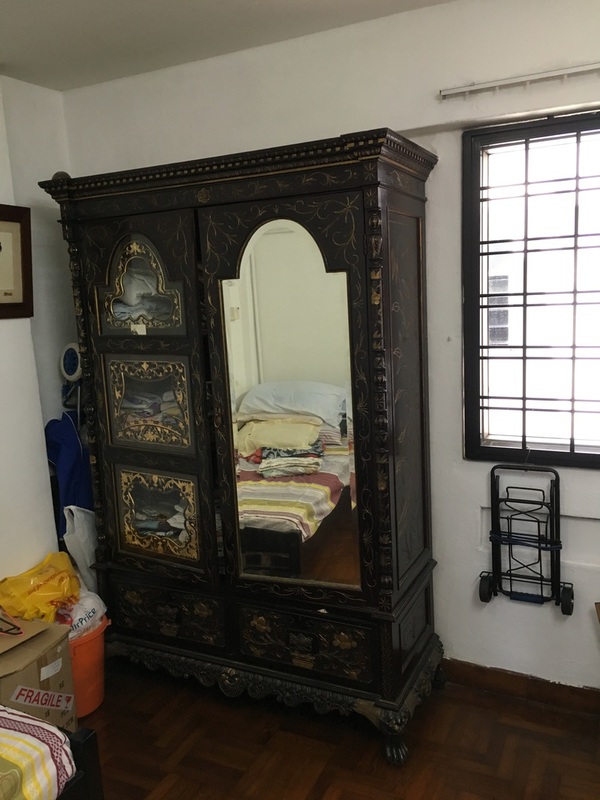 When I moved from the kampung, I decided to scrap the bed as it was too big to bring along, however, I insisted on keeping the cupboard as it was a reminder of my marriage. I currently use the cupboard to keep my clothes. I also wanted to keep the shoes I wore during my wedding but unfortunately, they were also stolen from the kampung." "My son made this for me. Of course, it is very important. He was the only child that I was able to send to Australia for further studies. He is my youngest son. 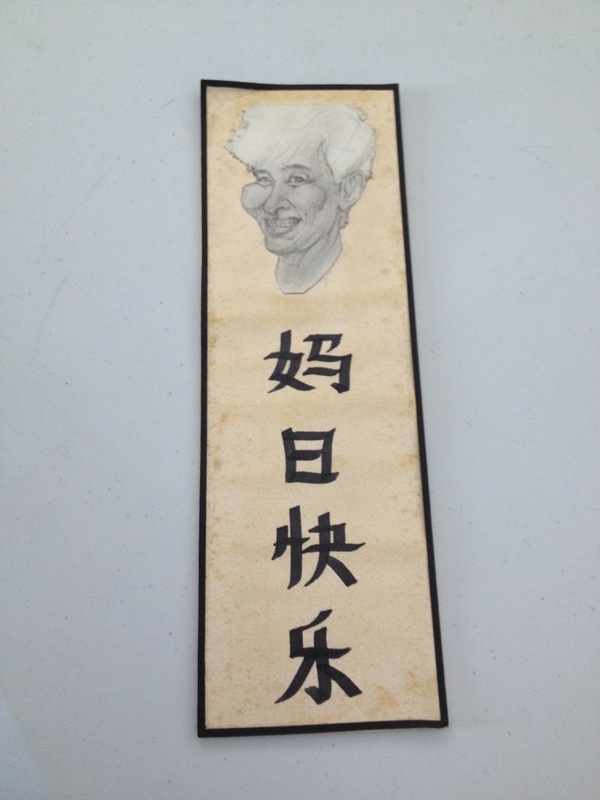 He sent this to me by mail in the 1980s on Mother's Day to wish me a Happy Mother's Day." "In 1985, Singapore was at its peak of its economic growth cycle before the recession hit that same year. That year was also Singapore's 25th birthday. 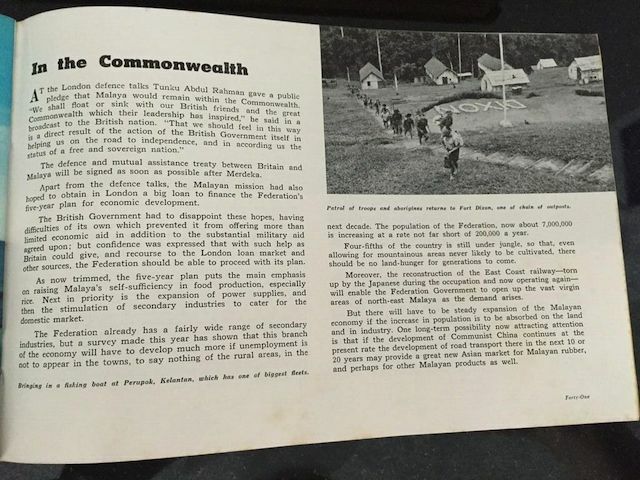 Citizens were full of pride for the nation's achievements, hoping to attain Swiss standard of living some day. 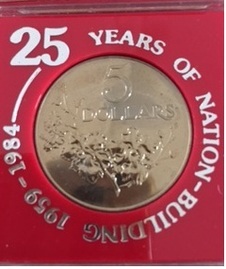 I got this silver-plated S$5 coin, which was released by the Singapore Mint, when I was at the time volunteering in a Residents' Committee." 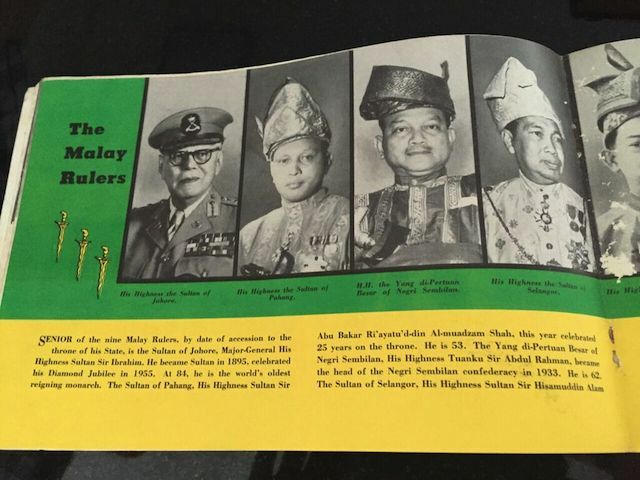 "Malaya became independent on August 31, 1957. 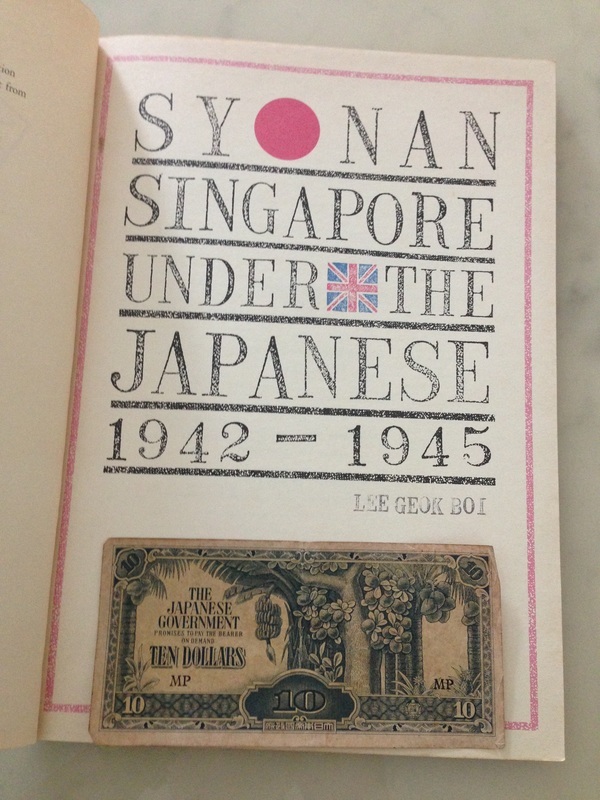 To commemorate the occasion, The Straits Times published a small booklet and it was sold for a dollar then. 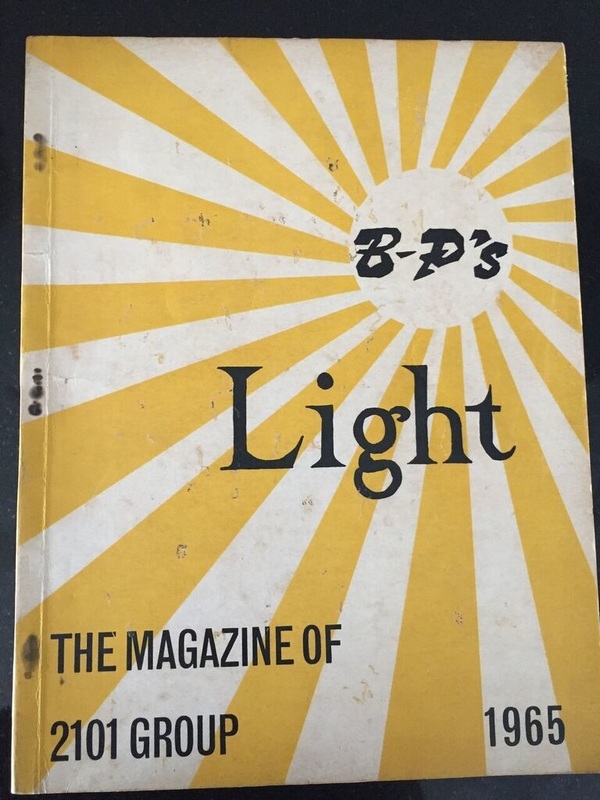 My father bought a copy and it was passed on to me after he passed on in 1968. I kept the booklet to this day. 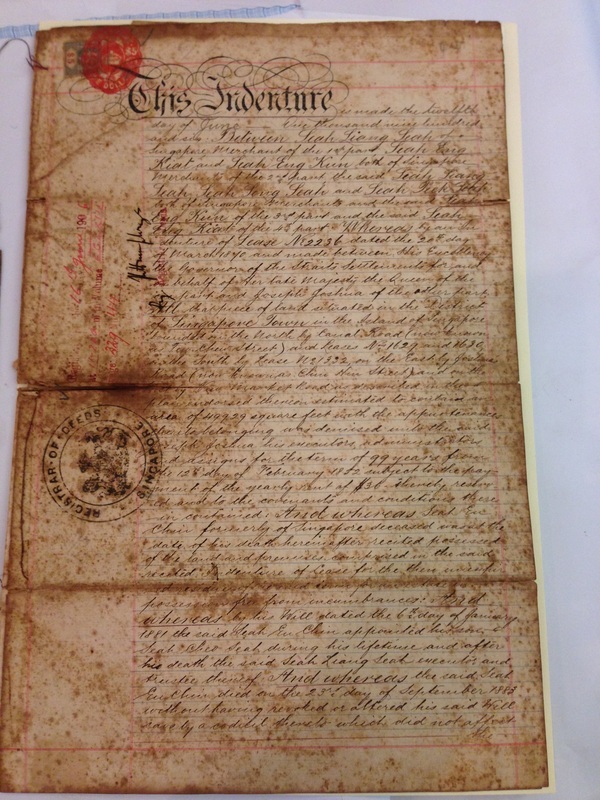 It is a 60-year-old document." "This was 1978 when I was a member of the 3rd Singapore Division (this is a military division of the Singapore Armed Forces). It comprised of infantry brigades and had its support elements of artillery, signals, combat engineers, armour units and other assets. I recall that I was posted to the headquarters as the Division G1 in charge of personnel. They made these cups only that one year and I decided to keep them. I have six of them with me still. 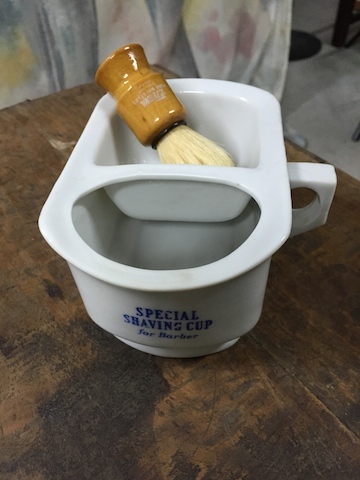 These were actually made for souvenirs for visitors who came to the division then." “I bought all these objects. Most of these items I bought from shops in Malaysia. The prop trade secret is that the dealers have ‘runners’ who buy things and sell to them. During her retirement, she continued teaching, gaining extra income from tuition." "I didn't move anything. They are all in the drawers and I kept all the items. I remembered my Aunt Marie in a Red Cross uniform and after a bombing raid in Singapore, she went out to help. After one fierce bombing raid, she came home with blood on her shirt. She must have been carrying someone who was wounded. My grandmother saw this when she came to the door and screamed at her on what happened to her. 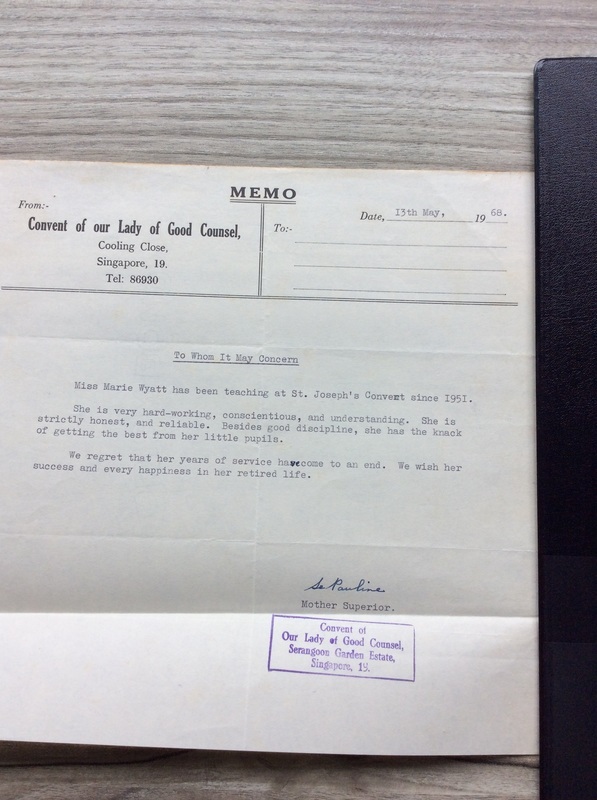 She was volunteering with the British Red Cross for the three weeks or so that the British forces were still defending Singapore." 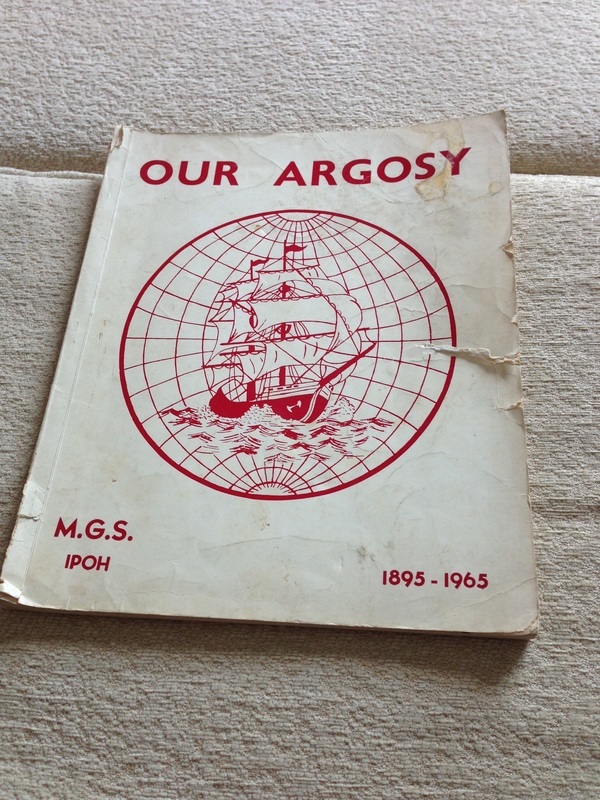 "This is a school magazine that came out in 1965 to commemorate my school, the Methodist Girls' School in Ipoh. My photo is inside so that is why I didn't throw it out. I was in that school from 1946 to 1955. 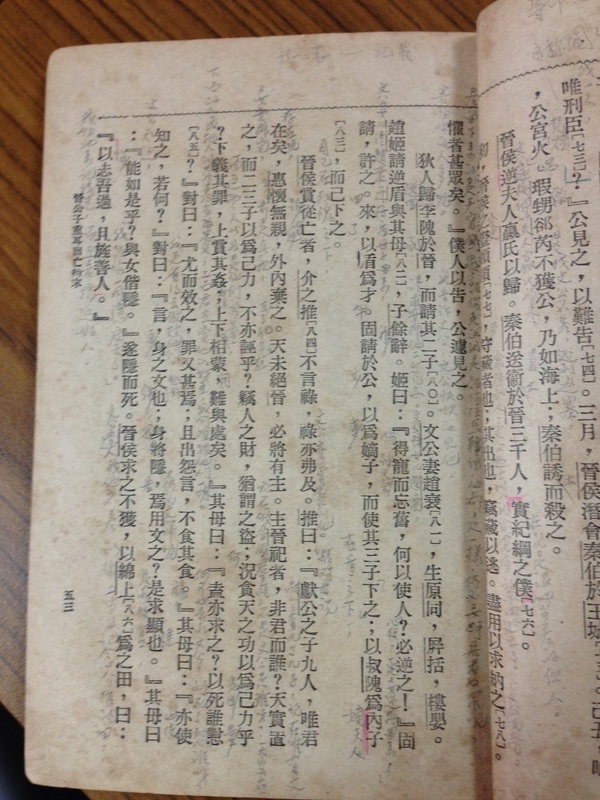 The magazine shows the former principals of the school as well as the teachers. It is hard to remember the names of the people. I also kept it because it has my class photo and I still remember the names of the girls in my class." 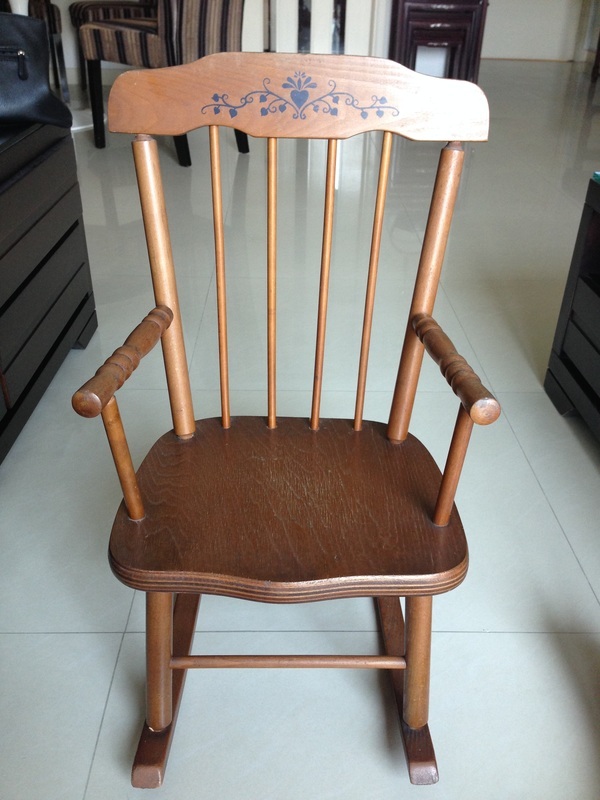 "This is a rocking chair that is made in Scandinavia. I think I bought it in the early '70s and it was used by my son. I have pictures of him sitting on it when he was a little boy. The chair is joined together and there are no nails. I almost threw it away but I didn't as I thought it was cute. 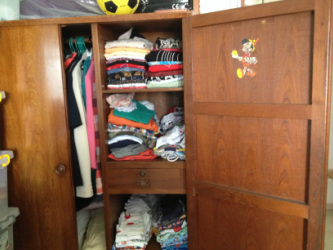 It didn't take up much space so I decided to keep it." 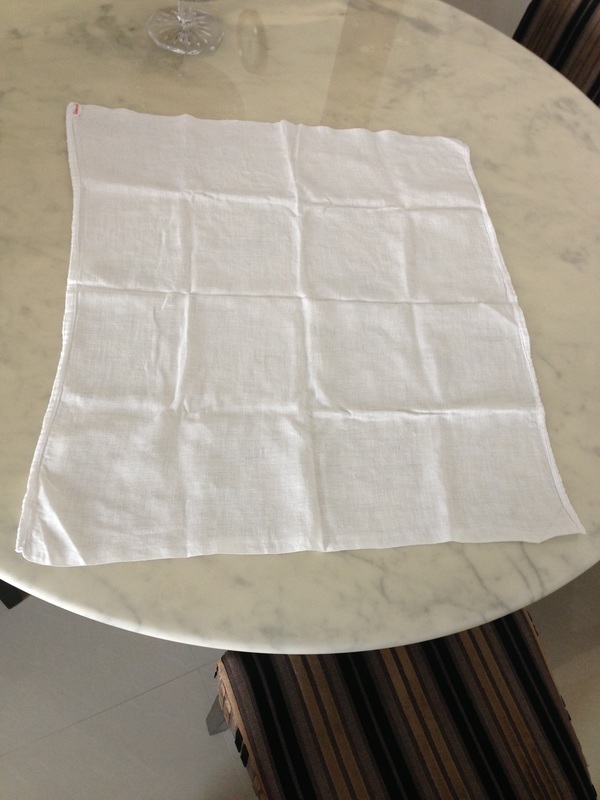 "My husband's mother who was Peranakan made this baby cot blanket and matching bed sheet. She gave it to me when my son was born in the 1960s. It is made out of cotton and oblong in shape. She took a lot of trouble to do them and they are a labour of love. I keep these for sentimental reasons." 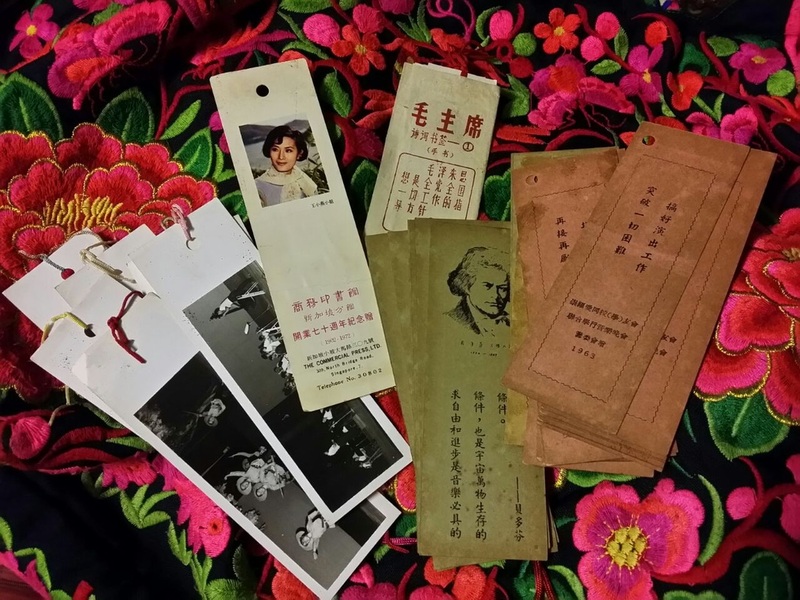 "My mother came from China and was very traditional. 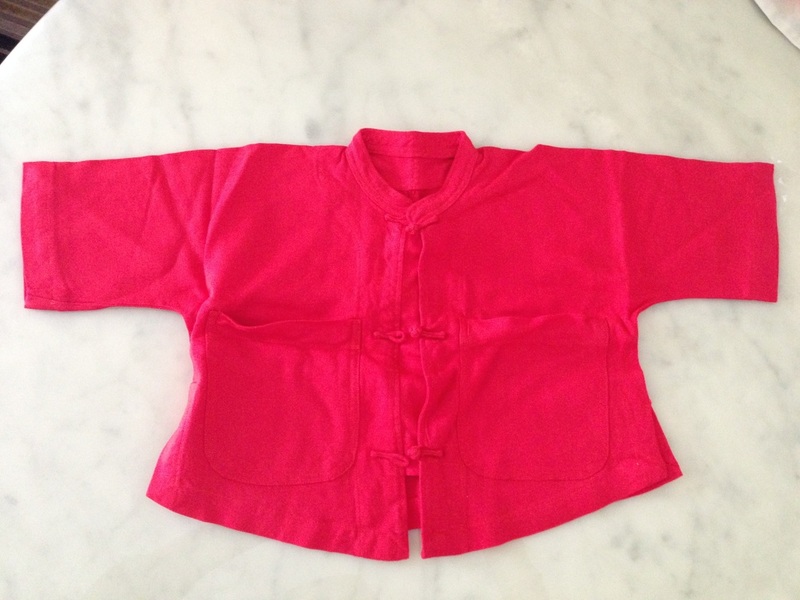 She made this for my son (with the Chinese buttons and all) and it was to be worn when he was one or two years old in the early '70s. There is no elastic on the loose trousers so there was a string to tie it. The matching outfit was made of cotton. My son never used it as I am not very traditional." "My mother gave me these in the early 1960s for my first child. 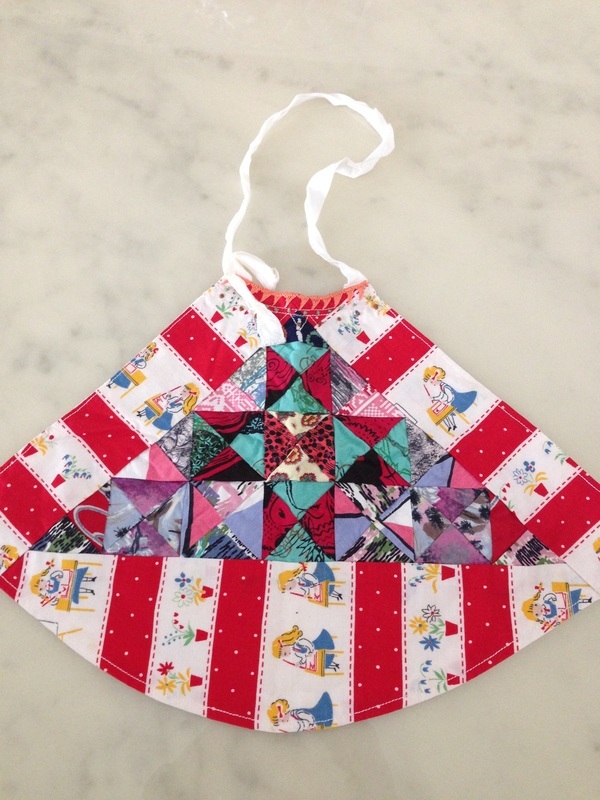 This would go on the tummy of a baby to keep it warm so the baby won't get sick and catch a cold. Each piece is different and it was handmade by my mother. The string on top is to tie it around the neck. There is a lining behind it. 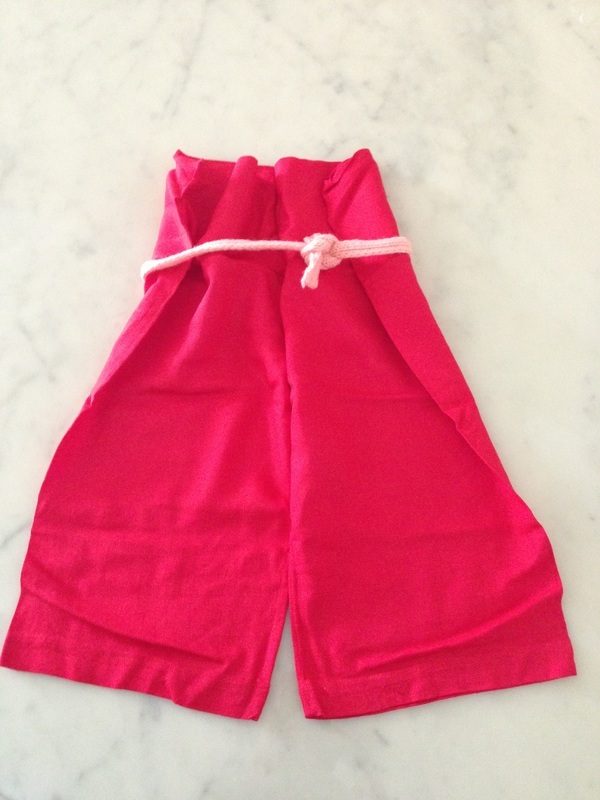 They were to be used during my child's first year but I never used them as I felt they would be too hot [to have on]. However, I kept them as I really appreciated my mother's love in making them. It was at a time a very traditional gift." 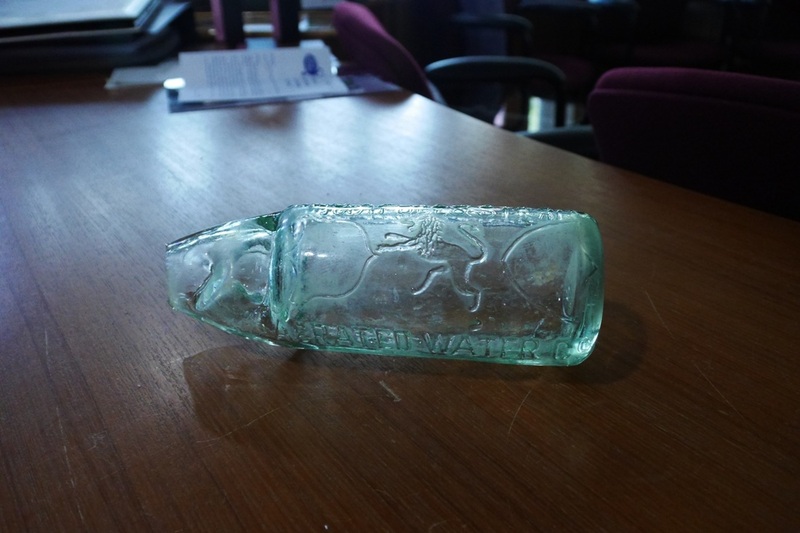 "Someone threw this out and I decided to pick it up. I knew what it was used for. It is the predecessor to the pestle and mortar. 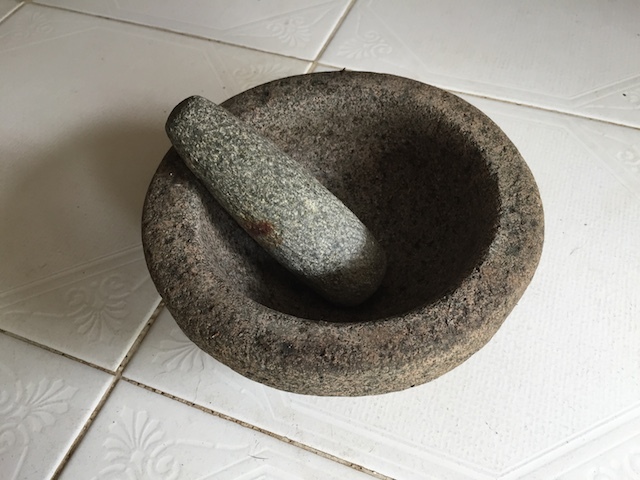 According to my 85-year-old Indian friend Joseph, it was used long time ago in the kitchen to grind spices and chili, as well as onions, garlic and shallots. It came from India. He also said that you must put water or else it becomes pastey. 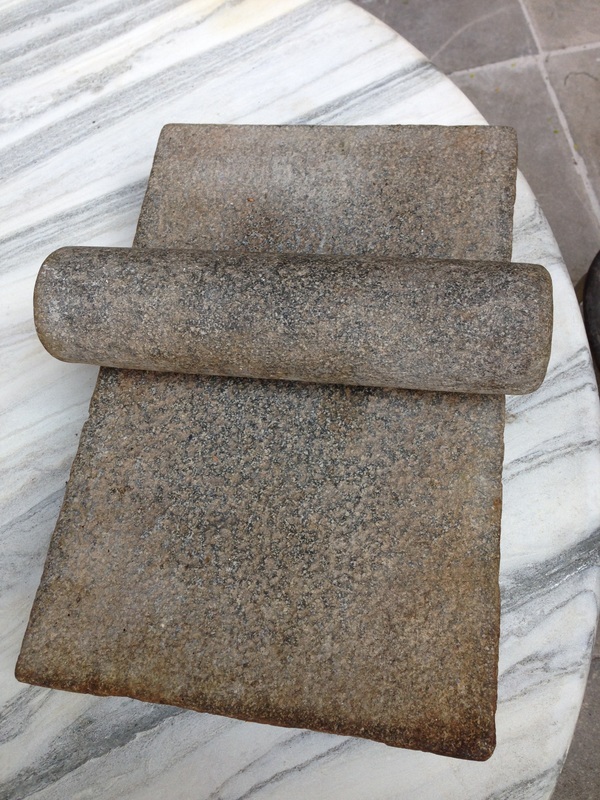 Some of these [heavy] slabs came in smaller and bigger sizes too." 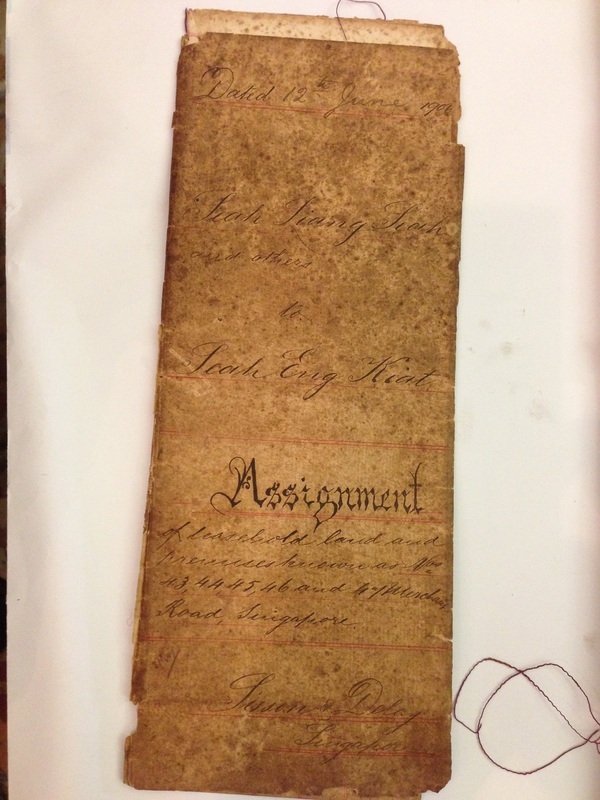 "On top is the certificate of admission from the 1930s owned by my grandfather when he was 36. 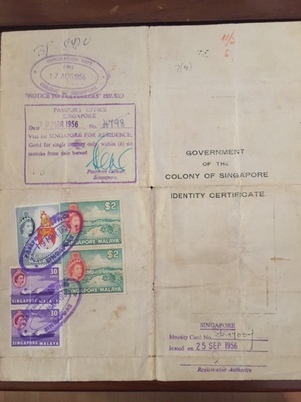 The other one below from that is the landing permit of my grandmother, and the last one on top is my grandfather's certificate of registration. I trace back on the Internet during the period of what happened so I can understand the thinking behind the family and I can treasure my own life and family better." 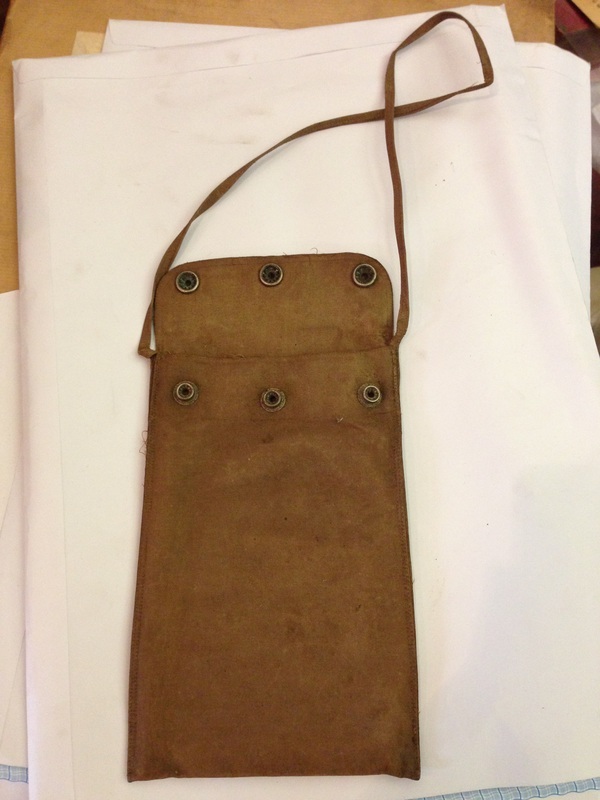 "This was my grandfather's travelling canvas pouch. 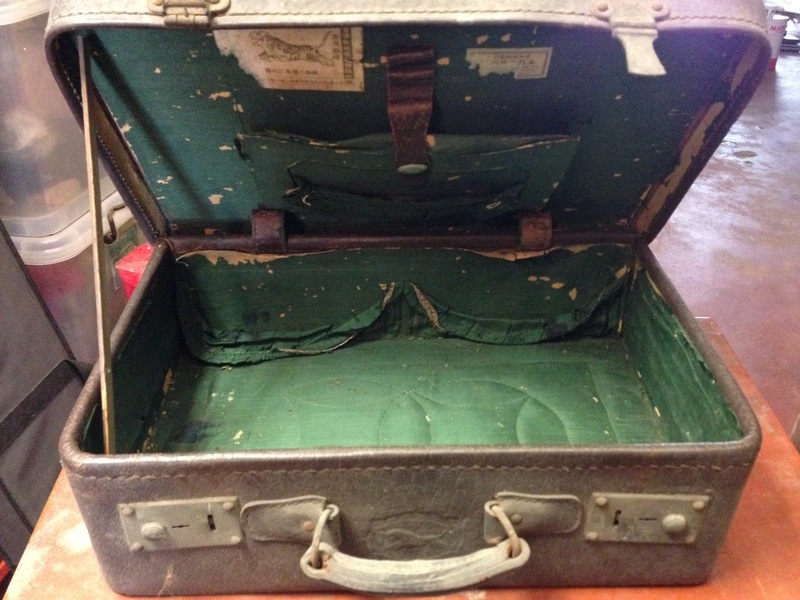 When he travelled, he would put his documents in there." 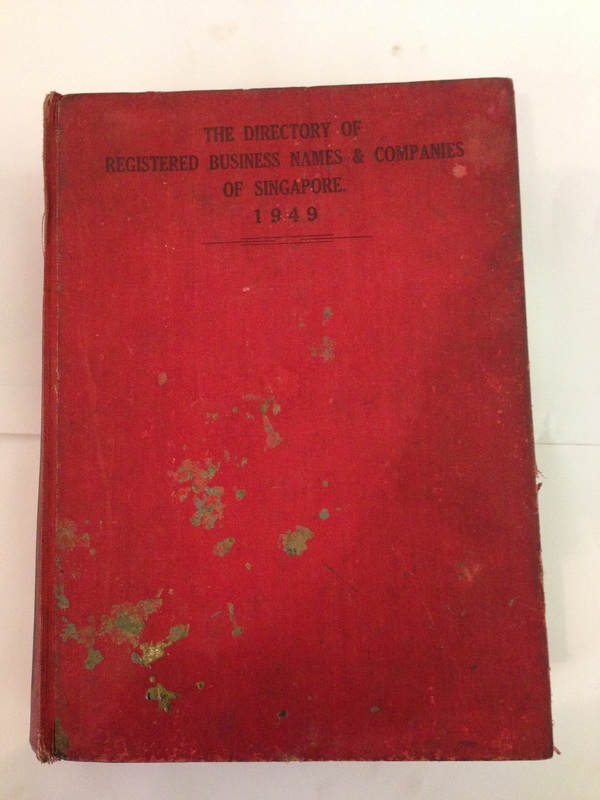 "If you have a shop in Singapore, you must buy this book called "The Directory of Registered Names & Companies of Singapore". It is from 1949. I even have the receipt for the book! 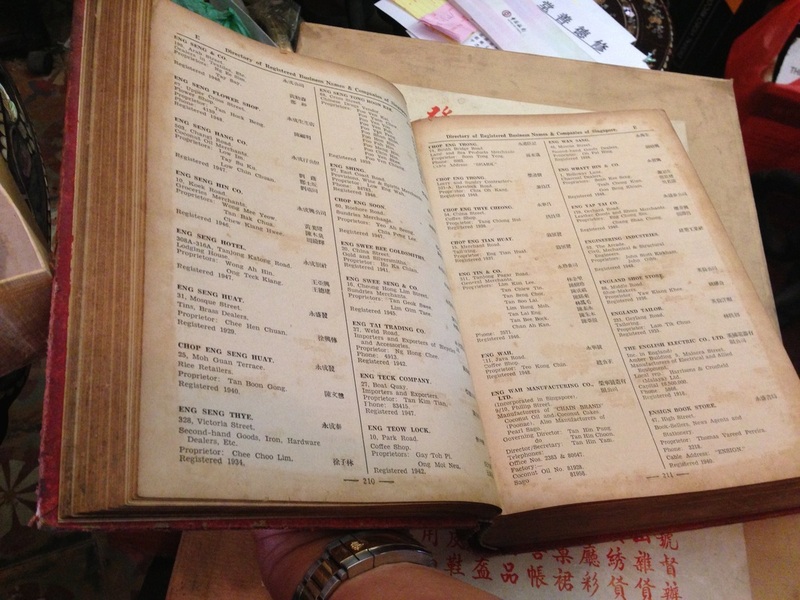 My grandfather's shop was listed in it." 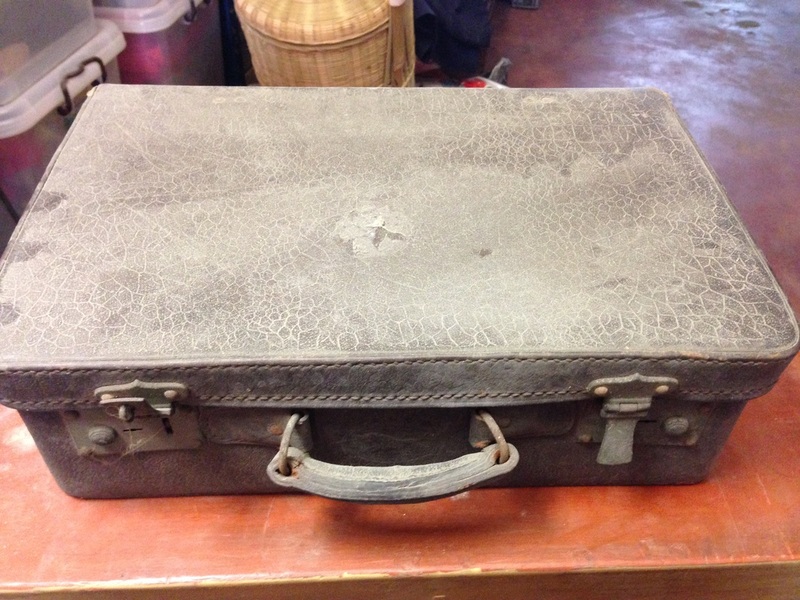 "This is my father's leather school bag from the late 1940s when he went to Dong Moh Primary School at Tank Road (there was a railway track before that school was built). Where the school was, it is now a Teochew building." 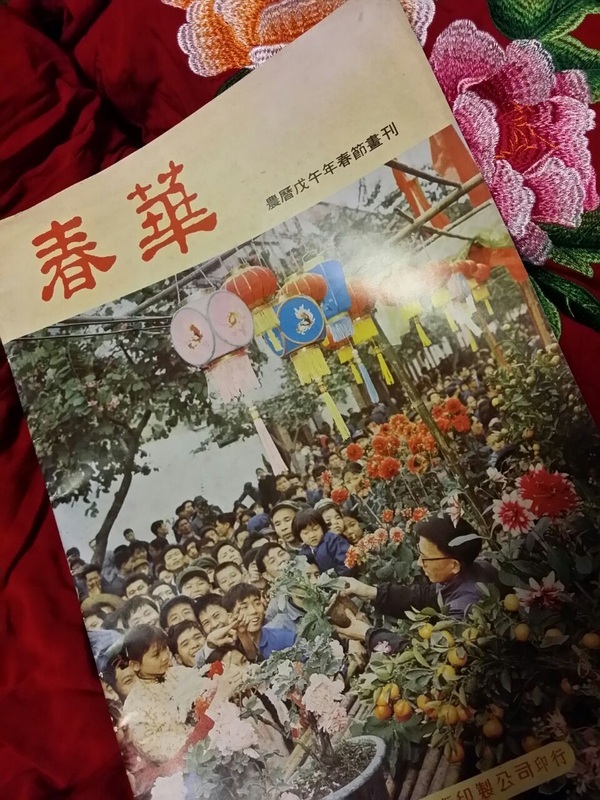 "This was a New year magazine dated 1978 from China (which was circulated in Singapore). Inside, there are a lot of photos and on the centre page, there is a huge calendar of the new year. I keep the magazine because I like the different craftwork pictures inside as well as the pictures of the stage performances." 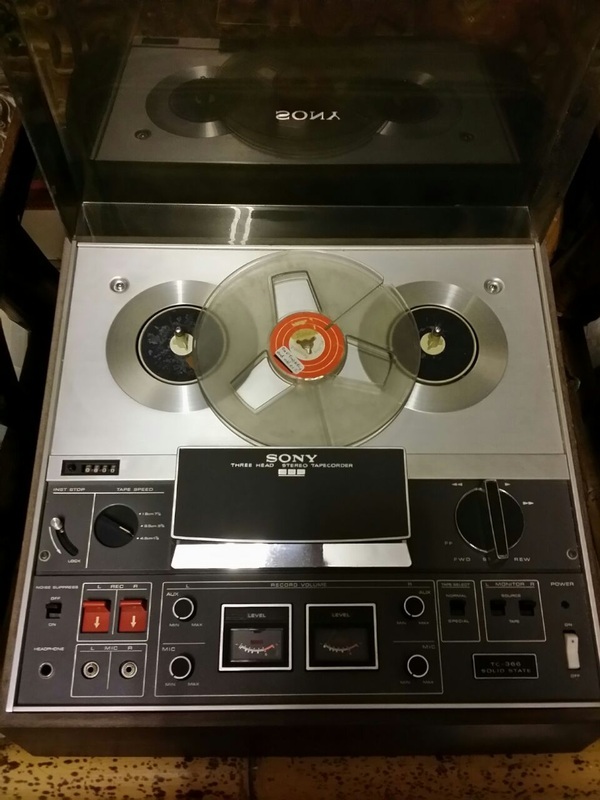 "My father had money so he bought a tape recorder in the 1960s. Today, tapes are smaller in size. 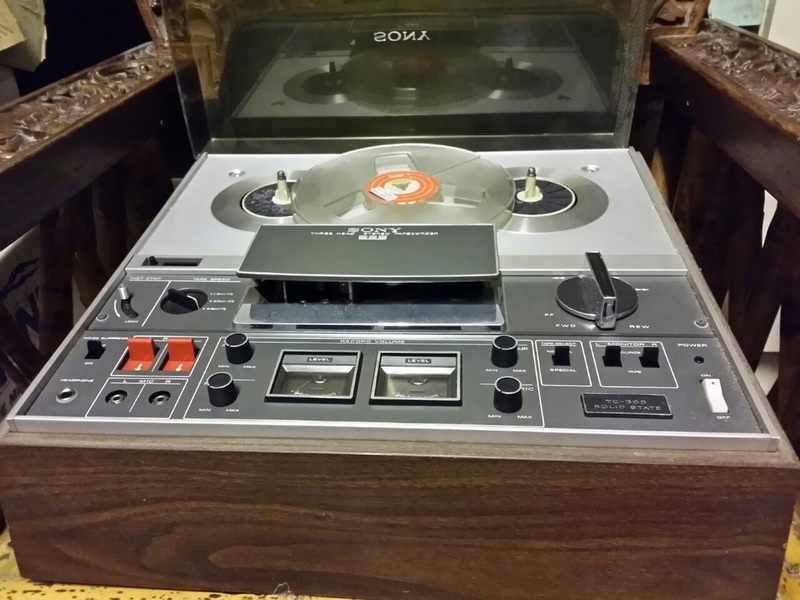 I used it to record the music of stage performances and opera that was on Redifussion (radio channel). Tapes were very expensive so I would re-record on the tapes." "In 1967, while in confinement in camp during a Basic Military Course, we were asked to donate our blood in exchange for a half-day off. This was an enriching experience, and since then, I have donated about 15 times before I was instructed to cease because of my health." 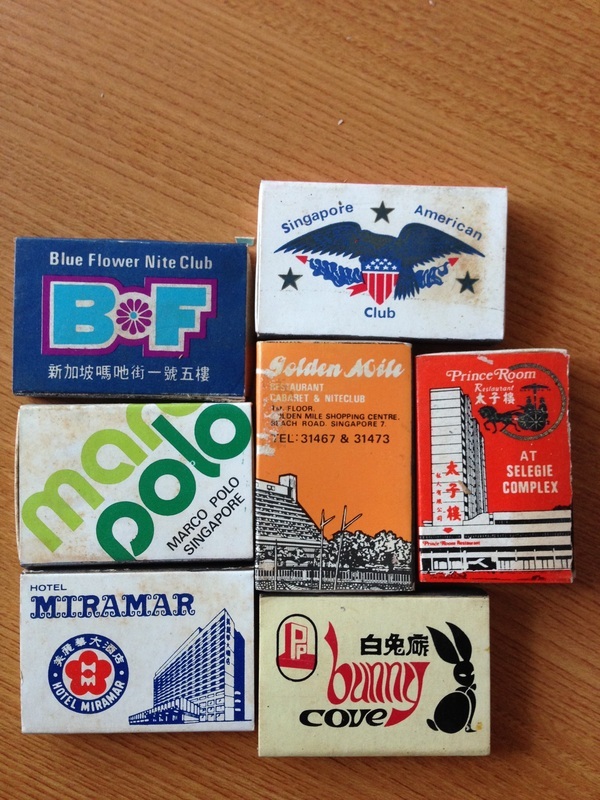 “These matchboxes are from the 1970s and taken from nightclubs, hotels and restaurants in Singapore. Every time I went to these places, I would pick up a matchbox. At these places, there were many people smoking and in those days, cigarette lighters were not prevalent so they had these matchboxes instead. Even if I had duplicates, I would still keep as I would feel very sayang to throw away. 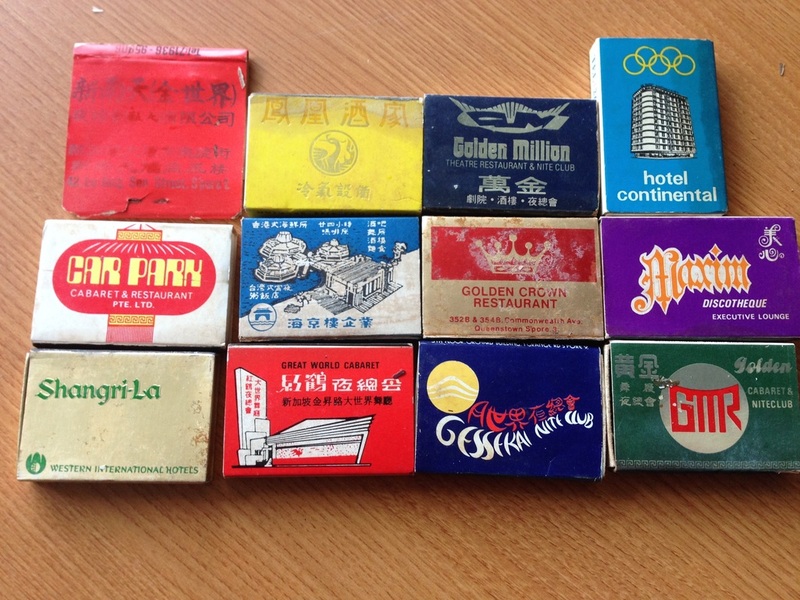 I have approximately 200 matchboxes, including from other countries like Bangkok and Malaysia. I also keep them so I can remember that I went there. Some of the places are no longer around or they may have changed." 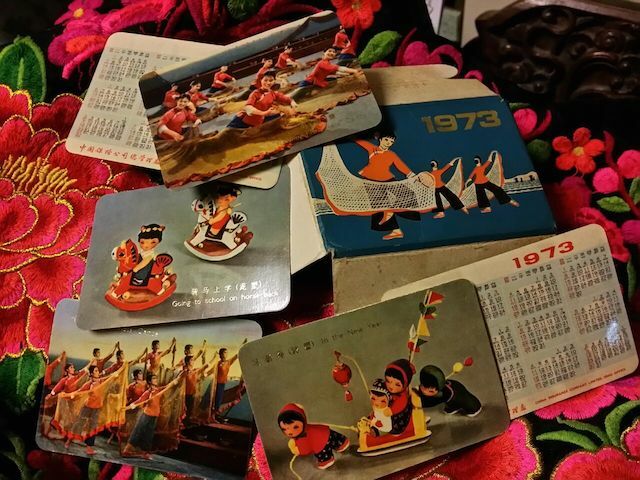 "I have over 40 bookmarks from 1950s to 1960s. Some came from bookshops giving them out as promotion to their shops (for instance, top picture, the woman is a film star). 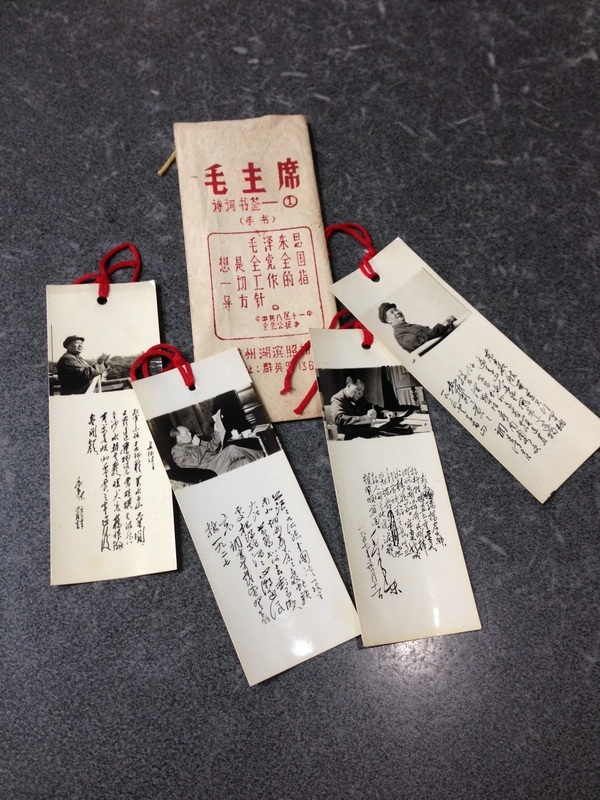 Some bookmarks are from associations and have pictures on the bookmarks of their activities. 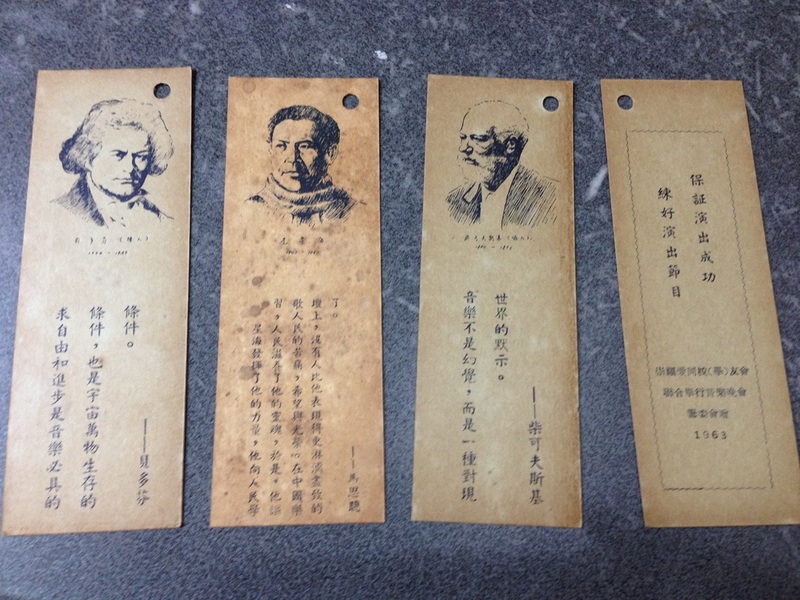 I also have bookmarks which has Mao Zedong's poetry (second picture). These were secretly given out during my school days. The bookmarks (third picture) were given as I was an alumni. 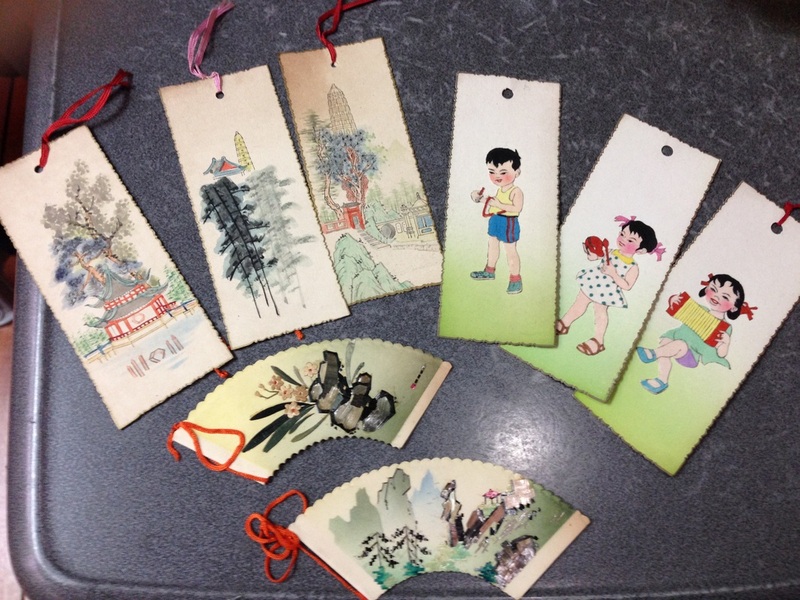 I also bought these hand-painted bookmarks (fourth picture) from China at local bookshops. One set has more than four bookmarks. A set costs 50 cents, which was very expensive for us as we were students at the time and we had no money so we had to save to buy them. Also, if you look at the fourth picture to the fifth picture, the bookmarks got more commercial and less on country and people. Plus, they got more expensive at $1.40 for a set of four." "My late mother-in-law presented this vase to me when she was alive. She said it was presented to my late father-in-law by the British just after the World War II. 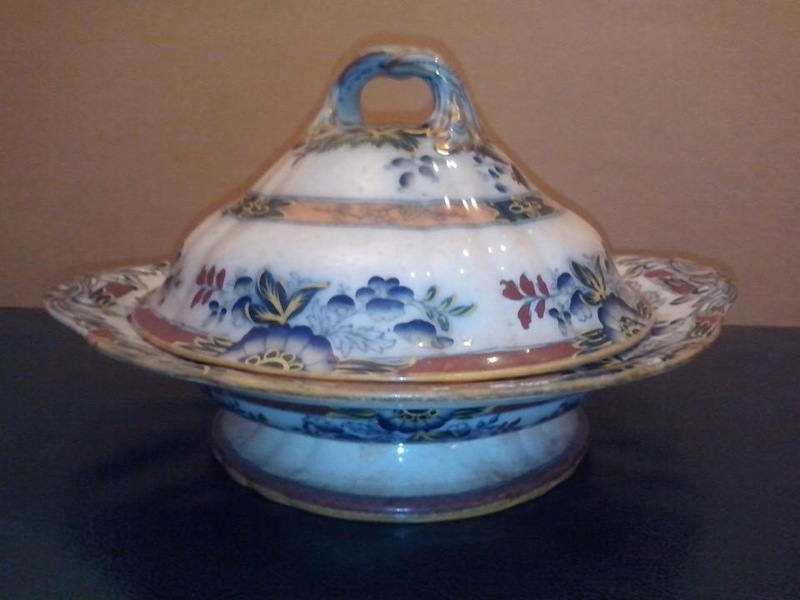 I will treasure this oriental piece made by Adams and Sons, a well-known pottery in England then. From the inscription on the pottery, it seems that it was made in 1938. This vase will be part of the family and will be passed from generation to generation." 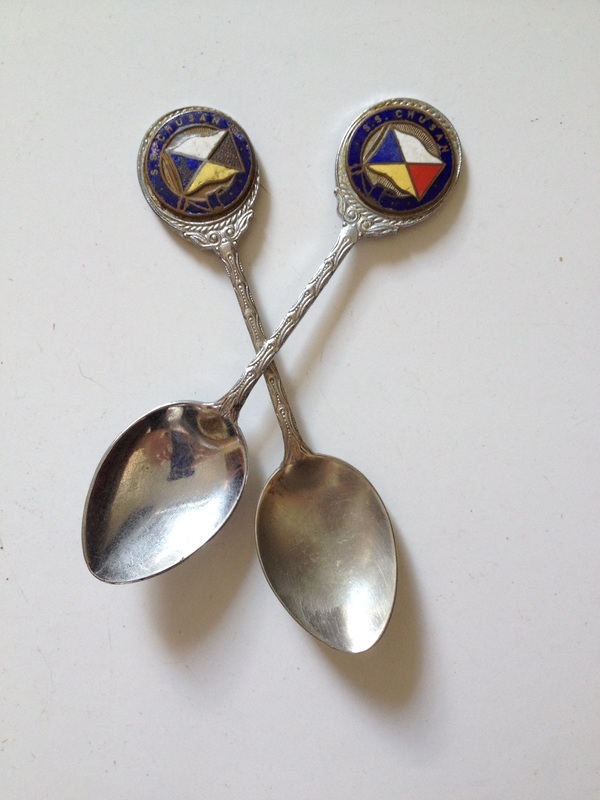 "These spoons are souvenirs from a cruise ship called the Chusan. 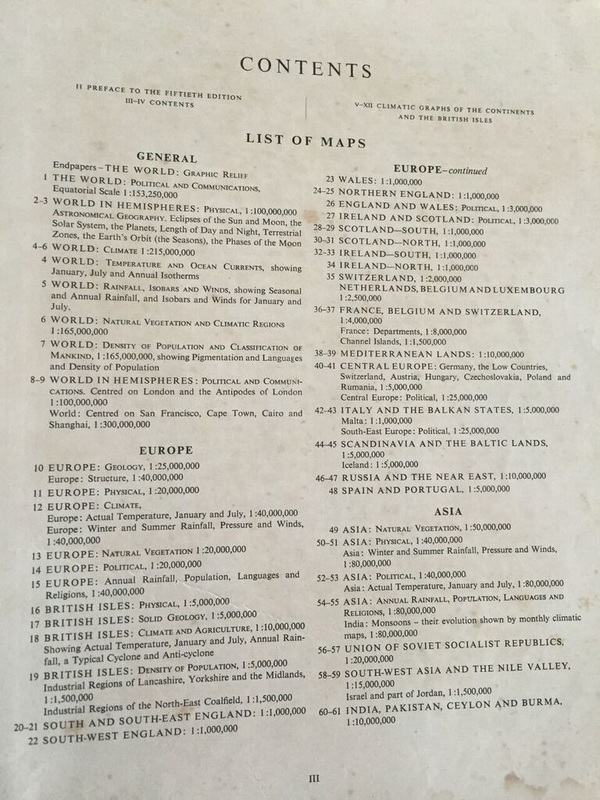 My father-in-law travelled from Singapore to Japan in 1955 and visited the cities of Hiroshima and Nagasaki, the cities that took the heat of the atomic bombs in 1945. The ship belonged to the P and O Lines, a big time tour group of the times. The ship was scrapped in 1973. My husband has six of these spoons and will present one each for our six grandchildren." 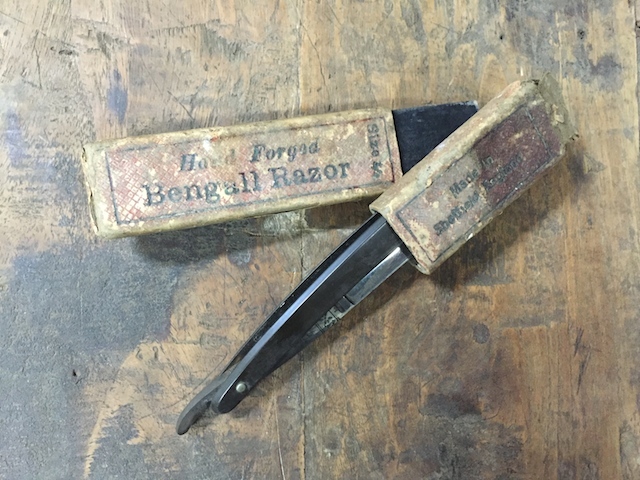 "My mother gave me the antique razor and asked me to pass down to future generations. 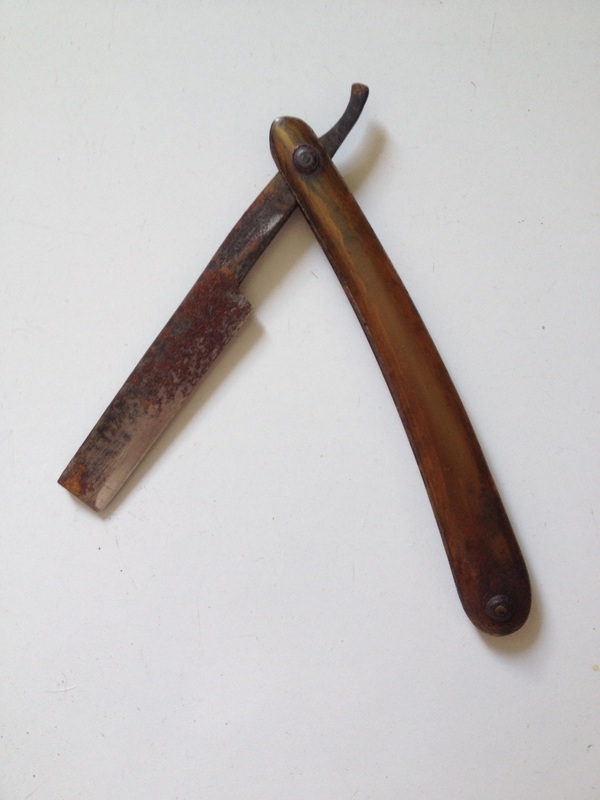 According to her, the razor was used during the end of the Qing Dynasty. 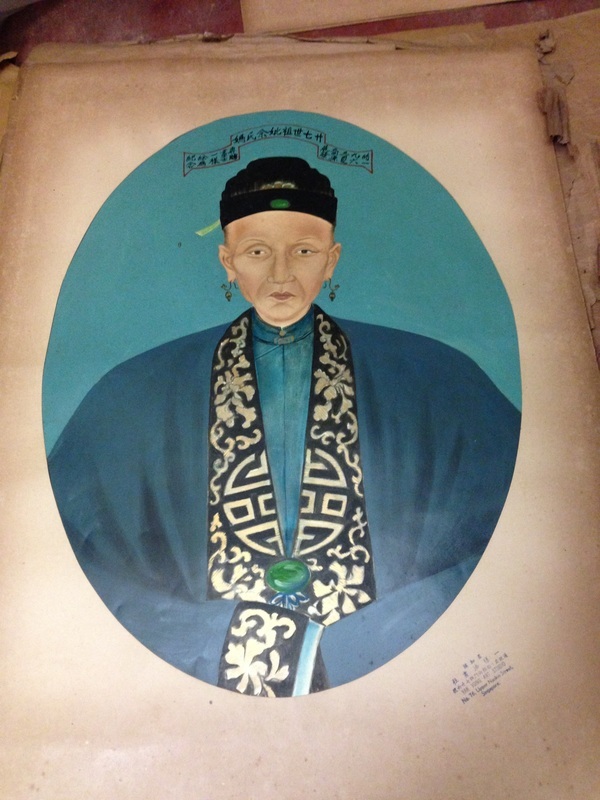 It was used by her mother to shave off the ‘pigtail’ just before the 1911 revolution in China. This item must then be a century old!" "When my two children we young, we thought it appropriate to start them with books. Unlike today, there were no computers then. So every step is manual. We were all issued with four cards each, meaning we could borrow up to four books. 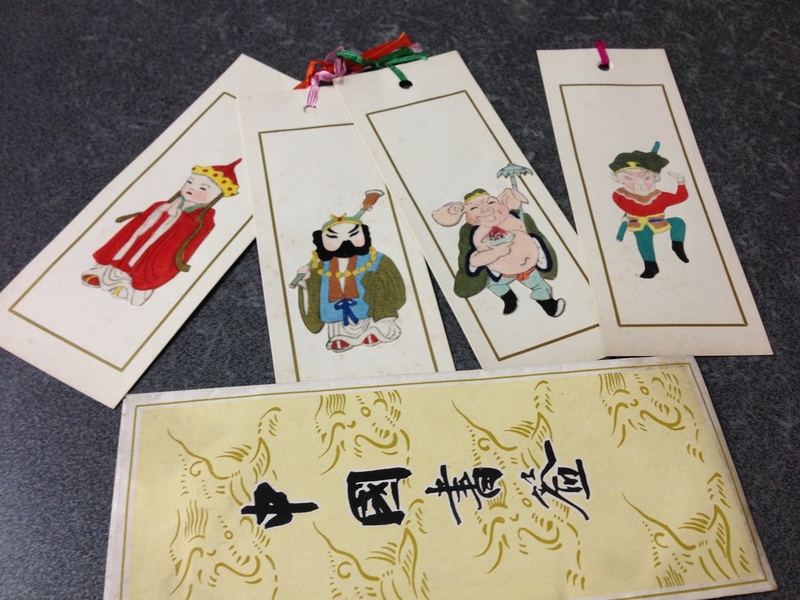 The adults had brown-coloured cards, while children had red ones. 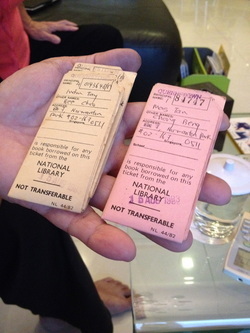 Whenever we borrowed a book, the book index card was slotted into one library card and retained by the library staff. Only upon the return of the book, will the library card be returned. I kept the cards so that our children and grandchildren could understand the importance of reading and learning. These will be presented to them on an appropriate occasion." 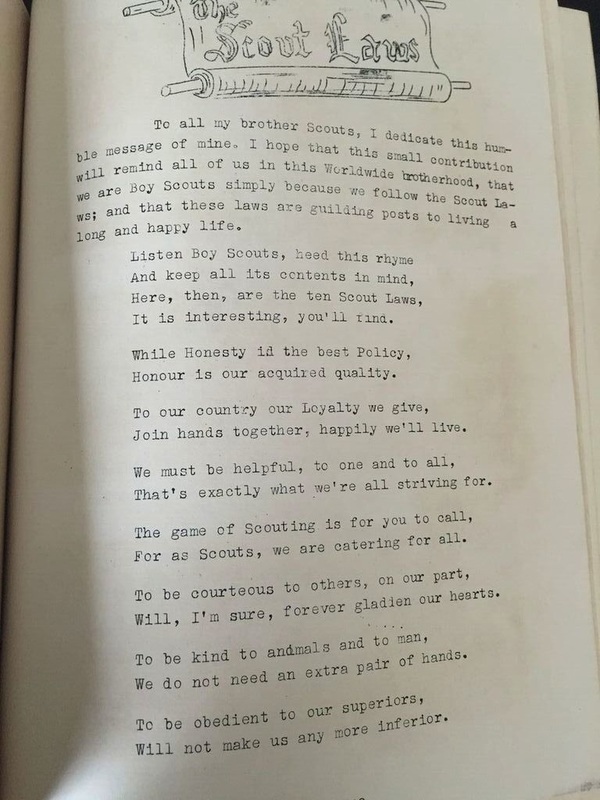 "When I was in primary school, I joined the Boy Scouts. 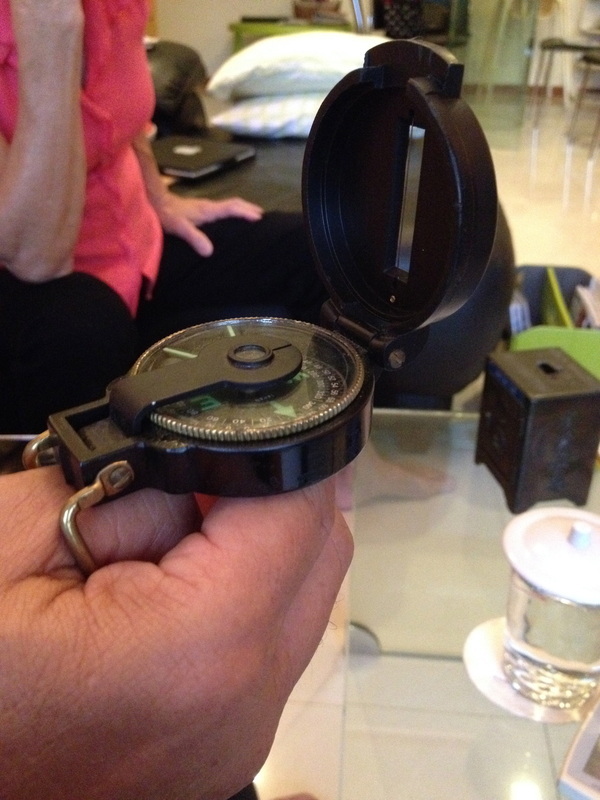 As a way of learning directions, I bought a simple compass which I have kept to this day." 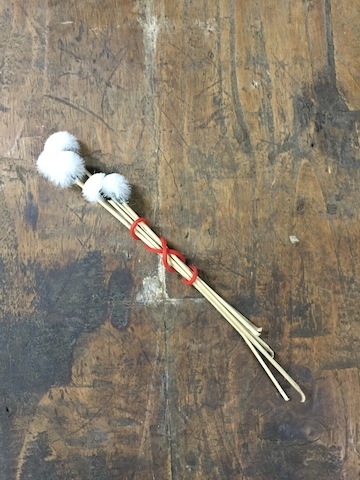 "I was Primary Four (when I was 10) and I needed to do a piece of art and I didn't know where my father got the bamboo stem but he got it for me for my art. He drew the picture of the house (top) and the bamboo shoot (bottom) on the stem and held my hand to carve it. He then held my hand to colour it. There is a moon there behind the trees and by the hill. I currently use it to put my calligraphy brushes." "One day in 1975, I went to visit my church friend and I saw a bunch of things that she wanted to throw away and saw the bag in there. I asked if she wanted to throw it and she said yes and I told her she was throwing gold away as it was pretty. I don't know when and where she had it. I have kept it till then and I don't use it as it is precious to me. I would need to wear something to match it and it is not easy to match. 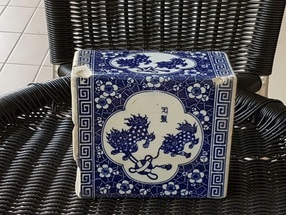 The print is of the Peranakan tiles." 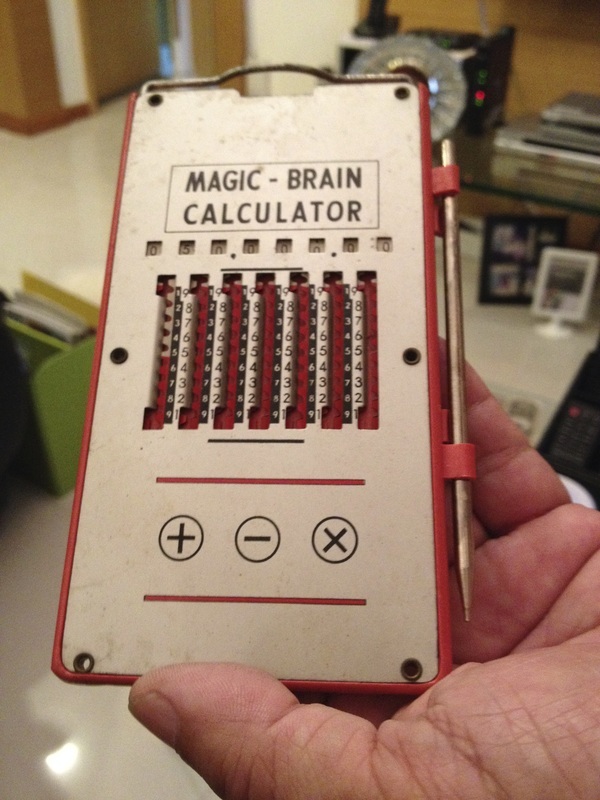 "The manual calculator was given to me by my father when I was in primary school. It has an addition and subtraction function. I hardly used it as I preferred doing it mentally or using the pencil and paper method. 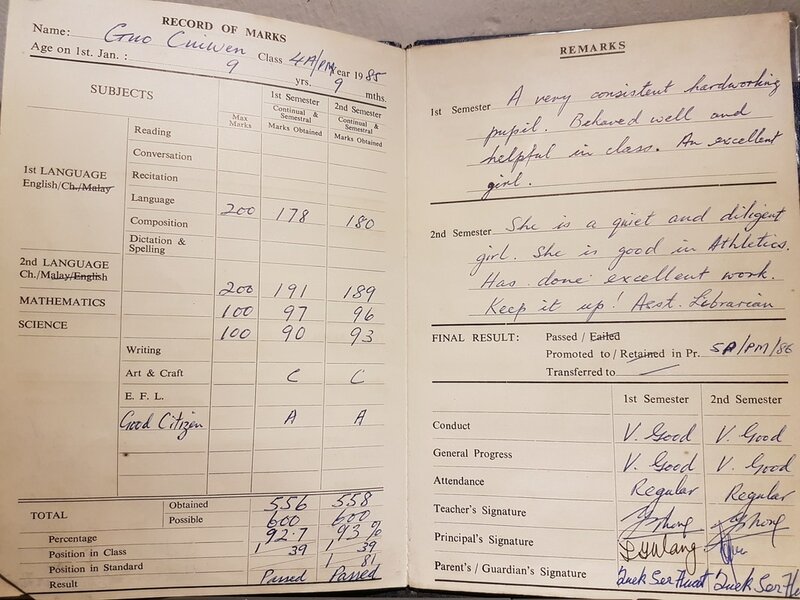 I had kept it with the intent to show it to the future generations, unaware that in my generation I could see the emergence of IT and the powerful use of the electronic calculators and software like Excel, etc." 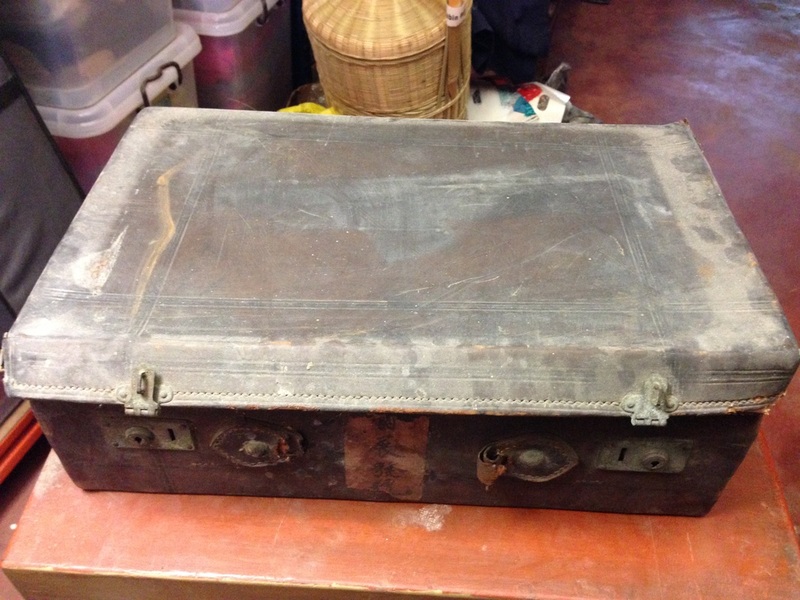 "This was the dowry given to my mother-in-law by her mother over 80 years ago. When my in-laws passed away, it came into my possession and I decided to keep them. My husband had passed a collection of stamps to one of his nephews, which was passed down from my husband's father. It was a pity that they went missing later. 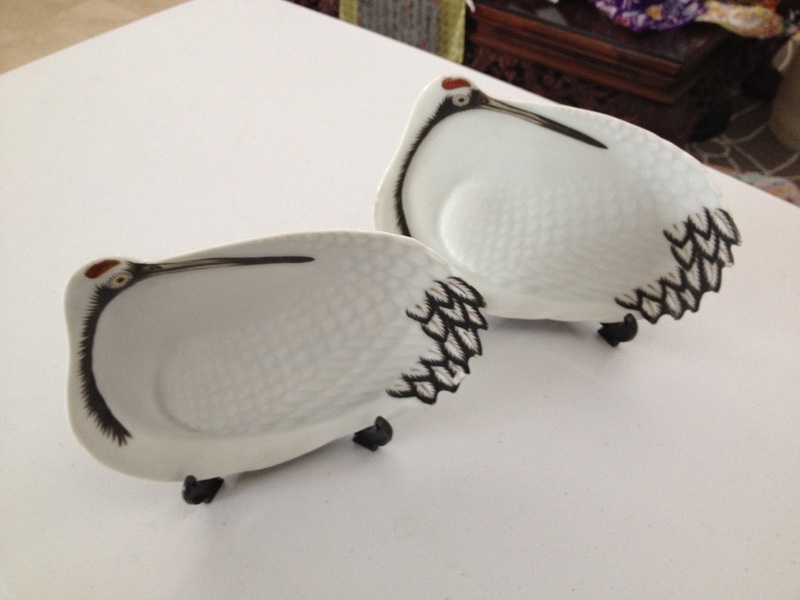 That is why this pair of porcelain crane plates means a lot to me now." 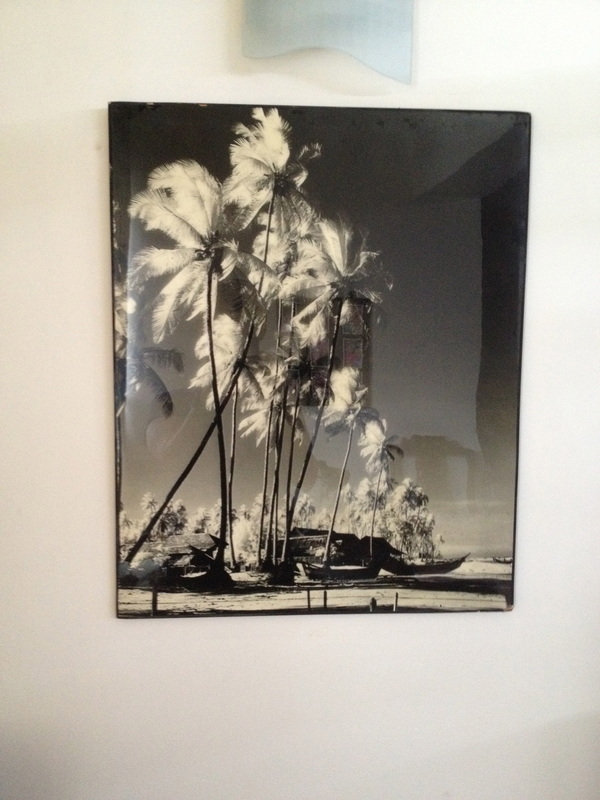 "This picture was taken by my husband in 1956 of the Kota Bharu (Malaysia) beach. It is significant as it was after I got married and this was the first time, I went back to Kota Bharu to visit my relatives and family. I had gone to visit a relative who lived by the beach. The picture was taken by camera which was bought around the 1950s. The photo was entered in a global photography competition but it didn't win."